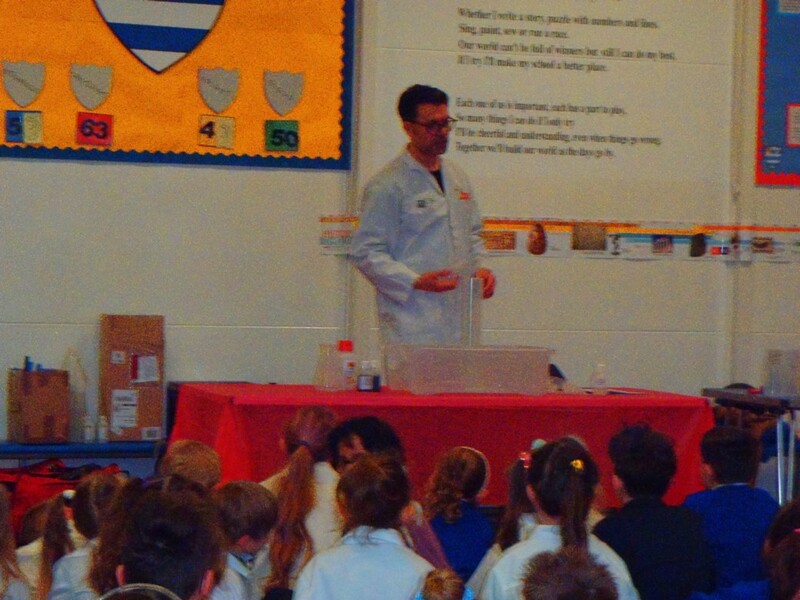 At Stanford School we hope to inspire the children through our Science teaching. 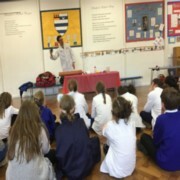 Science provides the foundations for understanding the world through the specific disciplines of Biology, Chemistry and Physics. 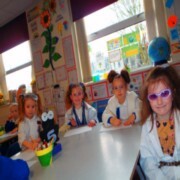 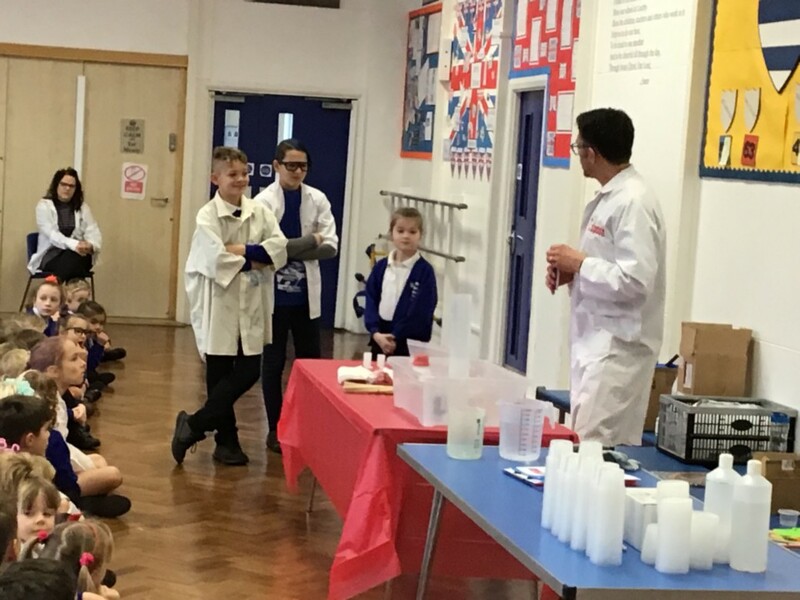 Science has changed our lives and is vital to the world’s future prosperity, and all pupils should be taught essential aspects of the knowledge, methods, processes and uses of science. 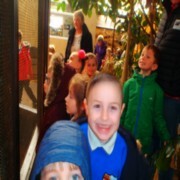 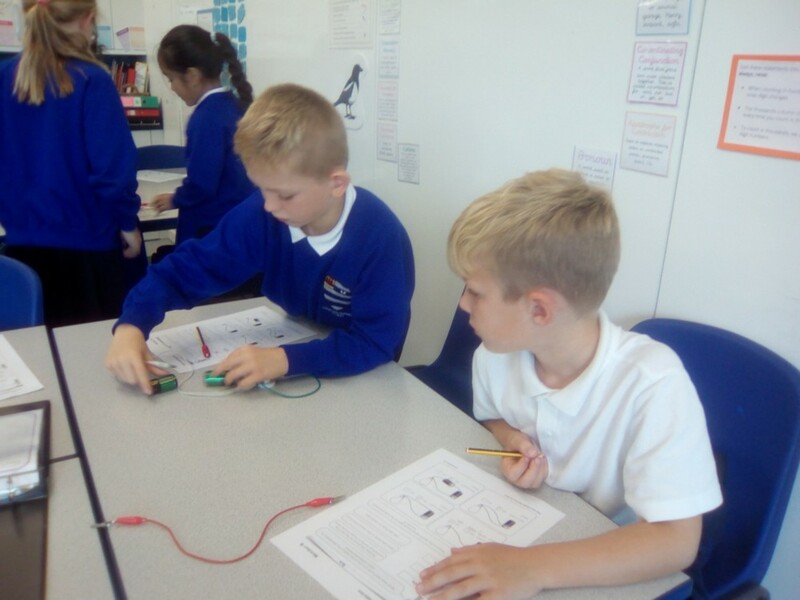 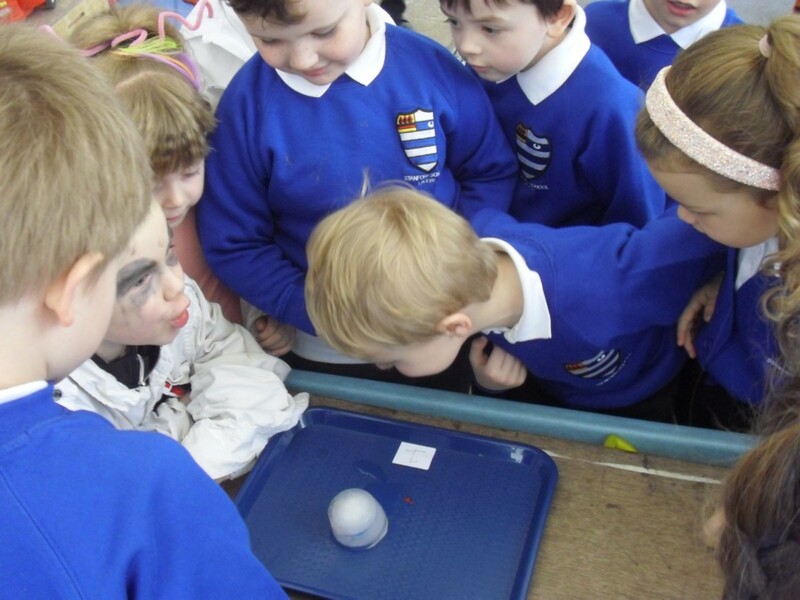 Through building up a body of key foundational knowledge and concepts, pupils should be encouraged to recognize the power of rational explanation and develop a sense of excitement and curiosity about natural phenomena. They should be encouraged to understand how science can be used to explain what is occurring, predict how things will behave, and analyse causes. 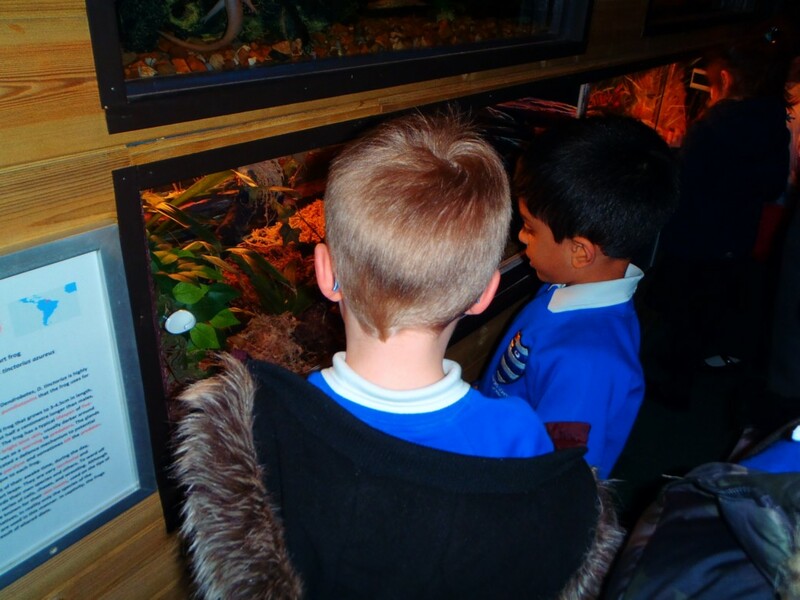 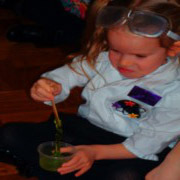 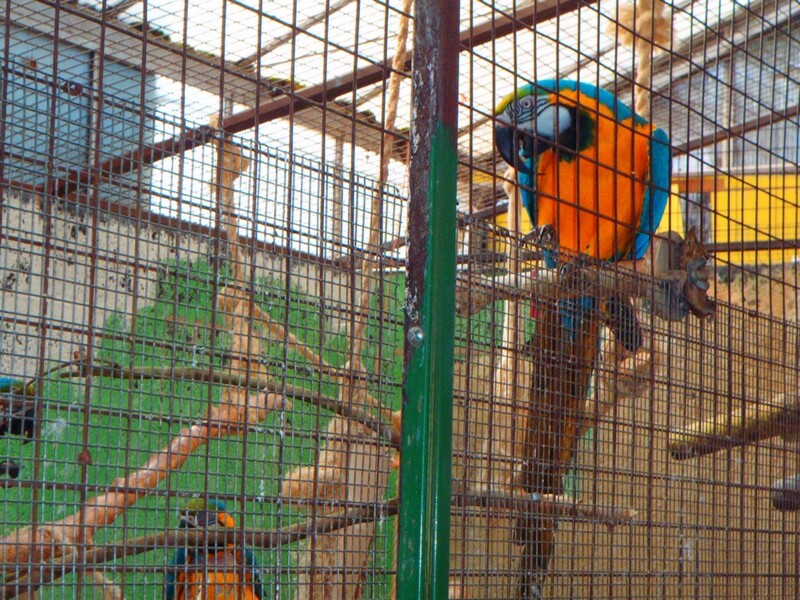 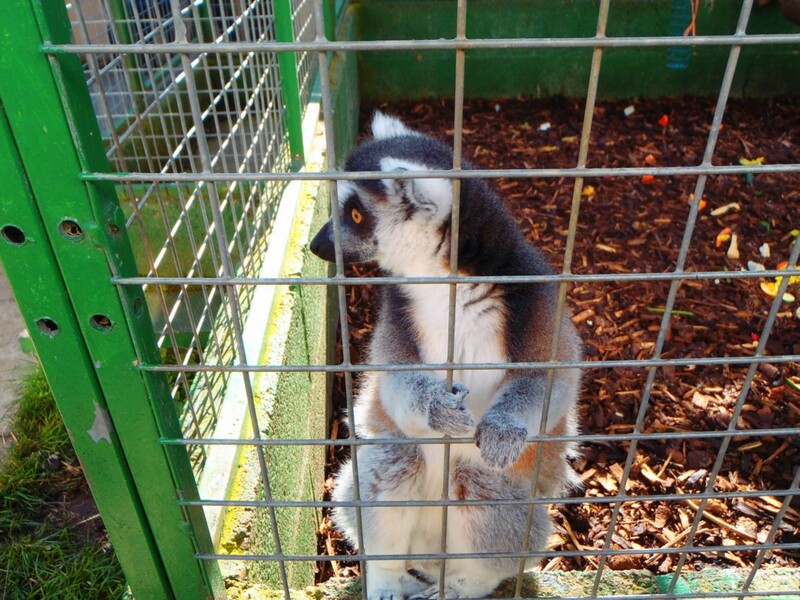 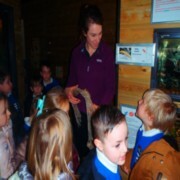 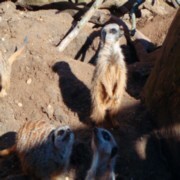 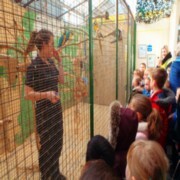 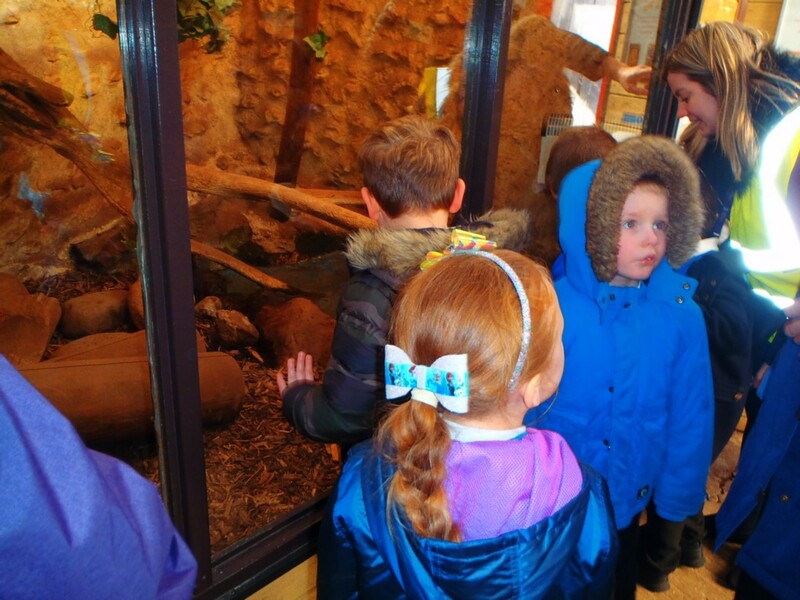 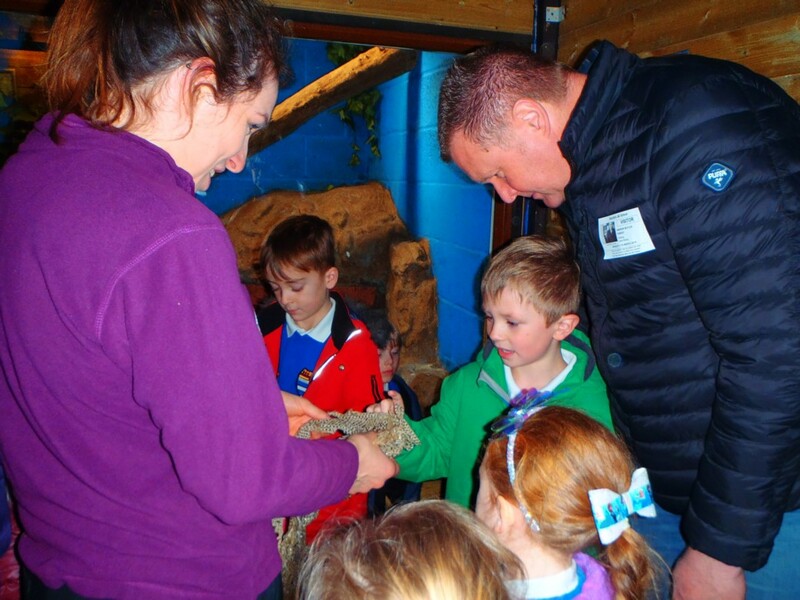 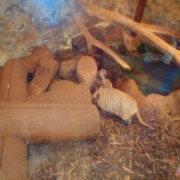 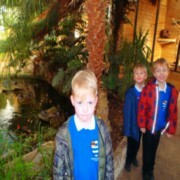 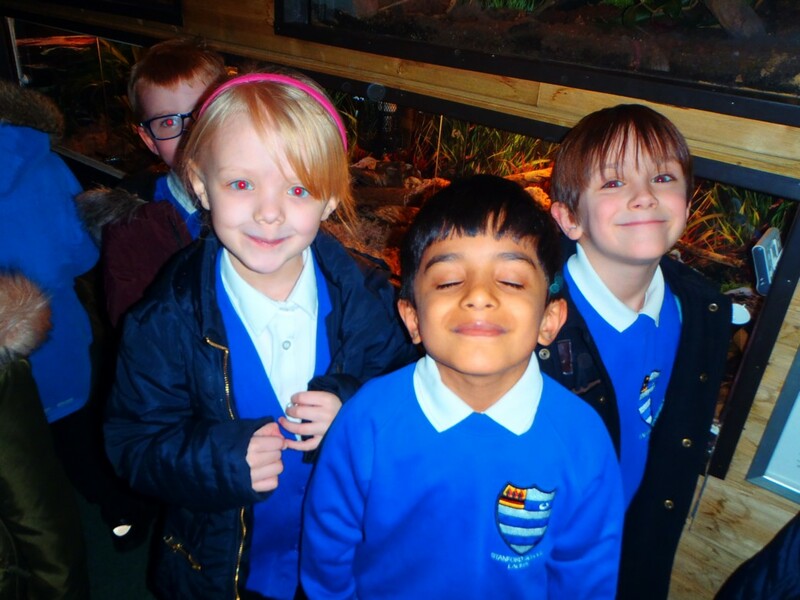 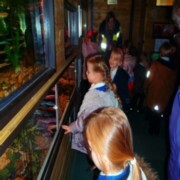 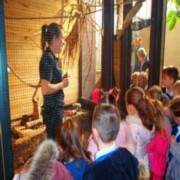 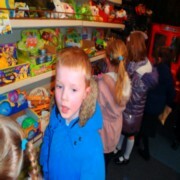 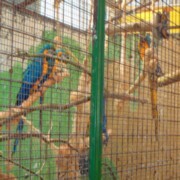 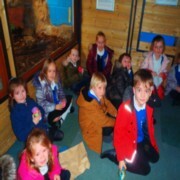 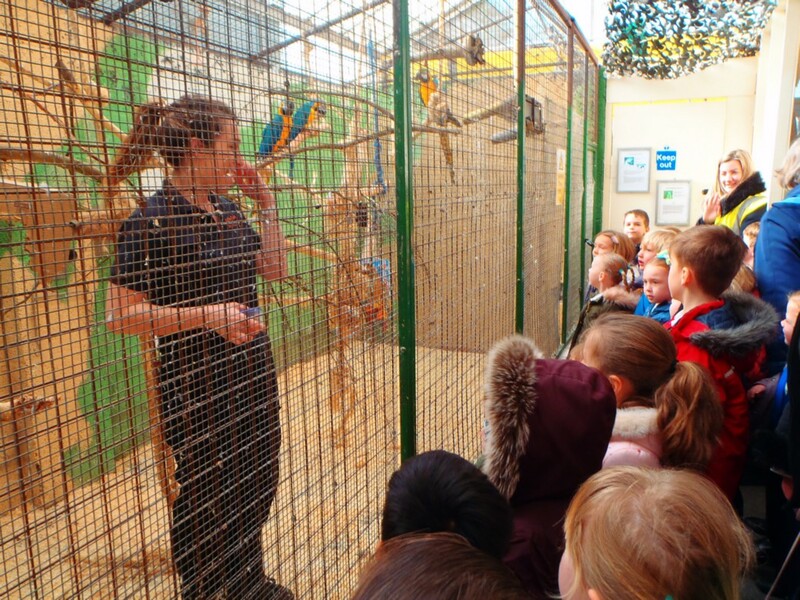 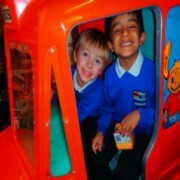 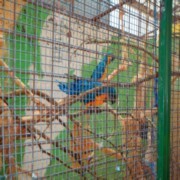 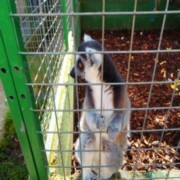 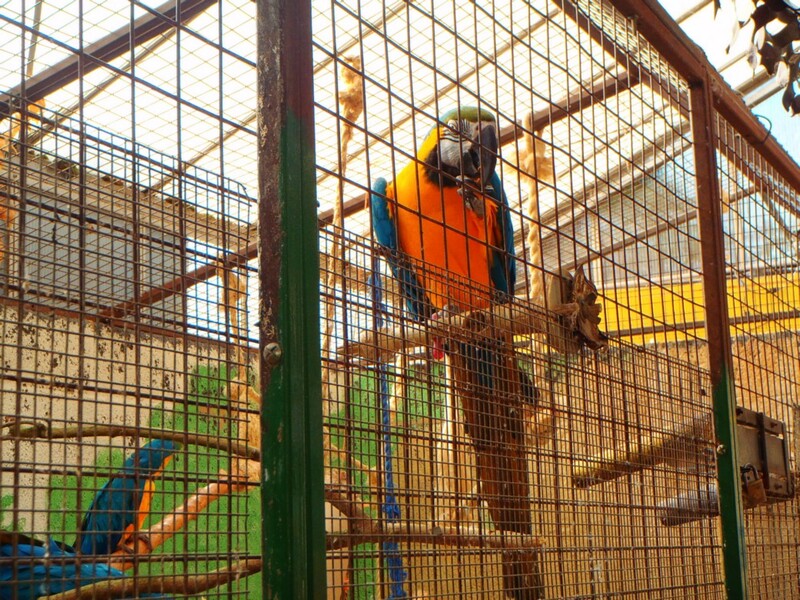 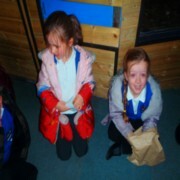 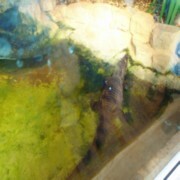 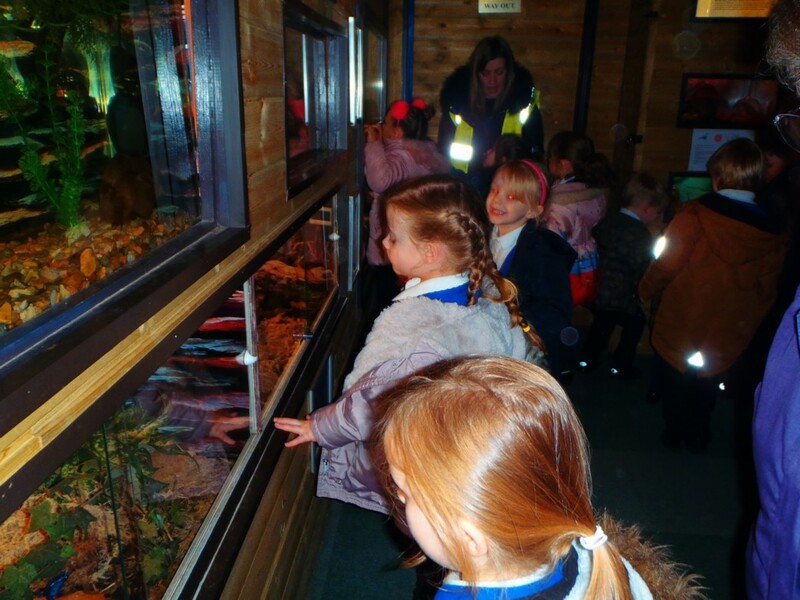 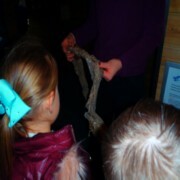 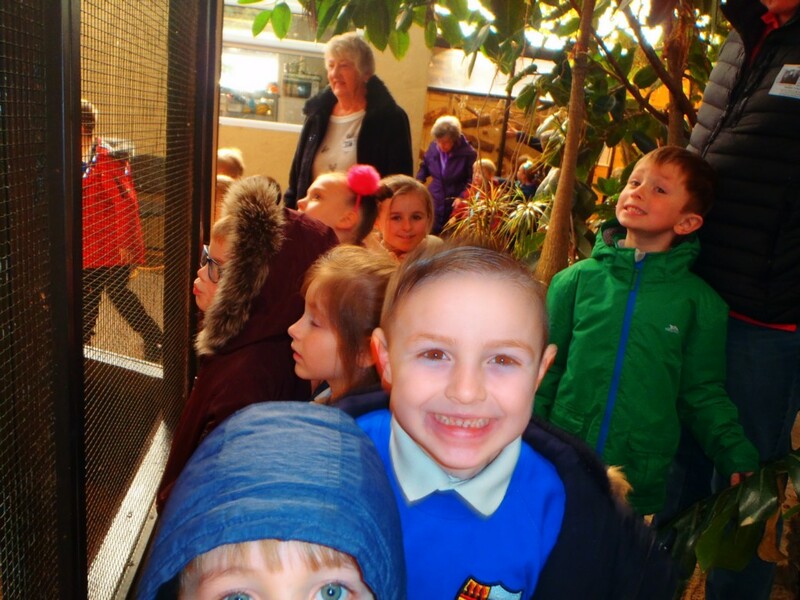 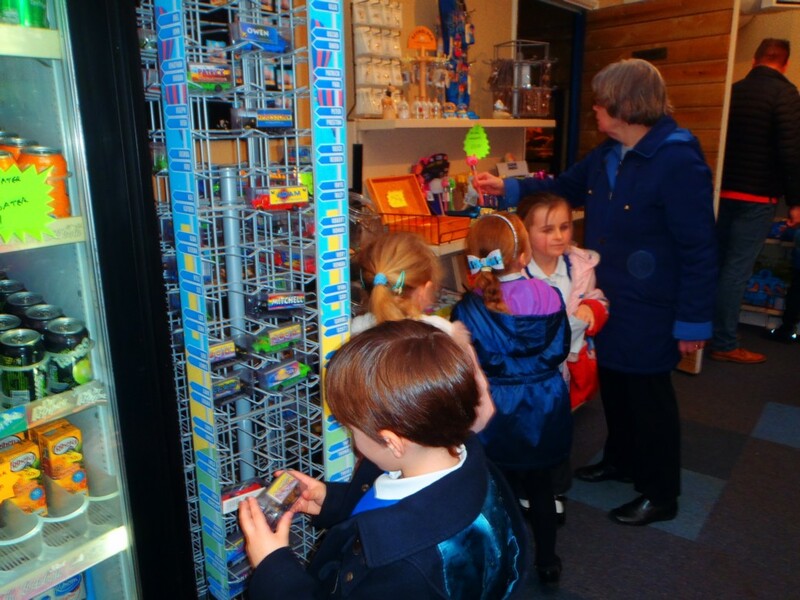 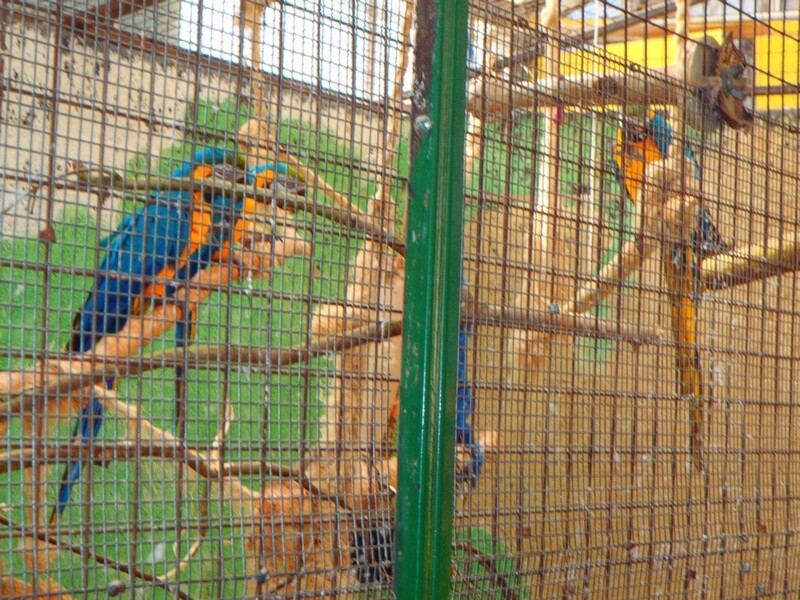 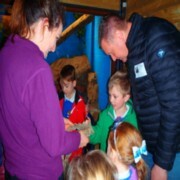 The children’s knowledge is enhanced by visitors, school trips to places linked to Science as well as scientific days. 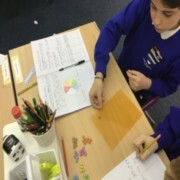 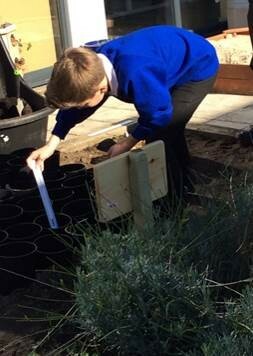 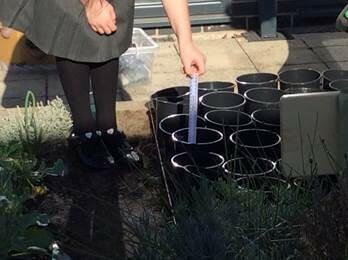 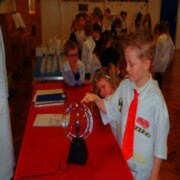 As much as possible the whole school environment is used to maximum potential in order to support the delivery of the Science curriculum. 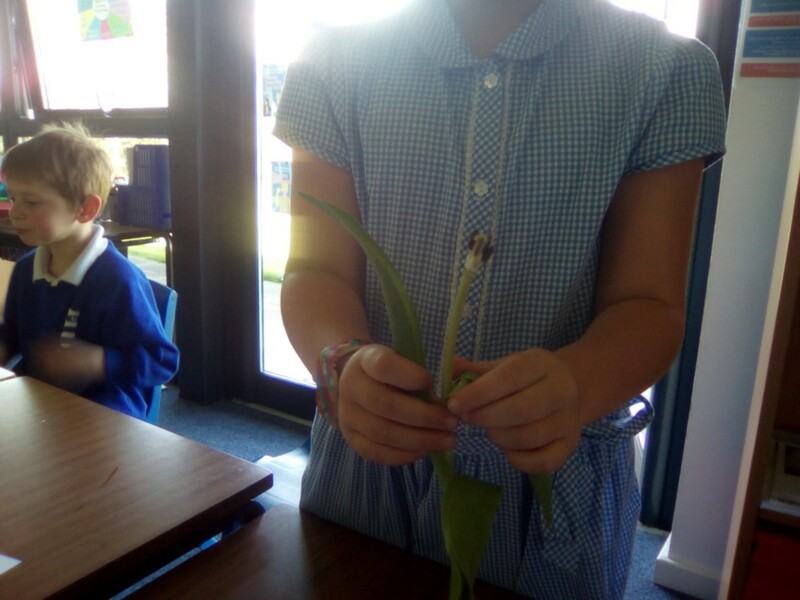 Can I set up an investigation on water transportation in plants? We all set up our own investigation. We carefully measured out food colouring to put into the water and stood our flower in it. 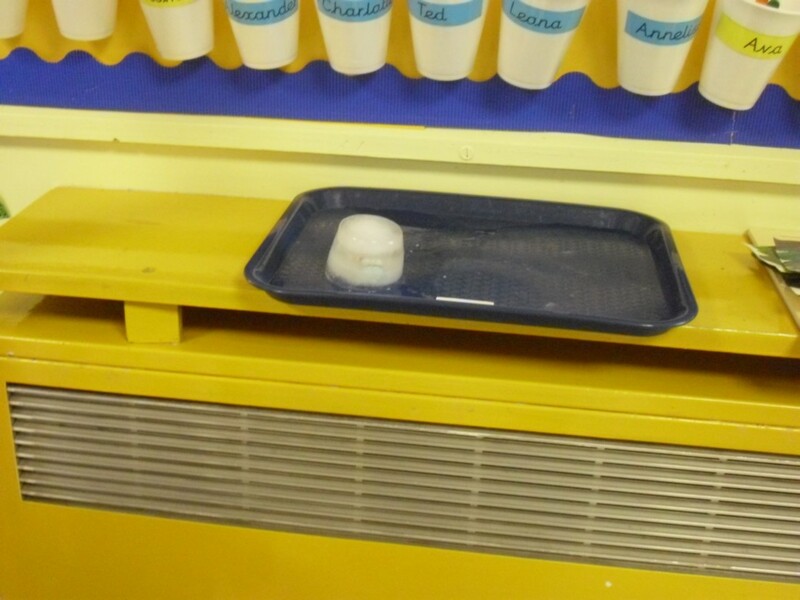 We then thought about where we could leave it to test if the temperature would affect the rate of transportation. We decided to leave one in a cool place, one in a warm place and one at room temperature. 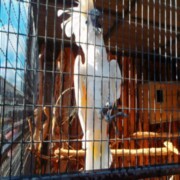 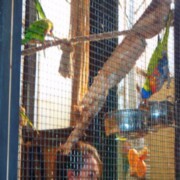 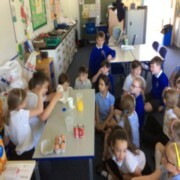 We had lots of fun doing this! 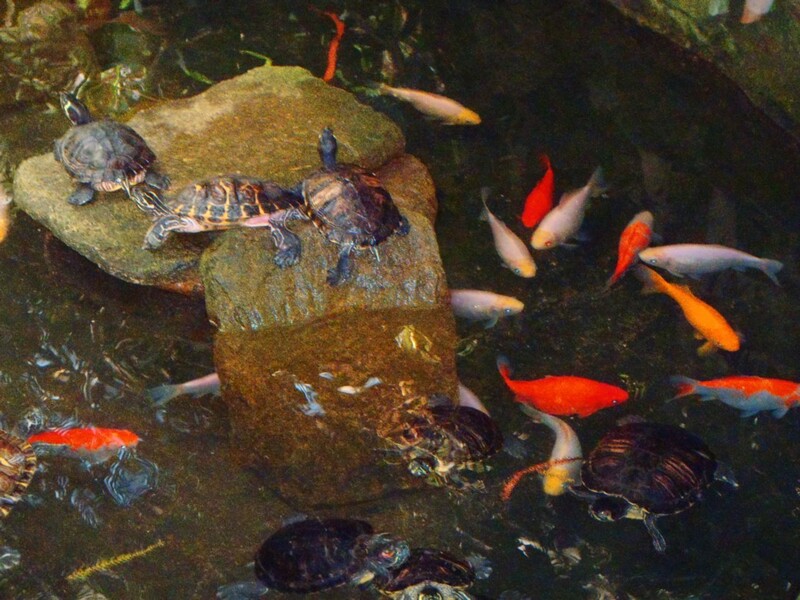 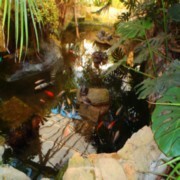 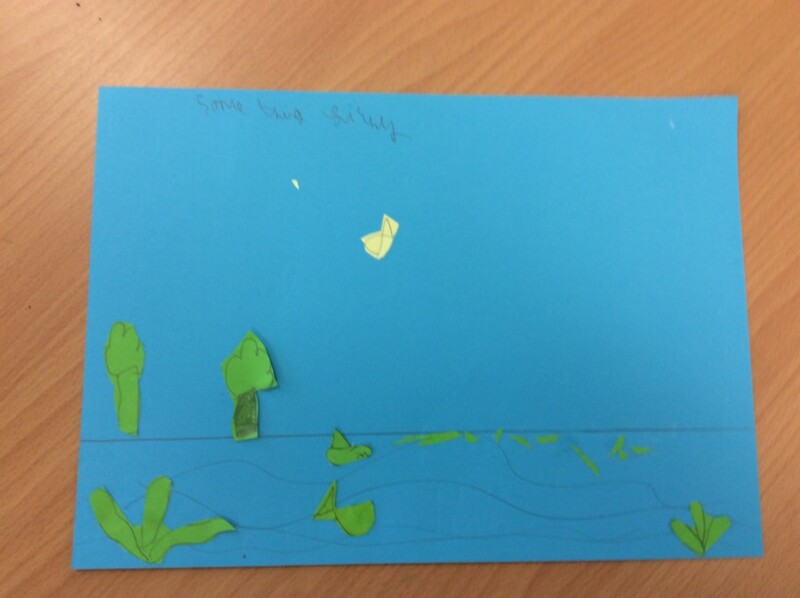 Can I model water transportation in plants? 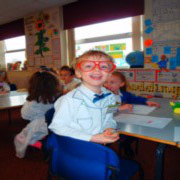 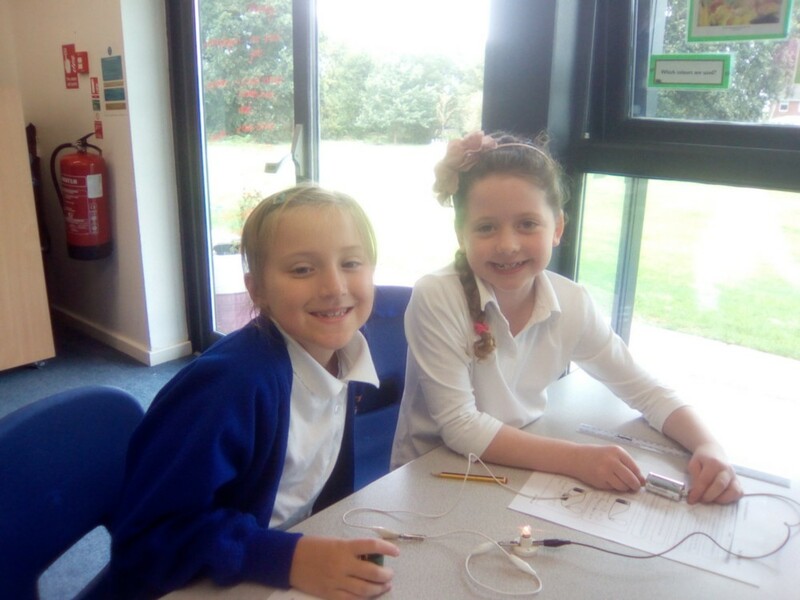 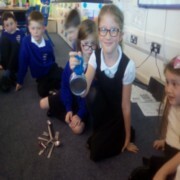 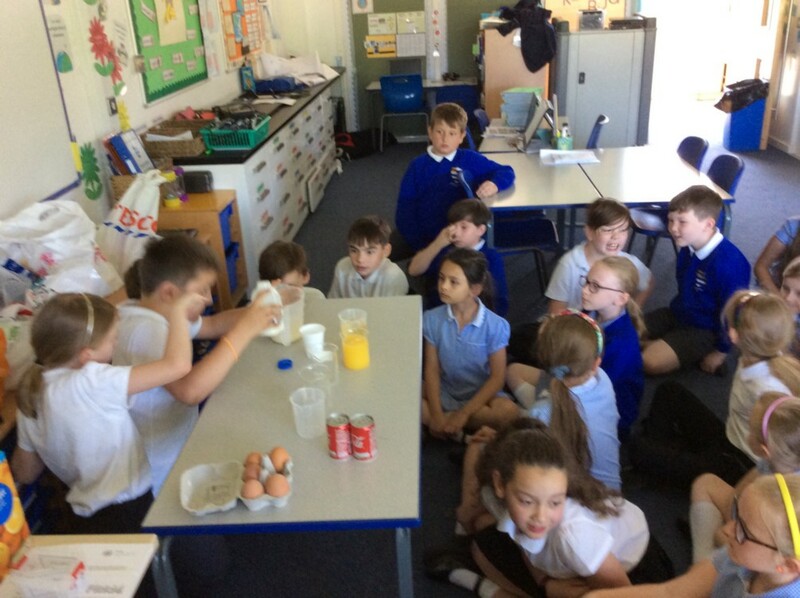 We had great fun in science! 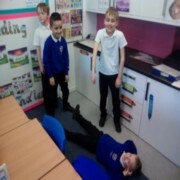 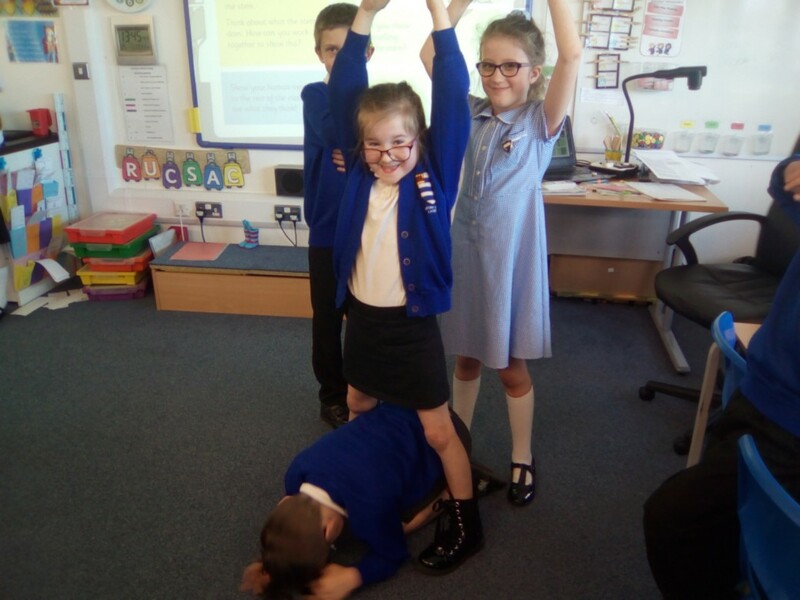 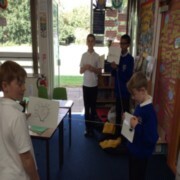 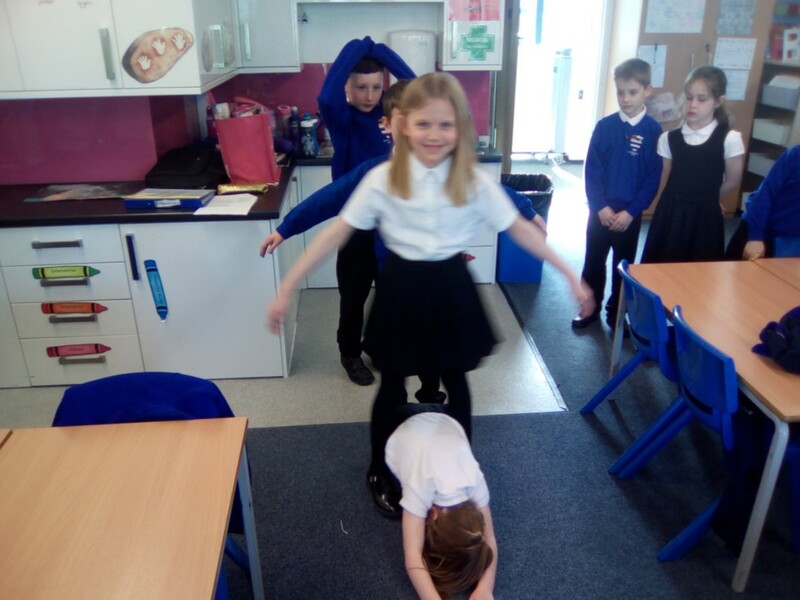 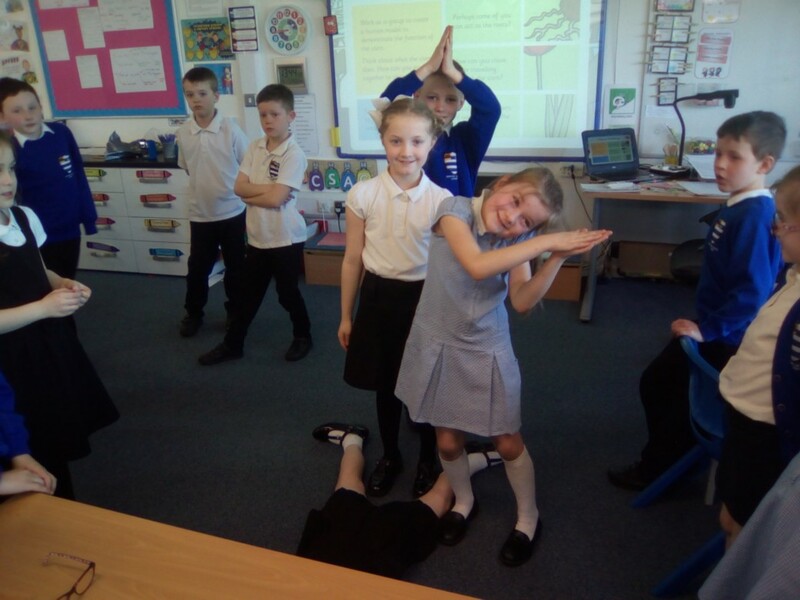 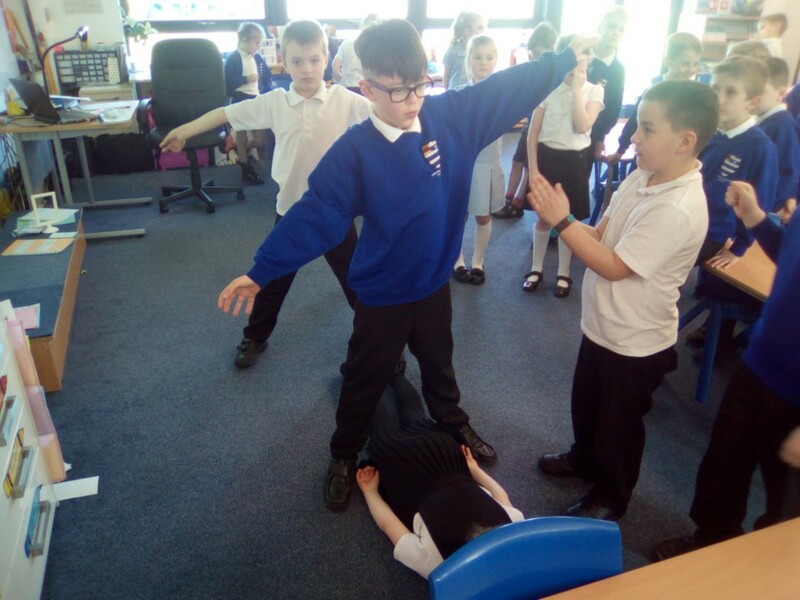 We used our bodies to recreate the job of the stem and tell the class how water gets through the plant. 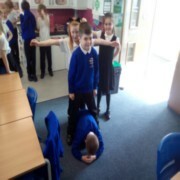 We all had different ideas on how we could show this. 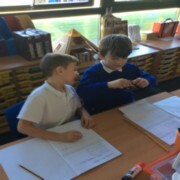 Can I identify the properties of rocks? 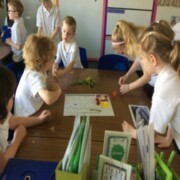 LQ: Can I investigate how light enables us to see colours? 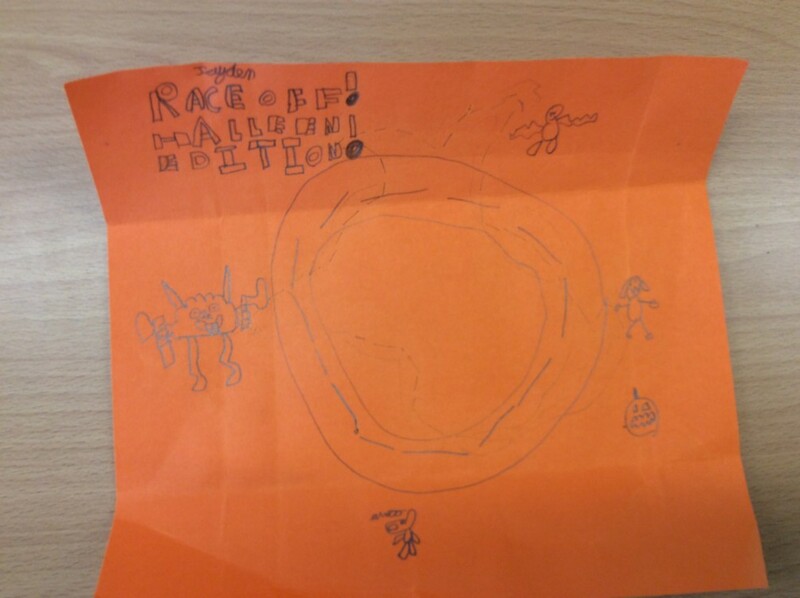 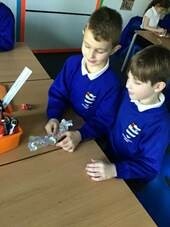 Can I create a game using magnetism? 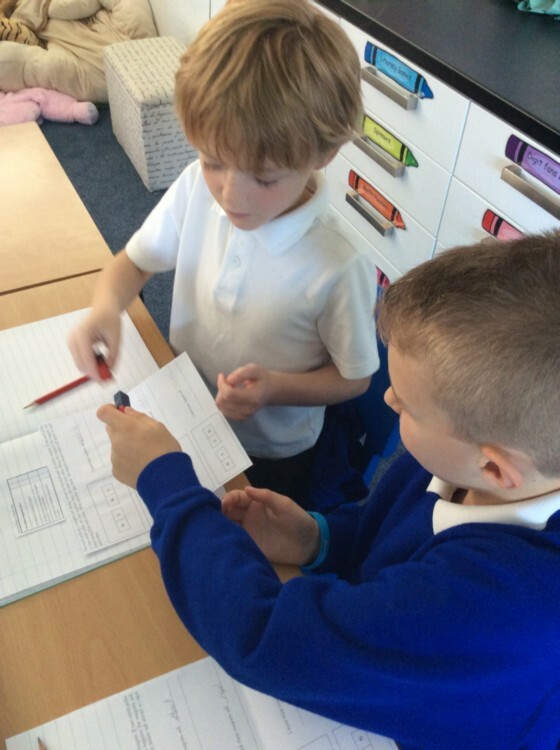 Can I explore Magnetic Poles? Can I investigate the strength of different magnets? LQ: Can I explain how we see things and how light travels using a model and scientific language? 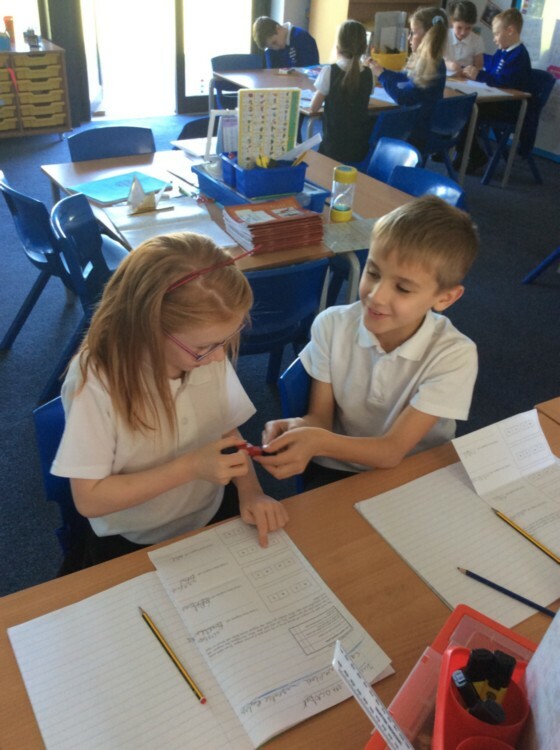 Can I investigate the effects of friction on different surfaces? 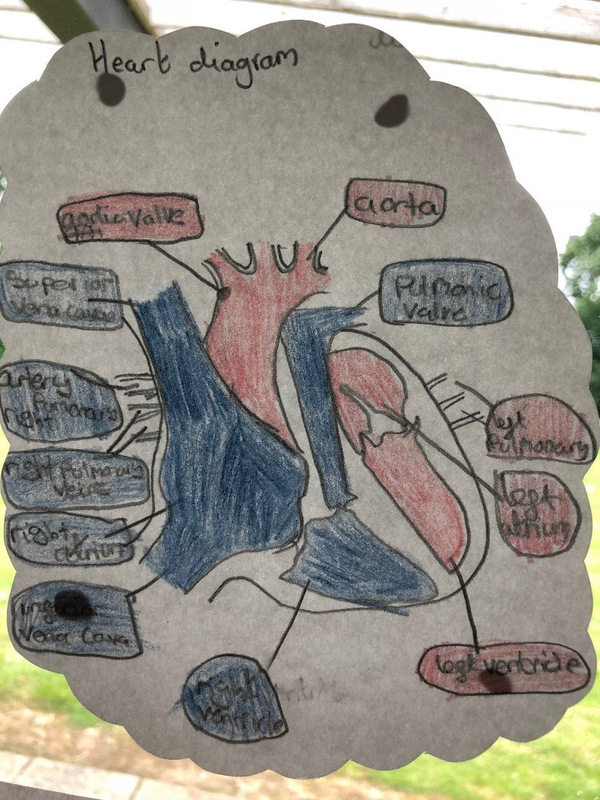 Can I identify parts of the circulatory system? 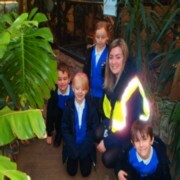 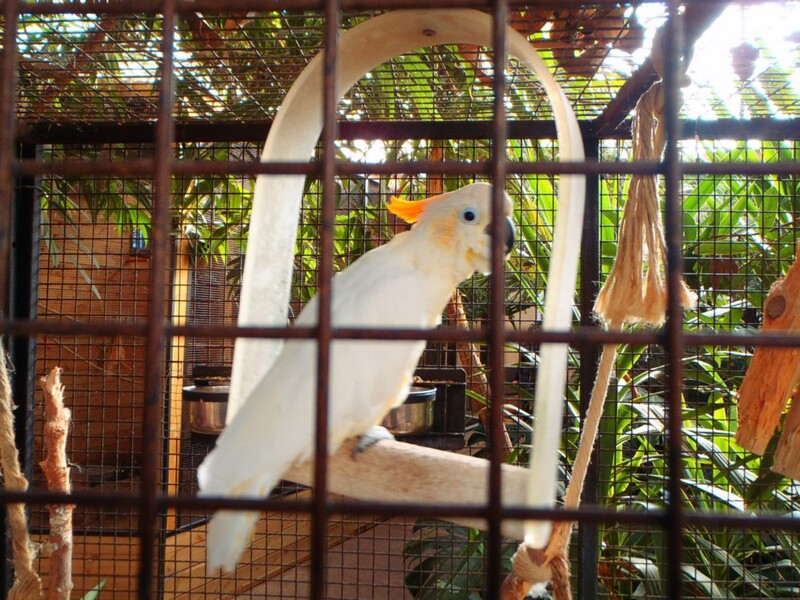 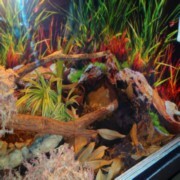 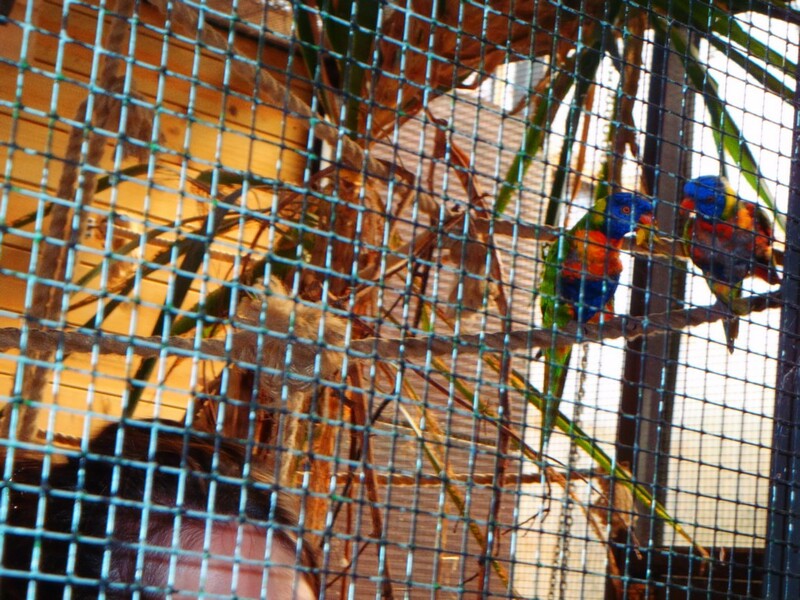 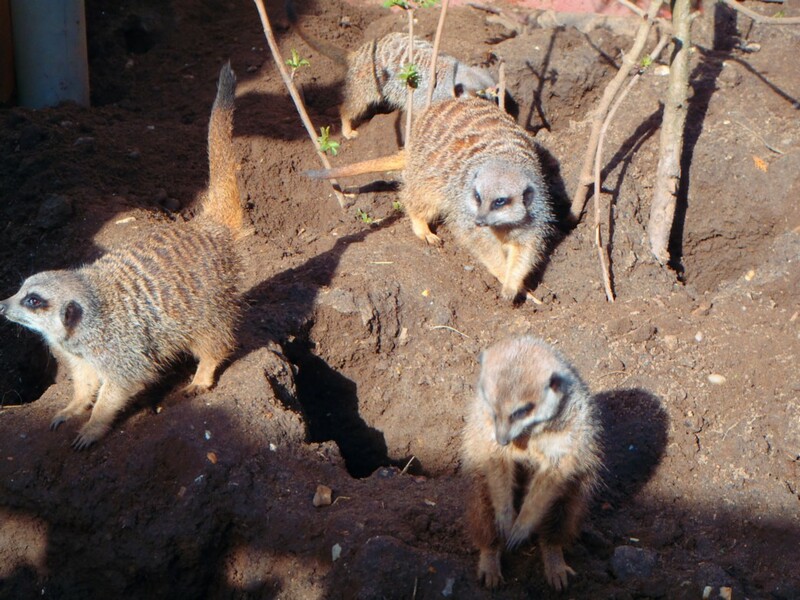 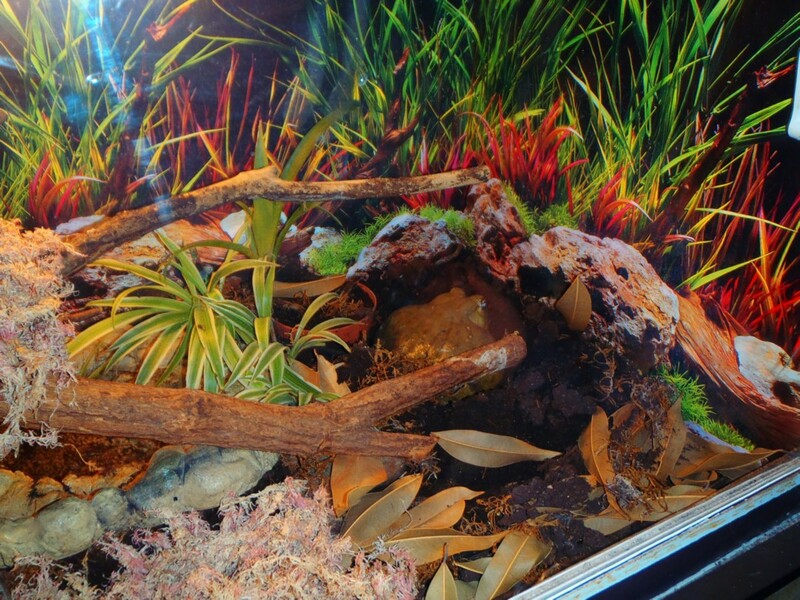 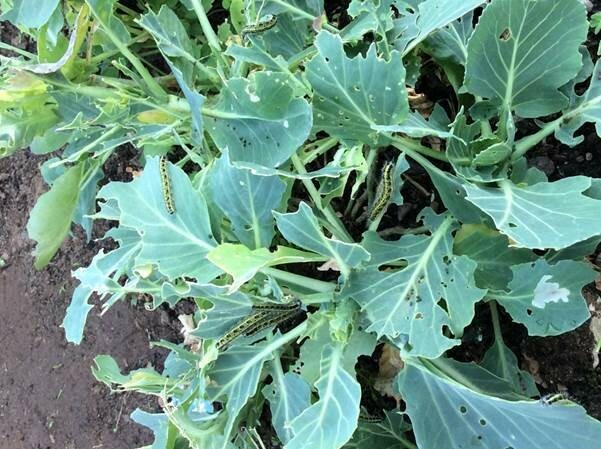 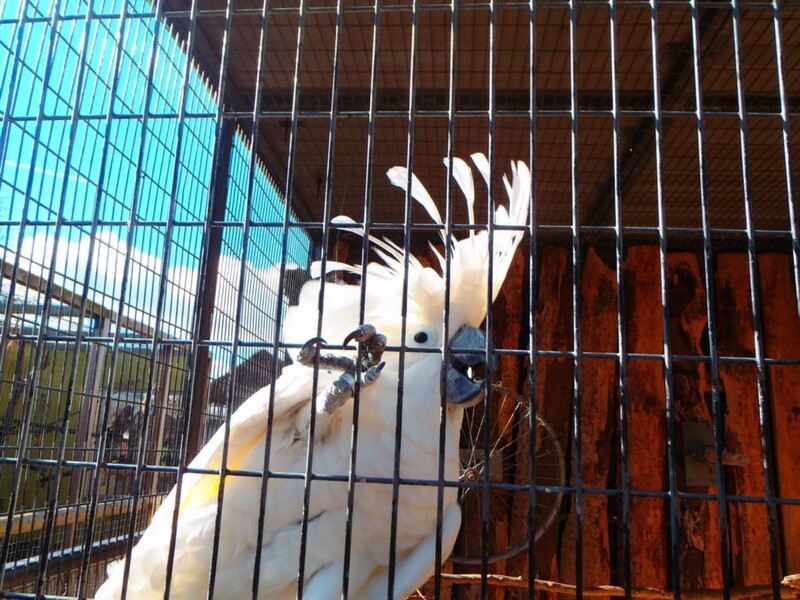 Can I identify and name a variety of plants and animals in their habitats? 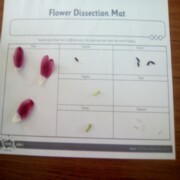 Can I classify and sort these into different categories? 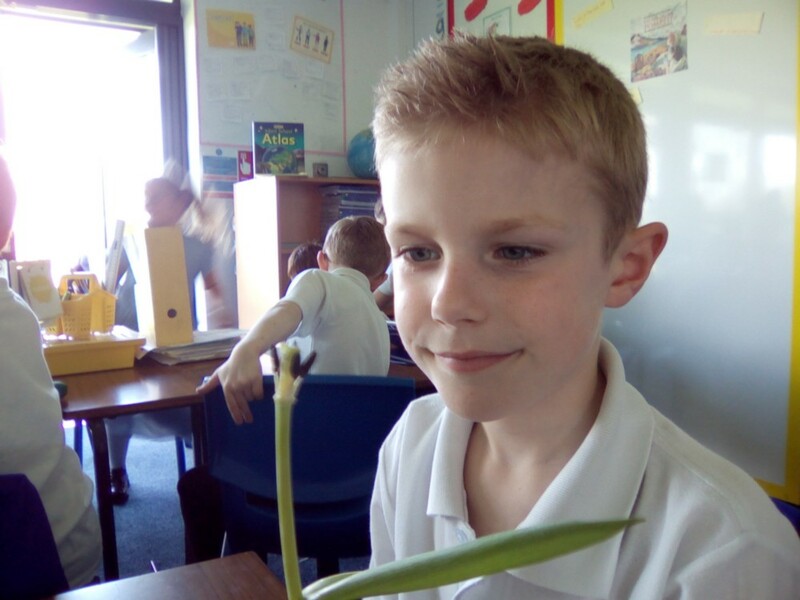 Can I explain the life processes and how these processes can tell us if something is living, dead or has never been alive? 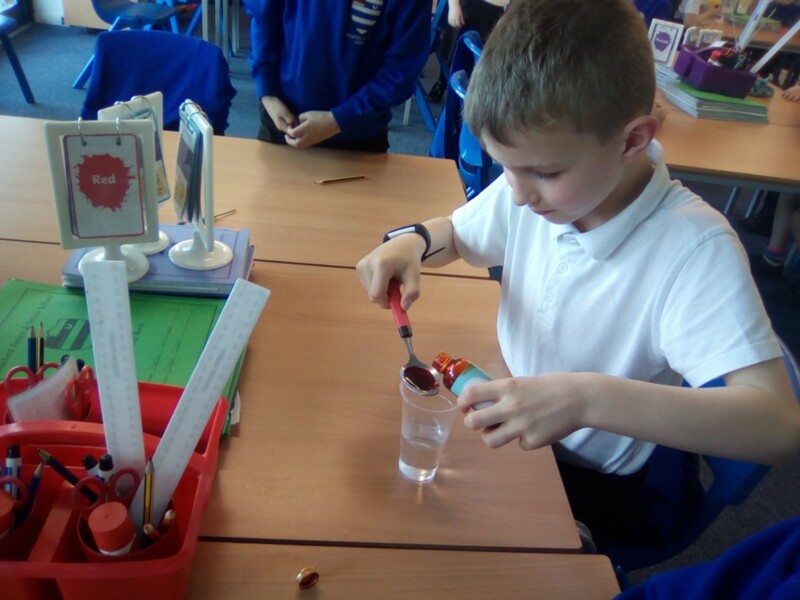 Can I learn about tooth decay and create an investigation to investigate the effects different liquids have on our teeth? 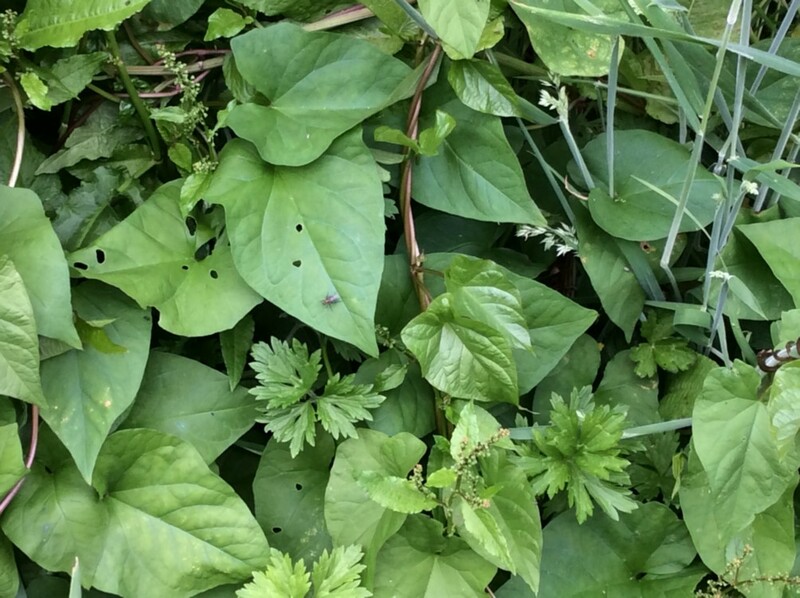 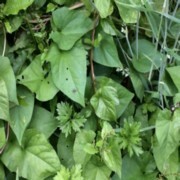 Can I identify the different parts of a flowering plant? 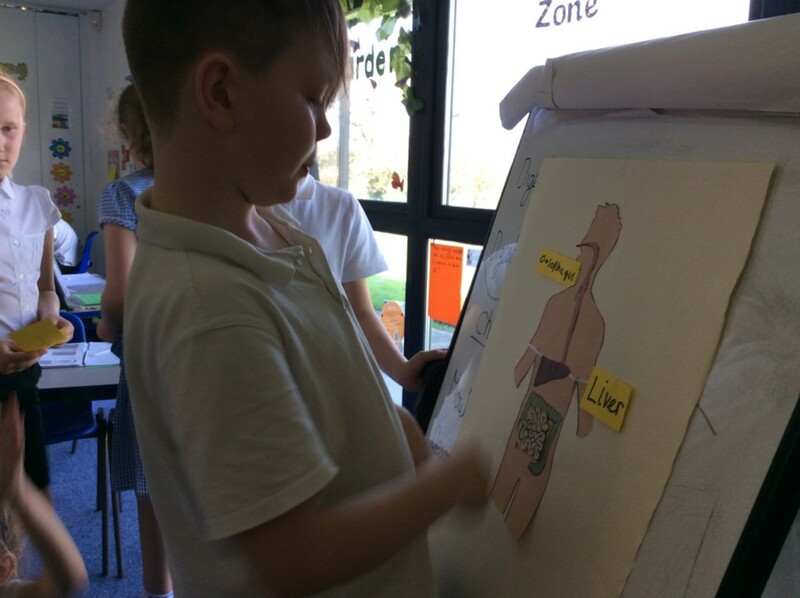 LQ: Can I Identify and name parts of the human digestive system? 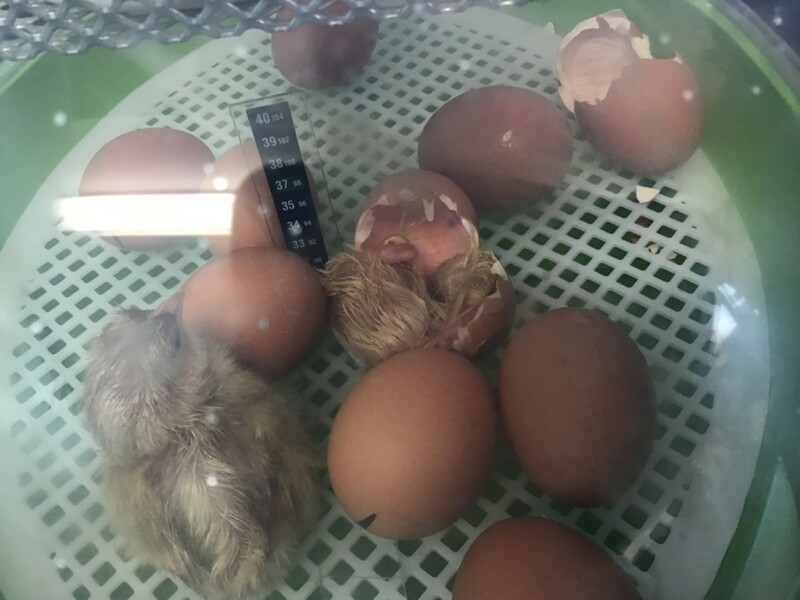 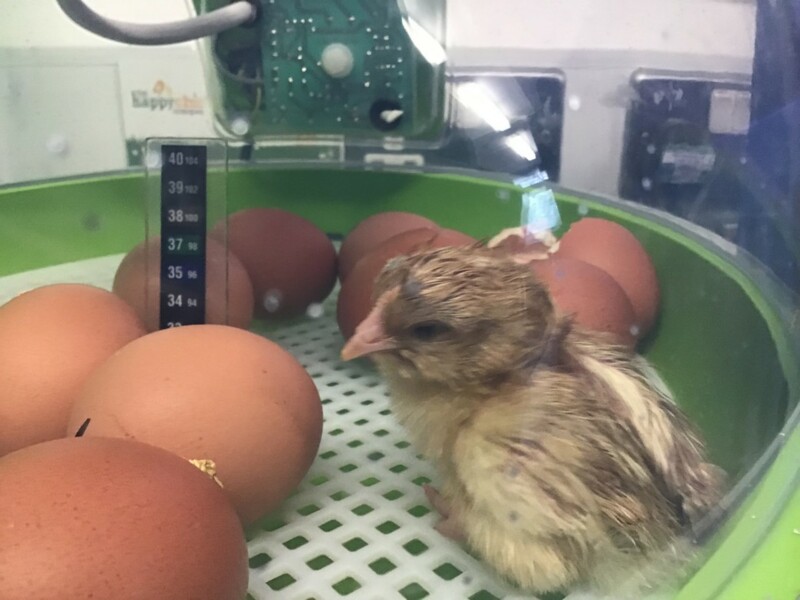 Miss Perrin had a surprise when she arrived into work as our first chick had already arrived and was waiting to greet her! 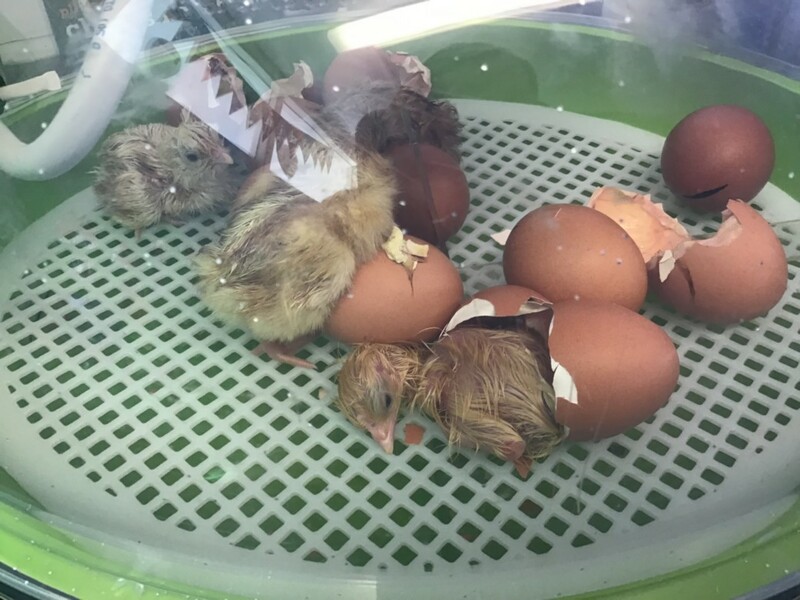 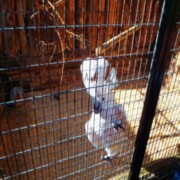 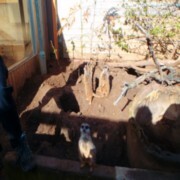 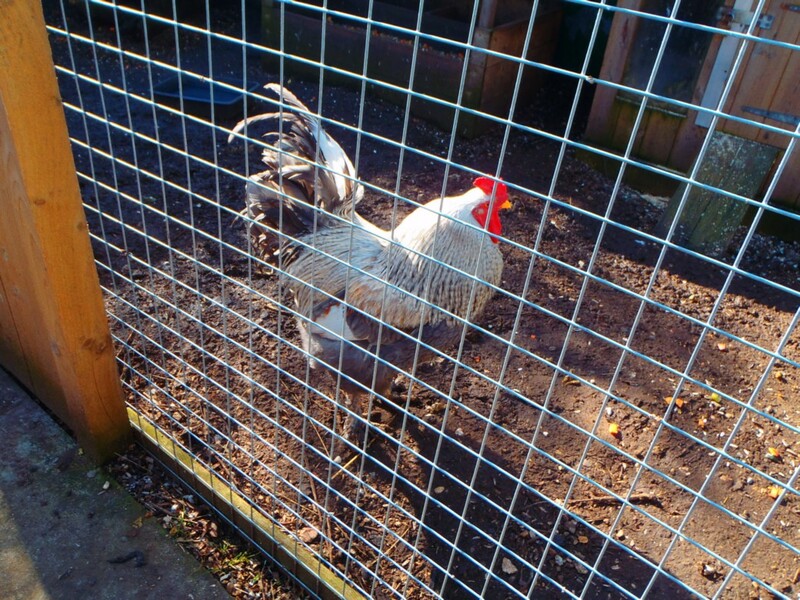 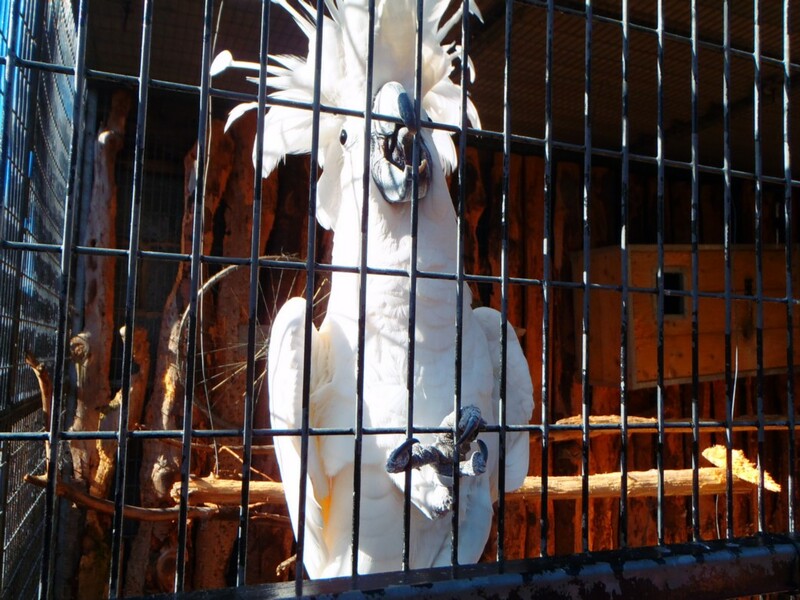 Miss Watkinson, one of our site team, was the first to find the chick so she named it……Shellock Holmes! 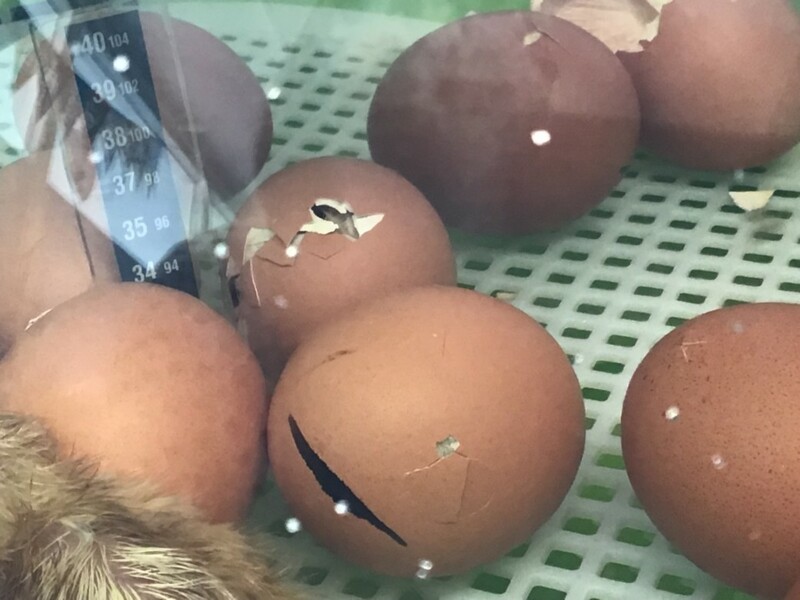 What an apt name as the chick was very keen to investigate the mystery of what was in the rest of the eggs and helped them escape. 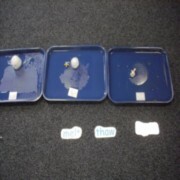 And so started our theme of ‘cel-egg-brity’ names! 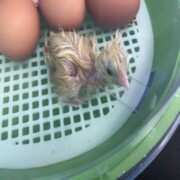 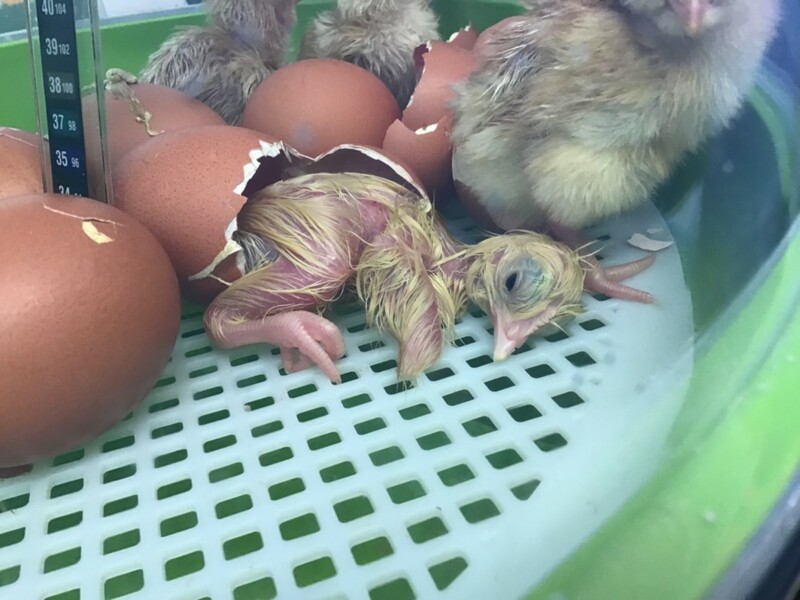 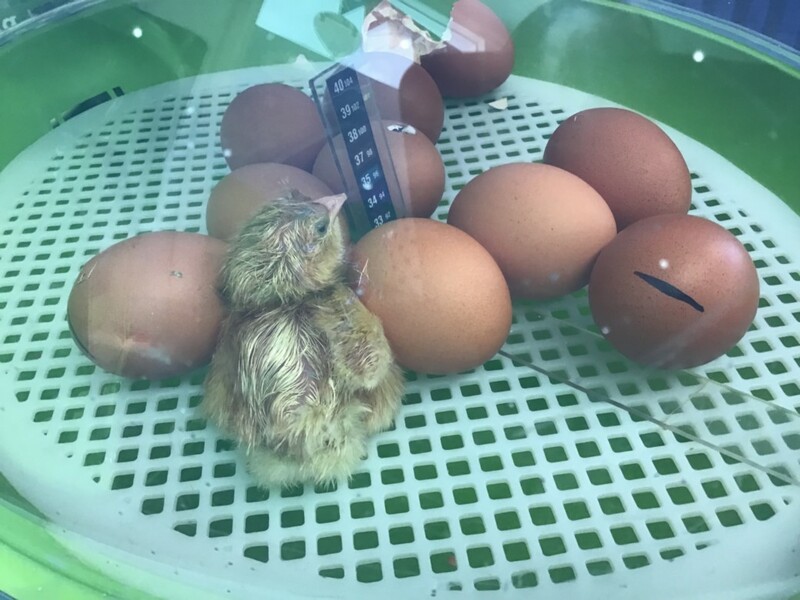 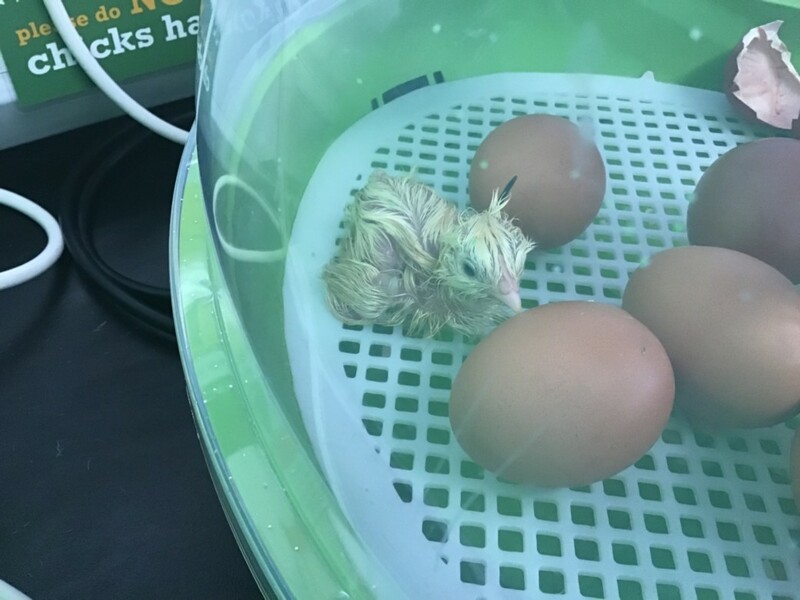 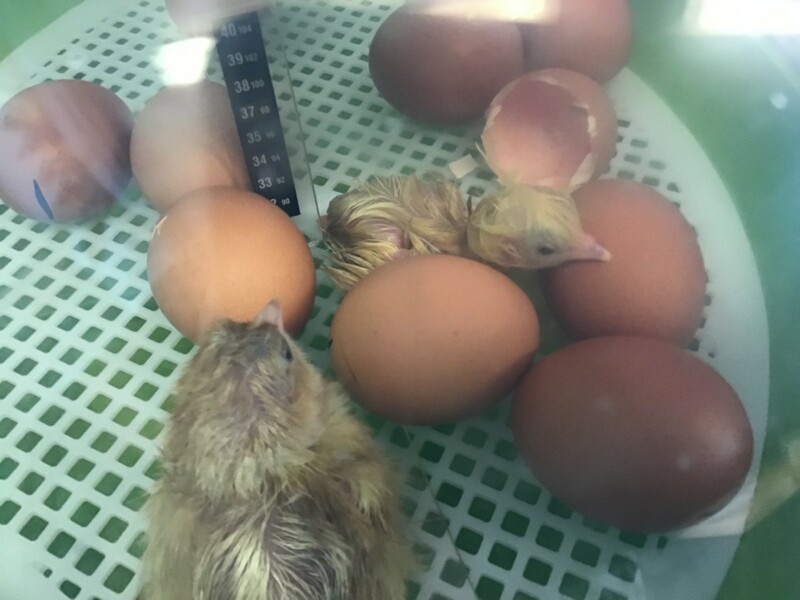 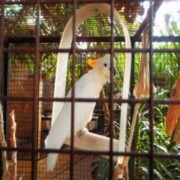 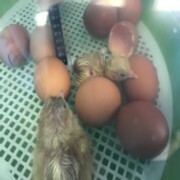 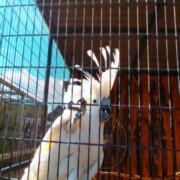 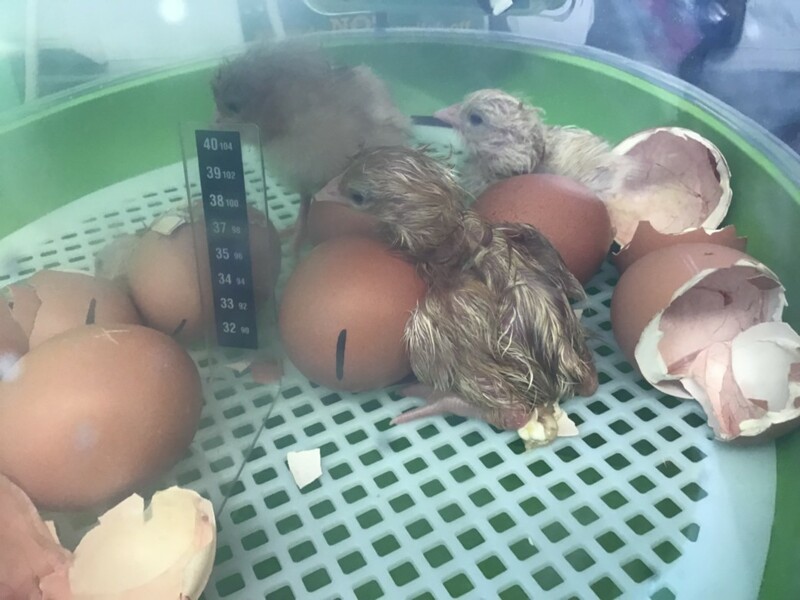 The next chick arrived during the first lesson. 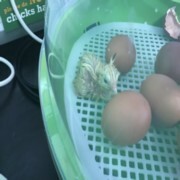 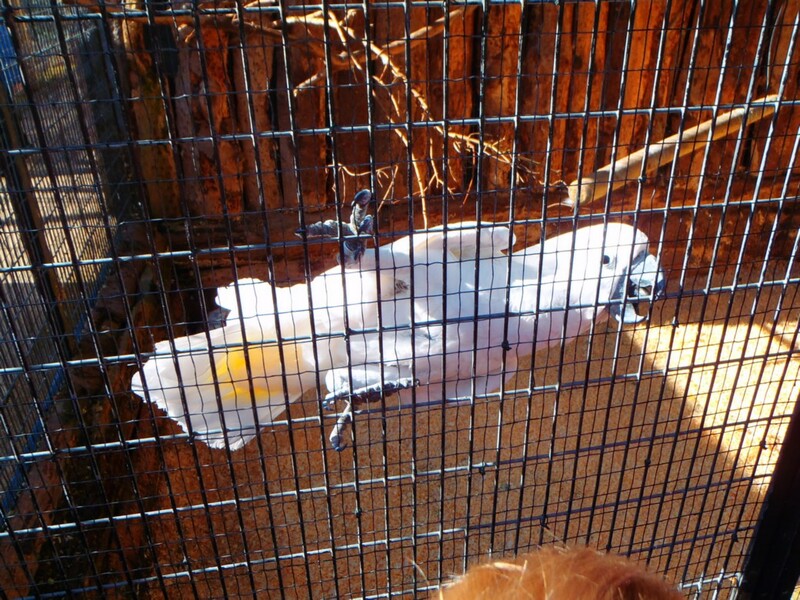 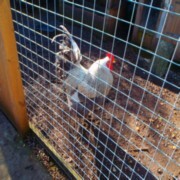 It was named ‘Egg Sheerhen’ due to its quiff of feathers. 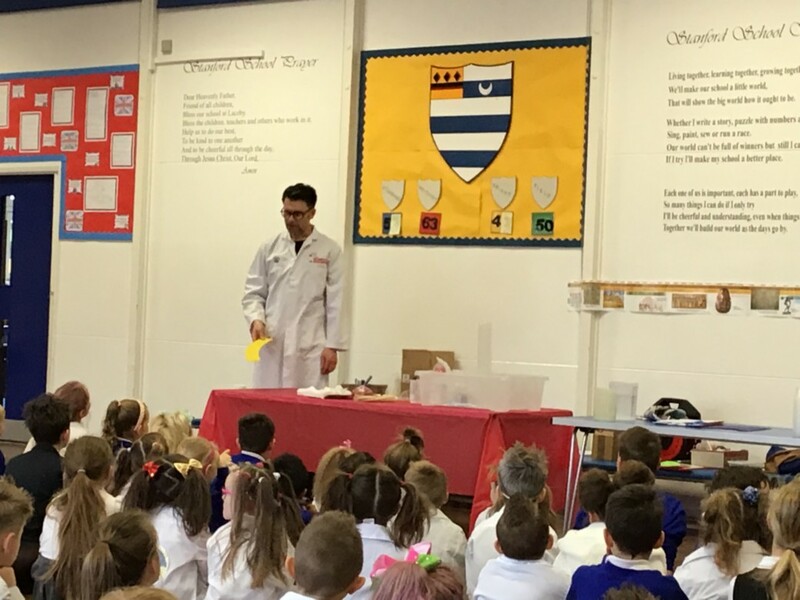 Today, as part of Science day, we listened to a scientist who showed us different science experiments in our school assembly. 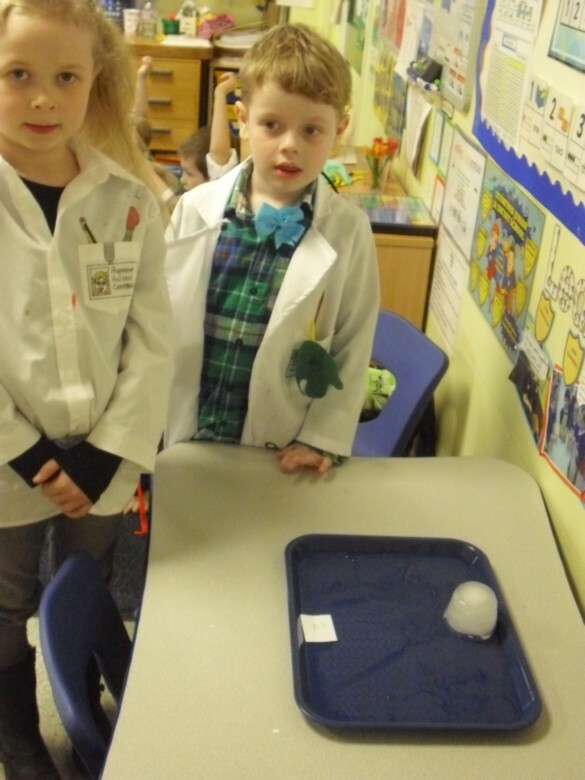 Back in the classroom we carried out our own experiment and used our eyes and hands to help us observe changes to three blocks of ice. 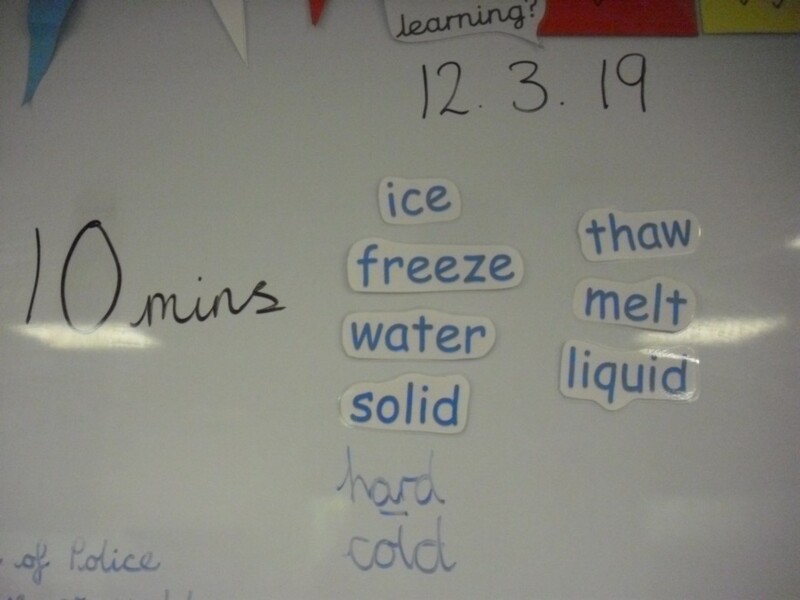 We placed the ice in different places - outside, inside on the table and inside next to the radiator and observed the changes every 10 minutes. 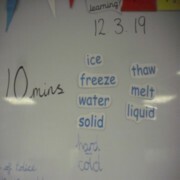 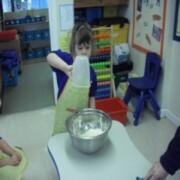 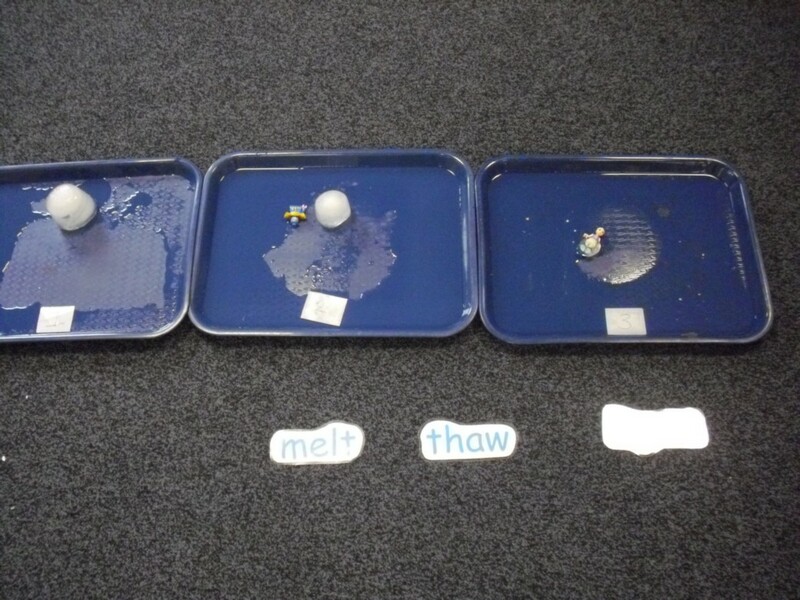 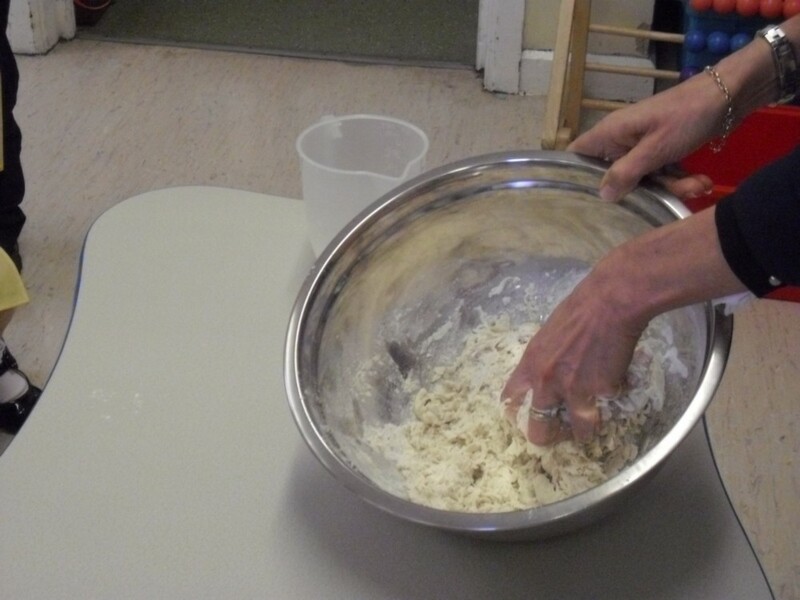 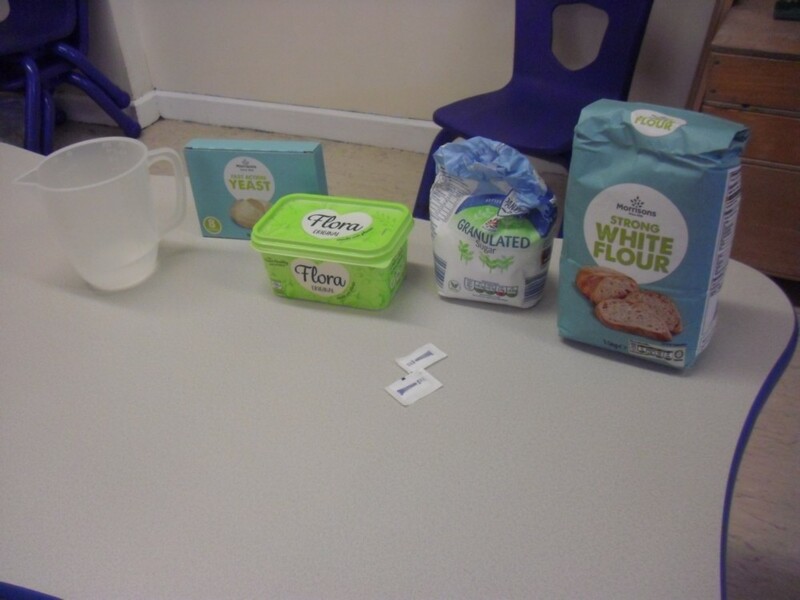 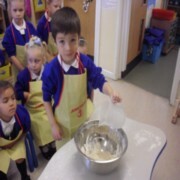 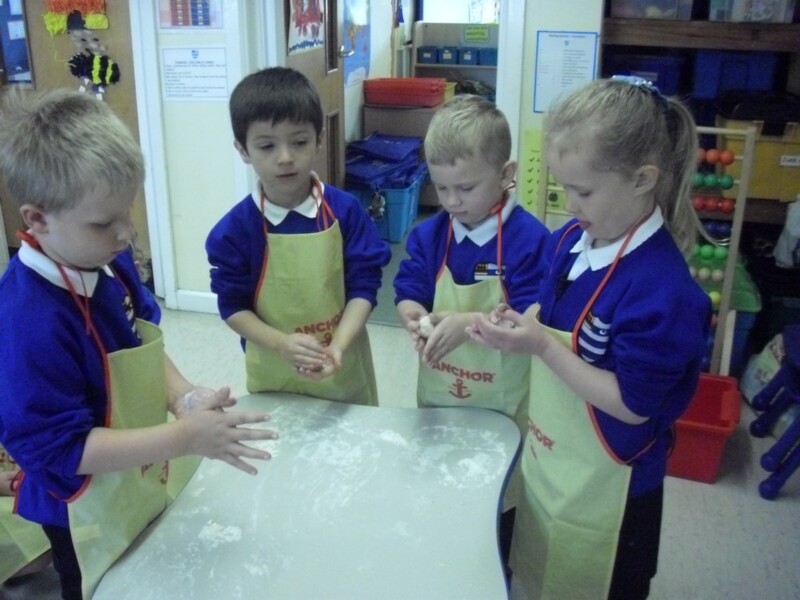 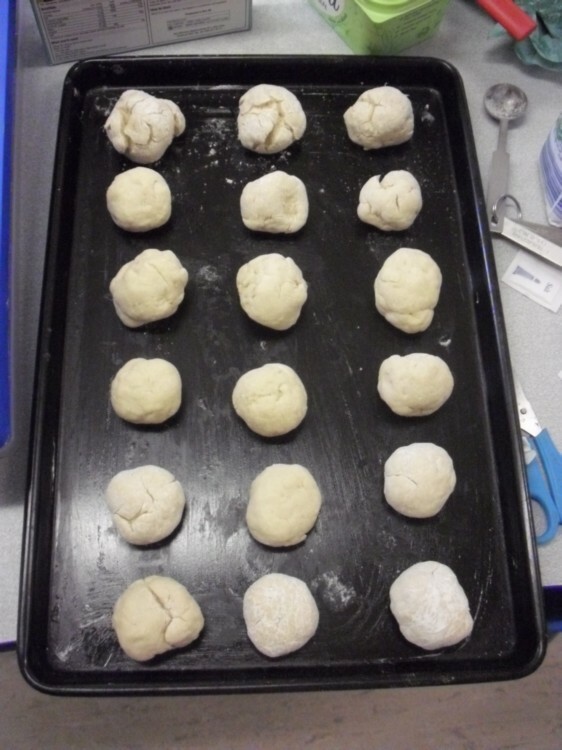 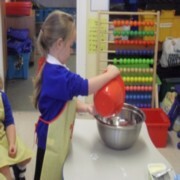 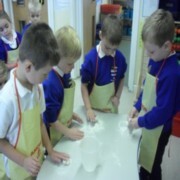 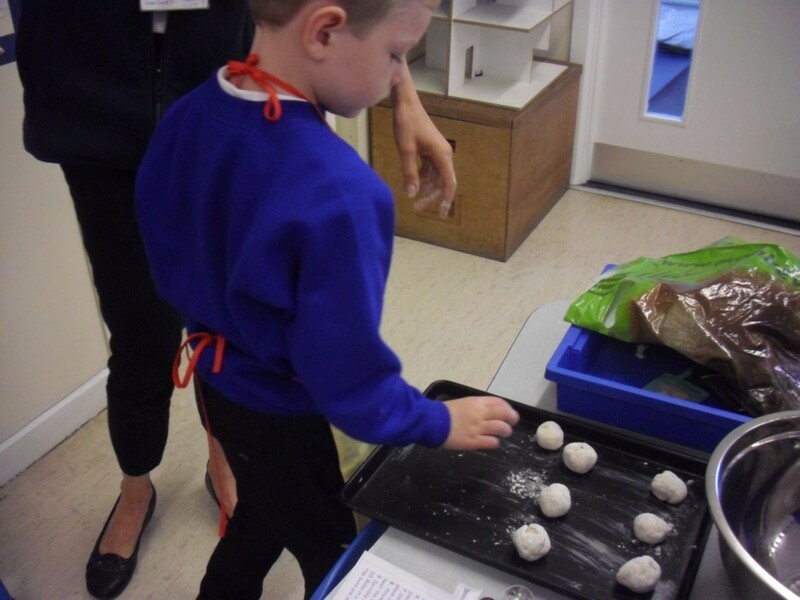 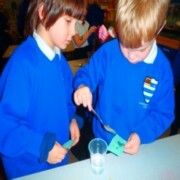 We learnt lots of new words including, solid, liquid and thaw. 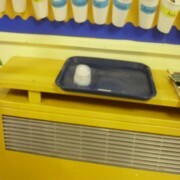 We found out that that the ice near the radiator melted the quickest because it was the warmest place. 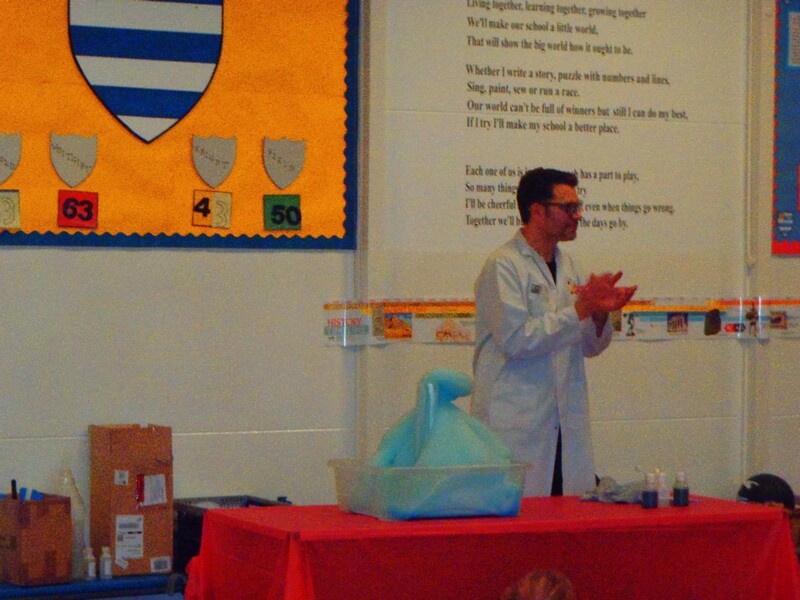 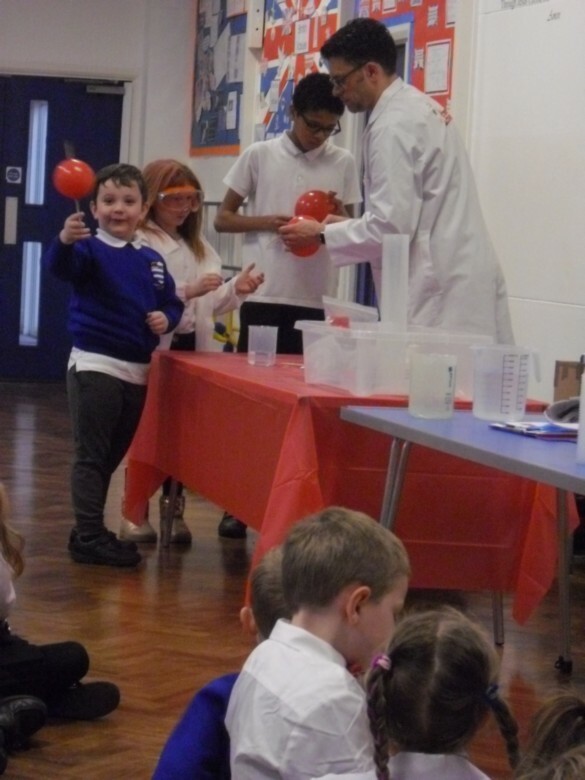 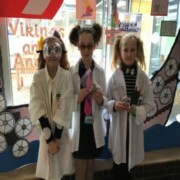 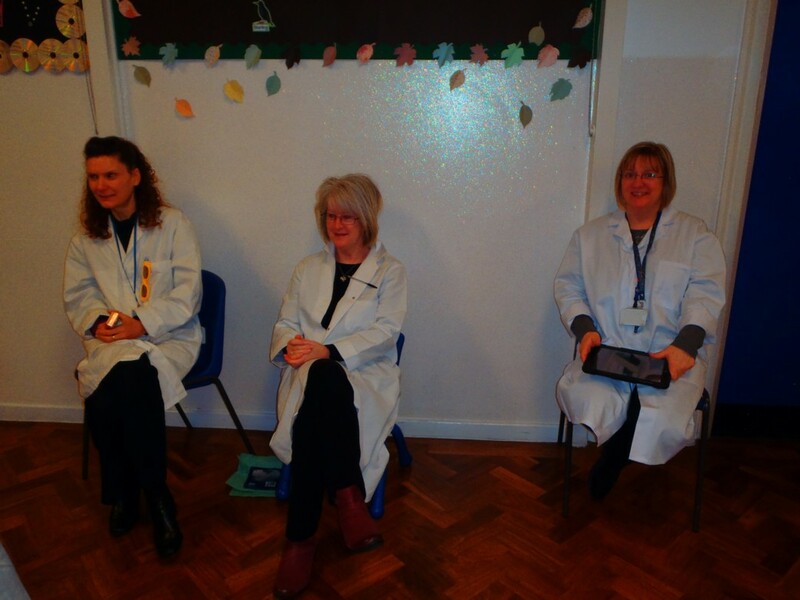 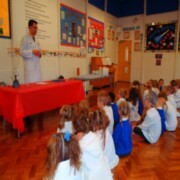 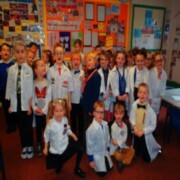 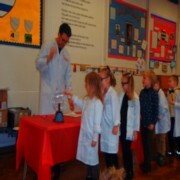 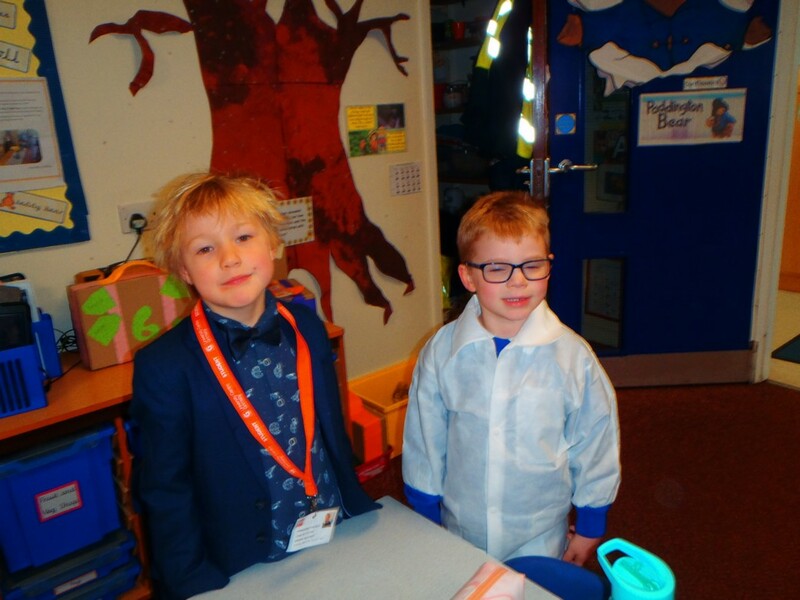 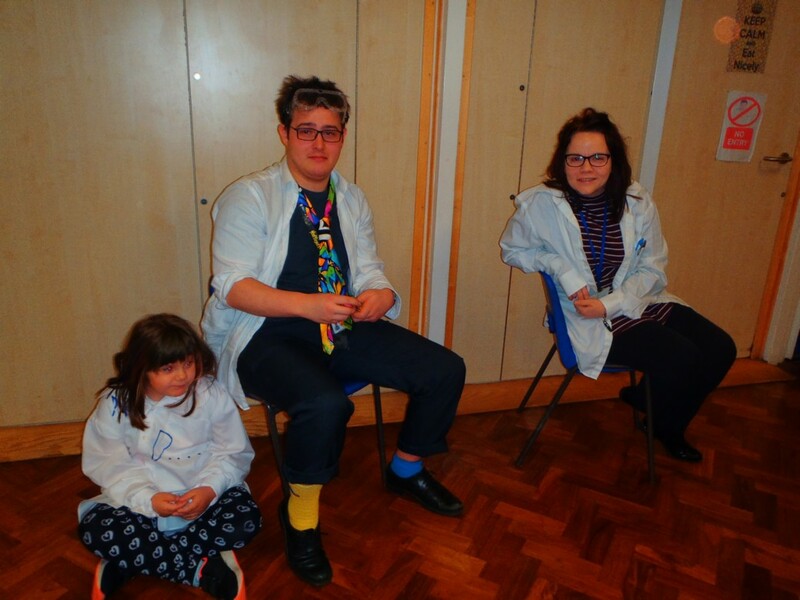 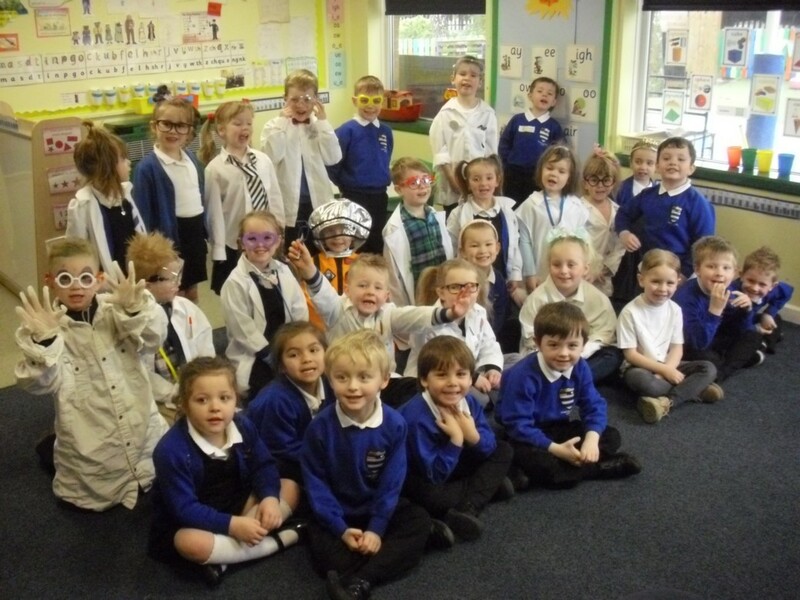 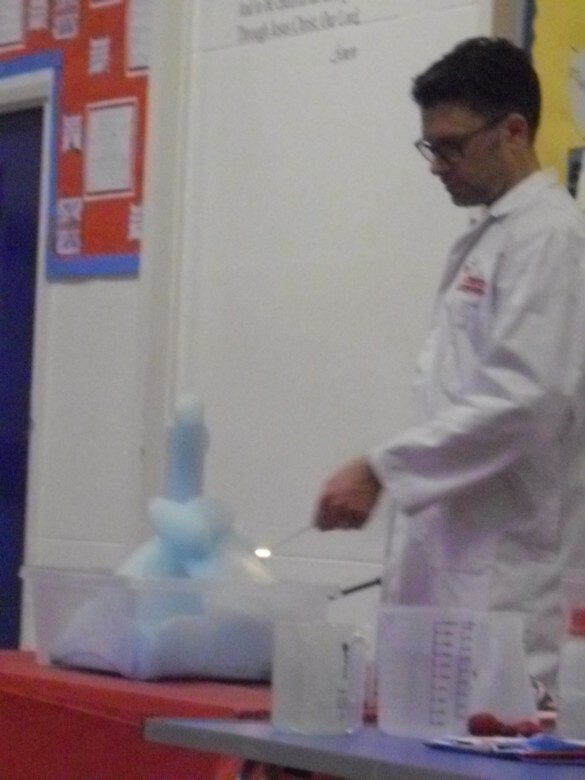 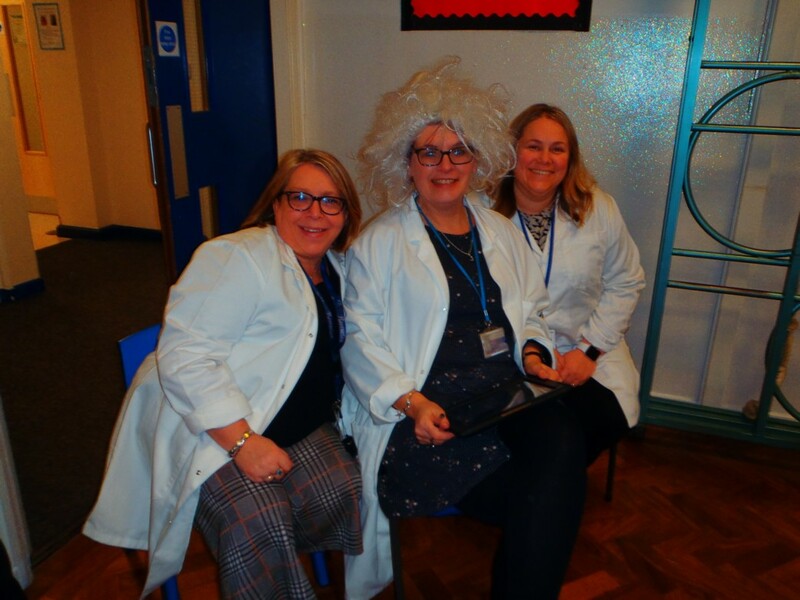 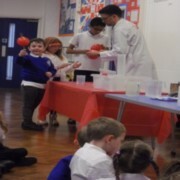 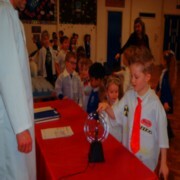 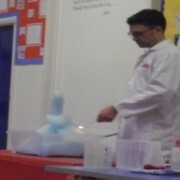 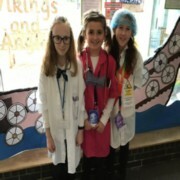 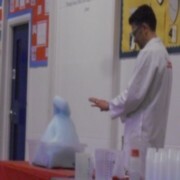 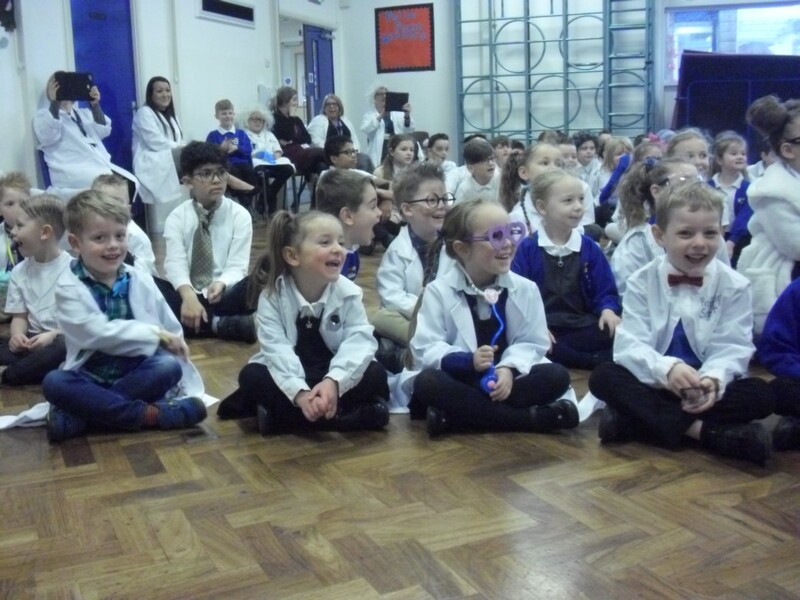 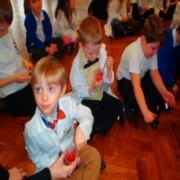 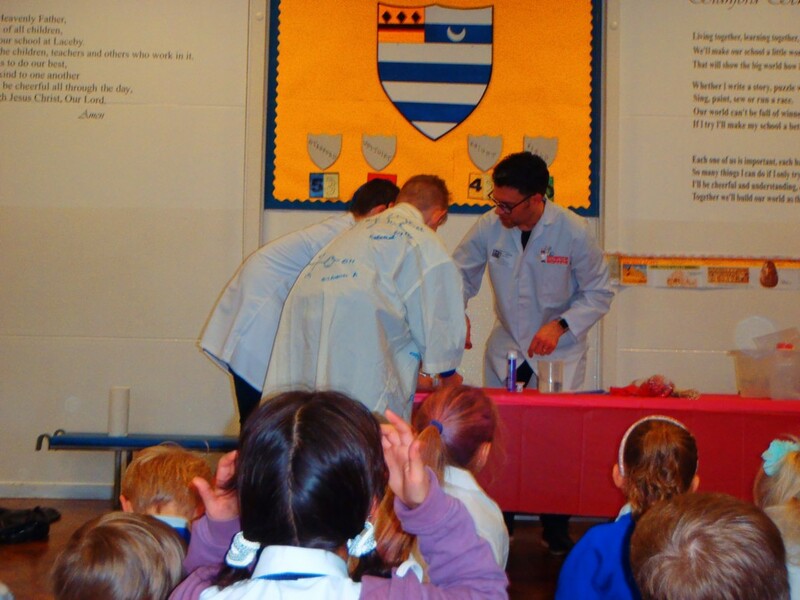 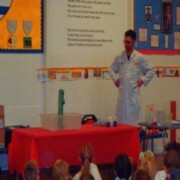 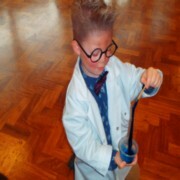 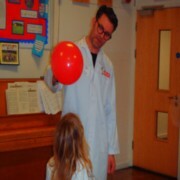 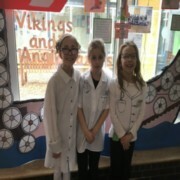 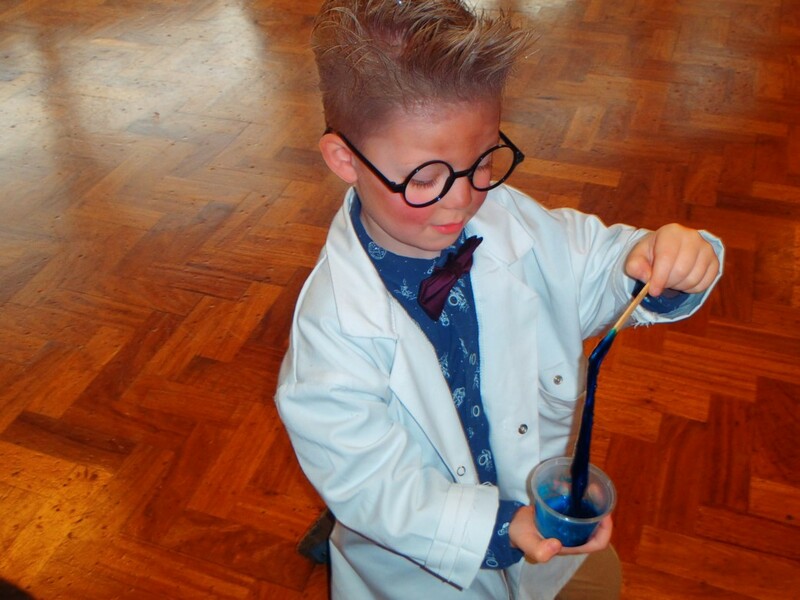 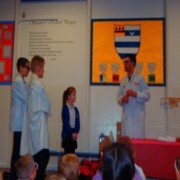 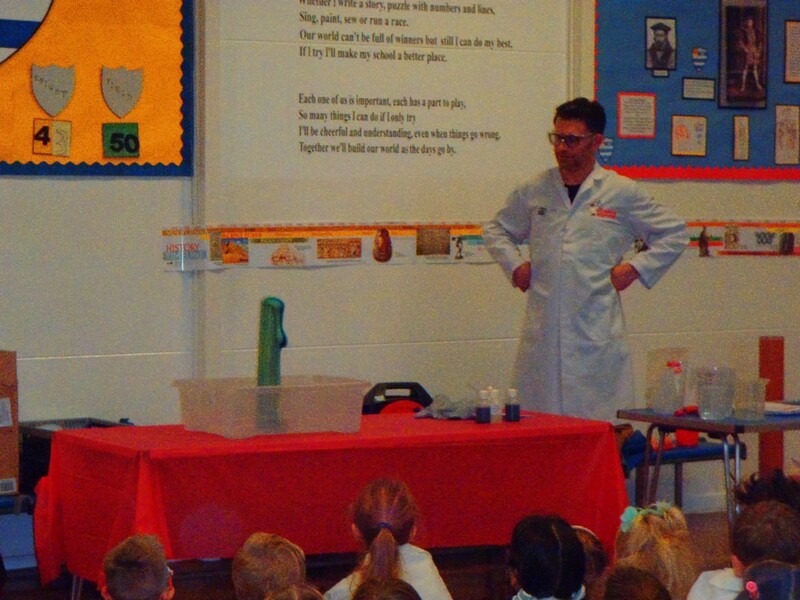 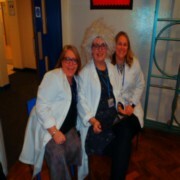 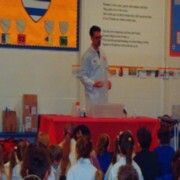 On the 11 March, as part of Science Week, Stanford School had the wonderful “Science Boffins” visit our school. 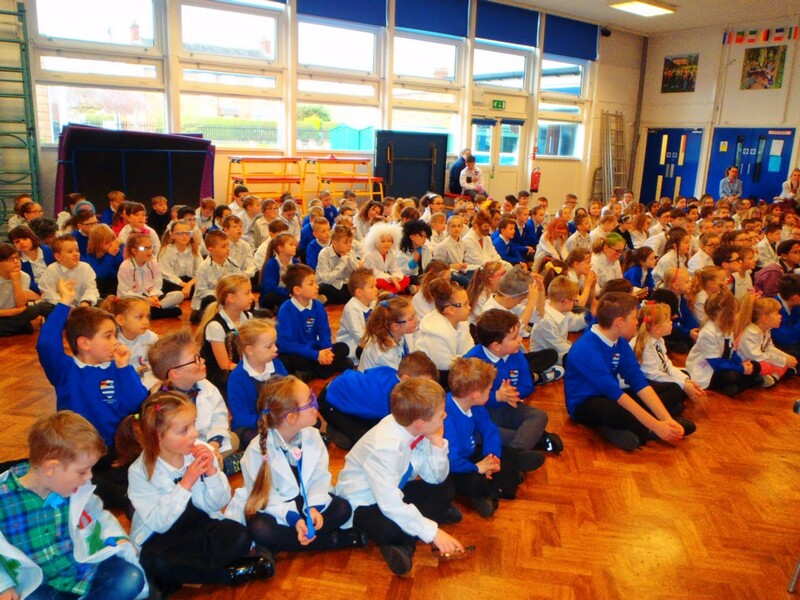 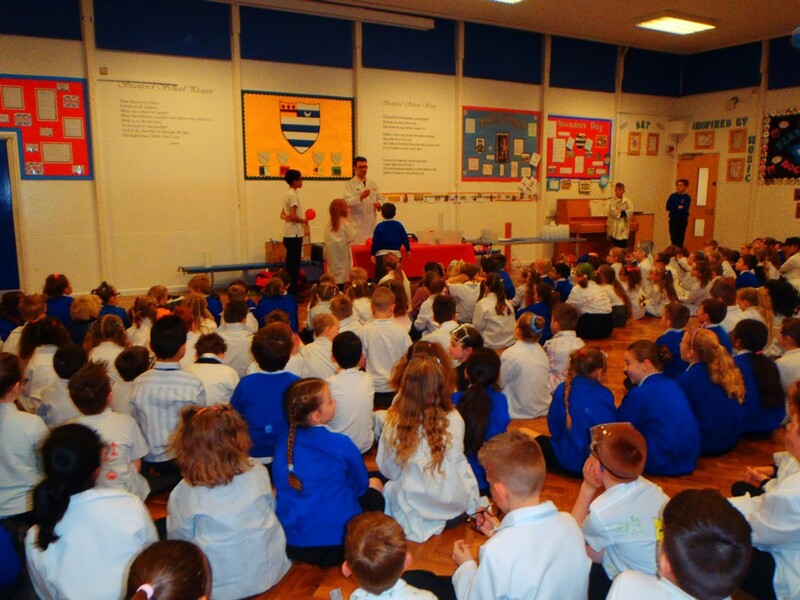 The assemblies and workshops were brilliant and the staff and children loved them. 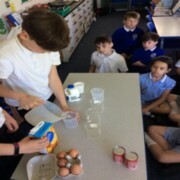 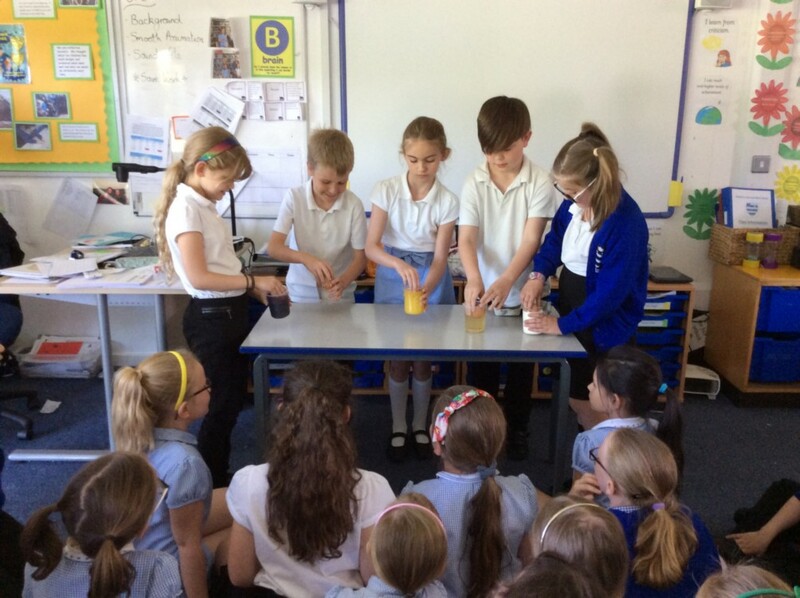 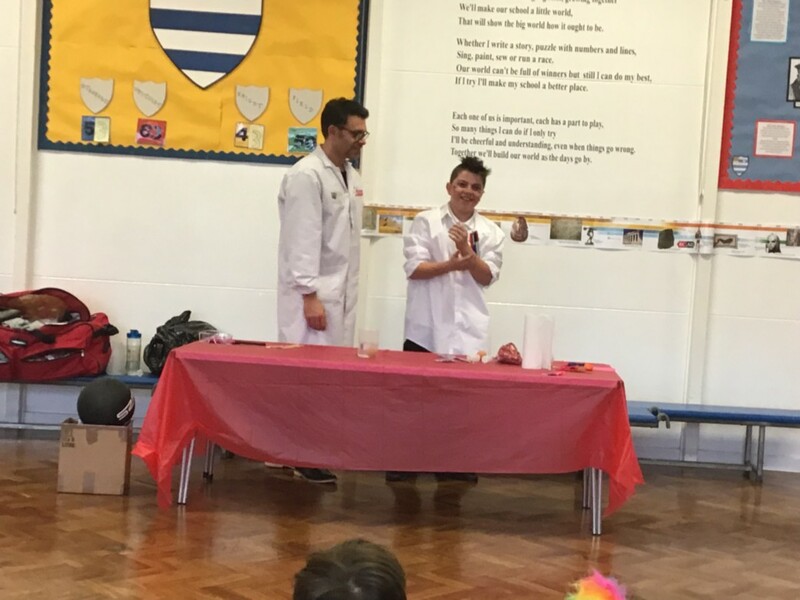 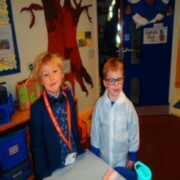 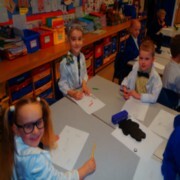 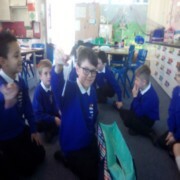 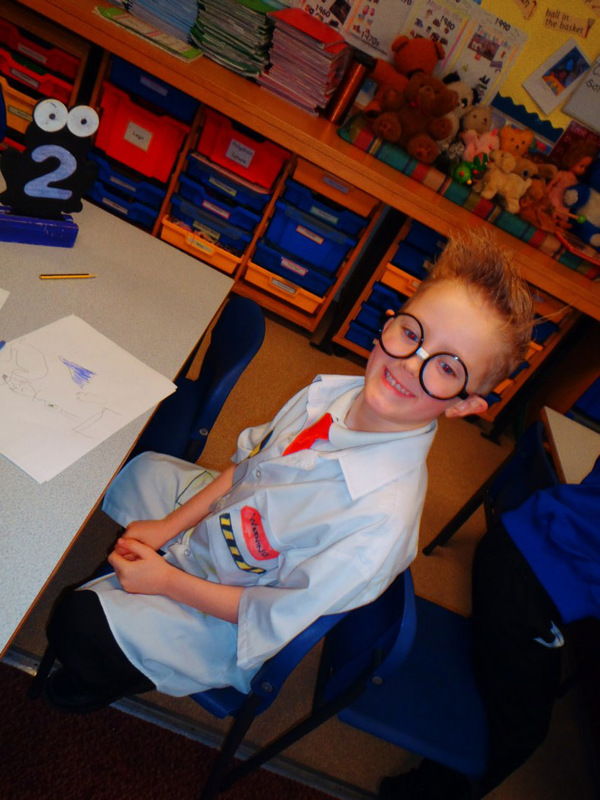 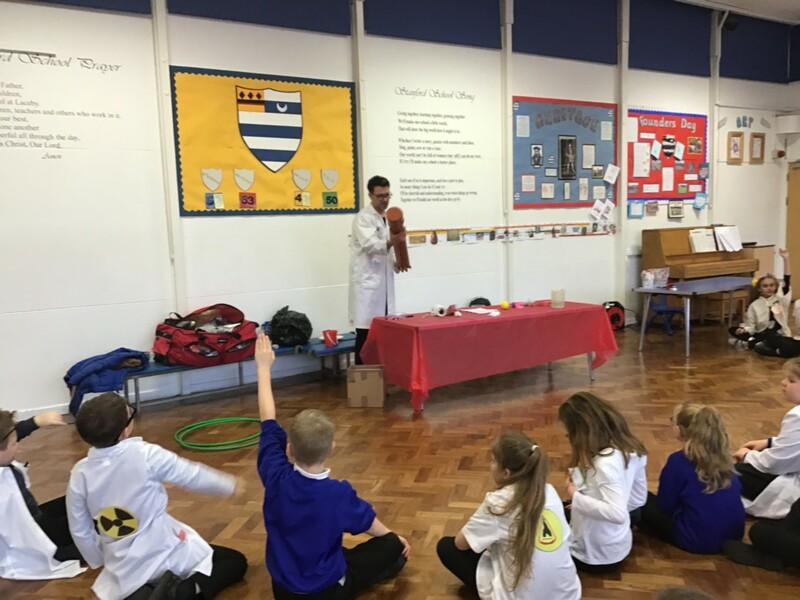 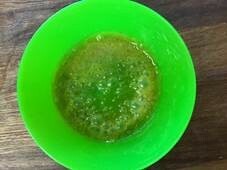 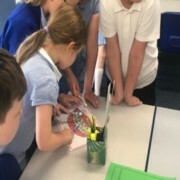 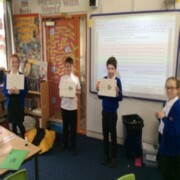 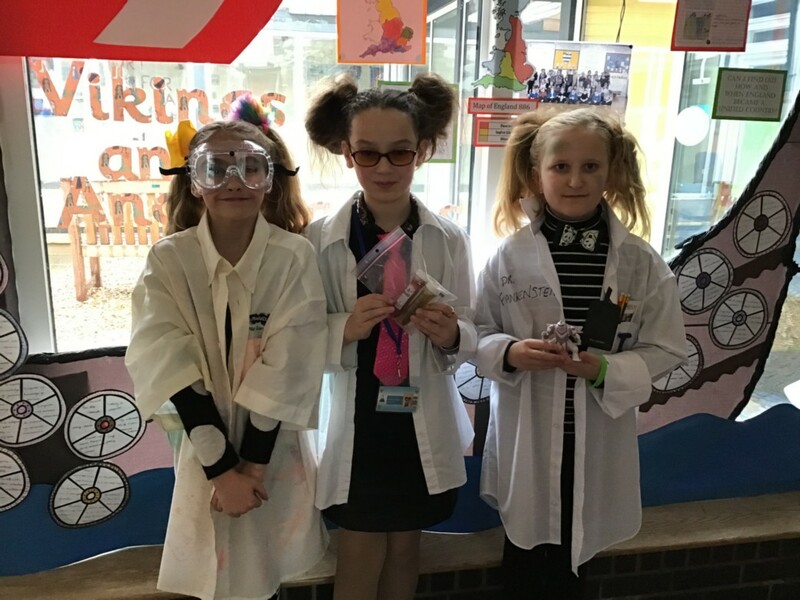 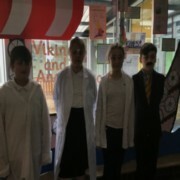 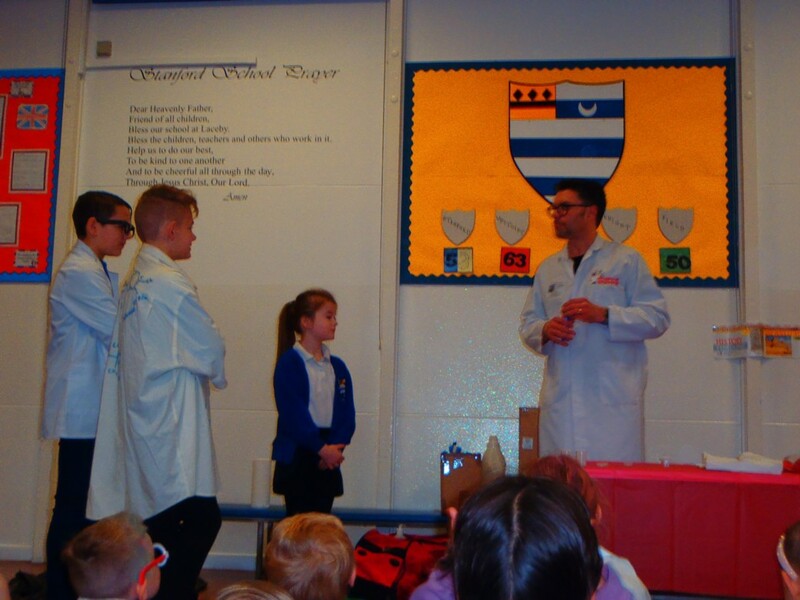 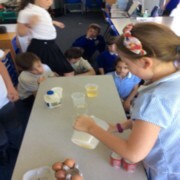 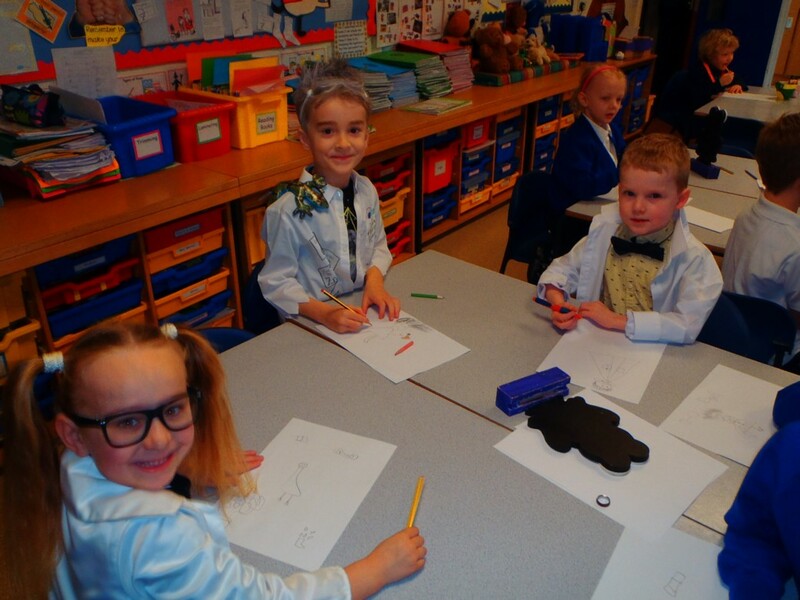 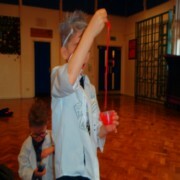 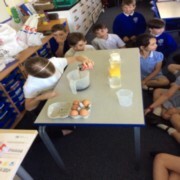 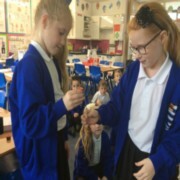 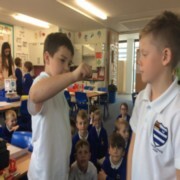 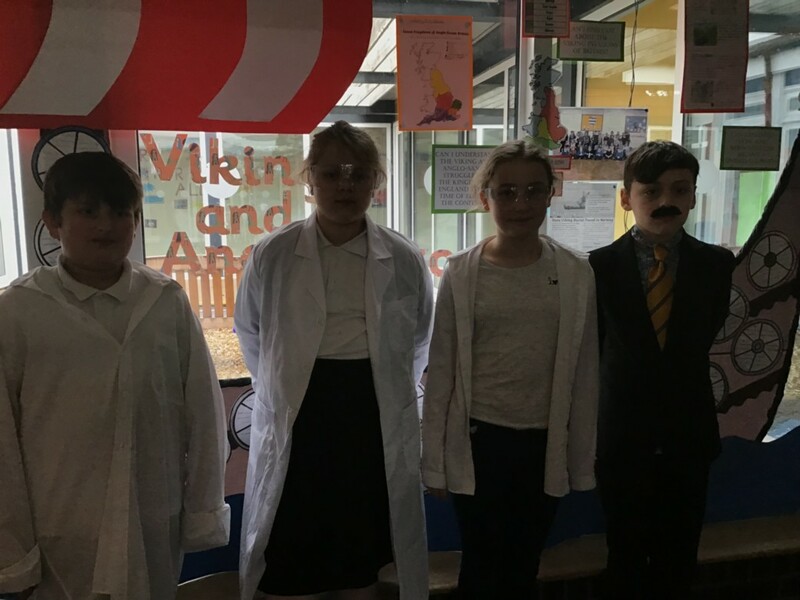 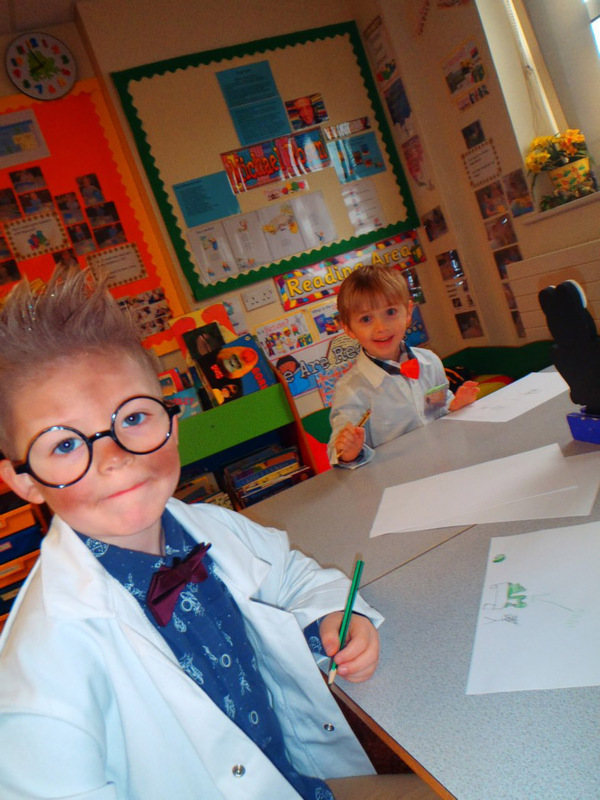 The slime making was a great hit and in Key Stage 2 the children found out about one of the greatest scientists in human history our own local Lincolnshire superstar Sir Isaac Newton. 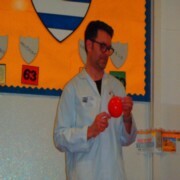 Gravity, rockets and balloons galore !! 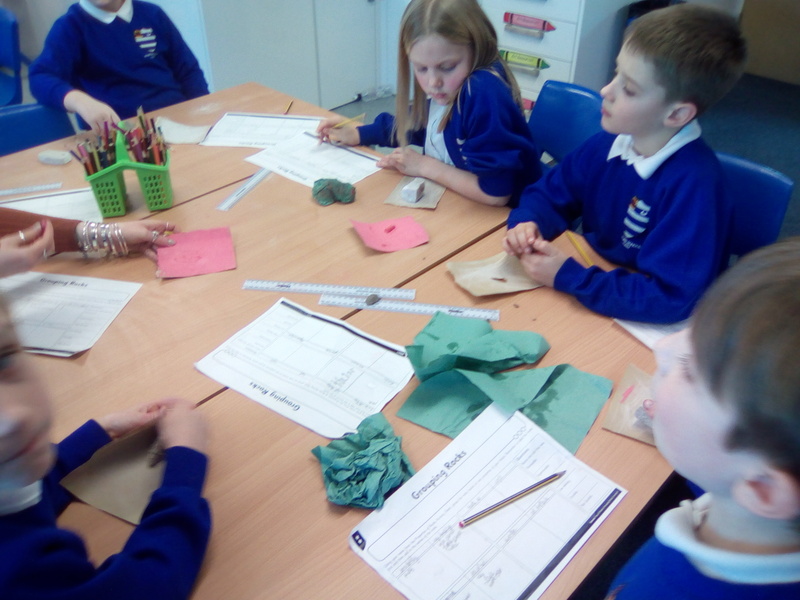 Today we investigated the different properties of rocks. Density: will it will sink or float? 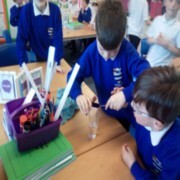 Permeability: does it allow water to pass through it? 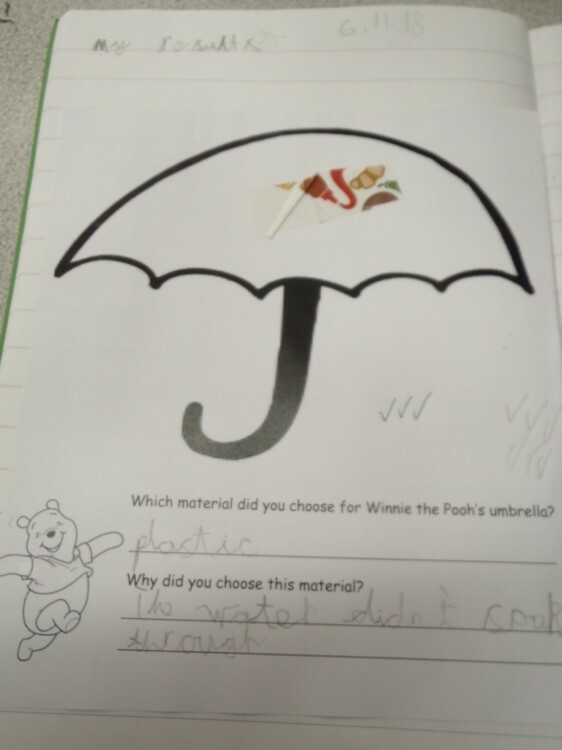 Durability: does it wear away easily? Hardness: can it be easily marked? 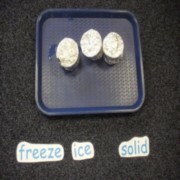 After this the children tried to group the different rocks together according to their properties. 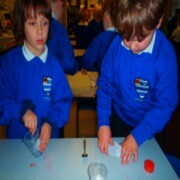 We had lots of fun with all the different investigations. 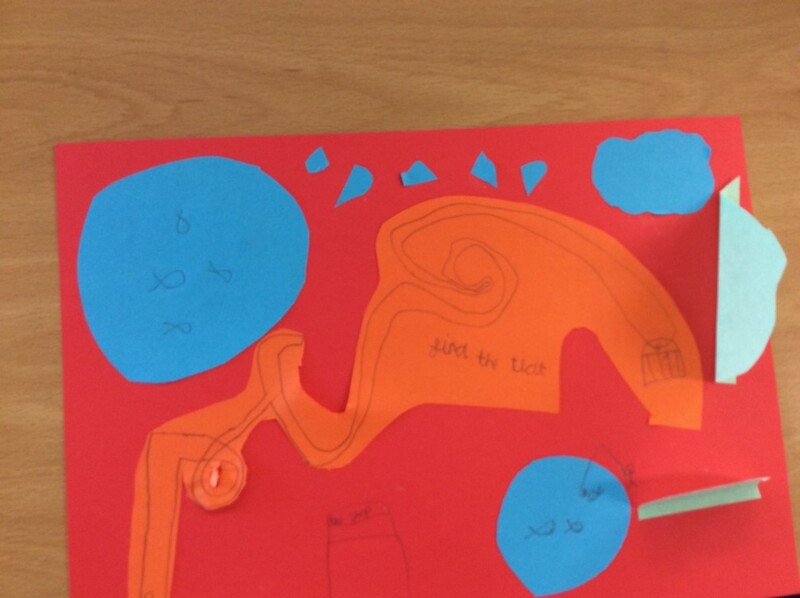 Can I model the different types of rock formations? 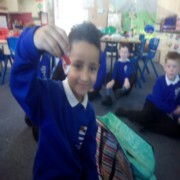 The children were so excited to find out that everyone was getting Starbursts but unfortunately these were not going to be eaten. 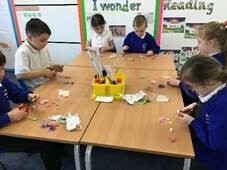 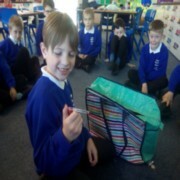 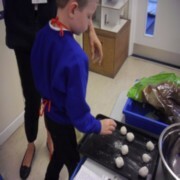 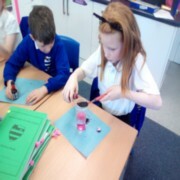 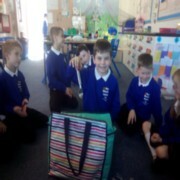 We have been learning about the different ways rocks are formed and one fabulous way is by modelling this with sweets. 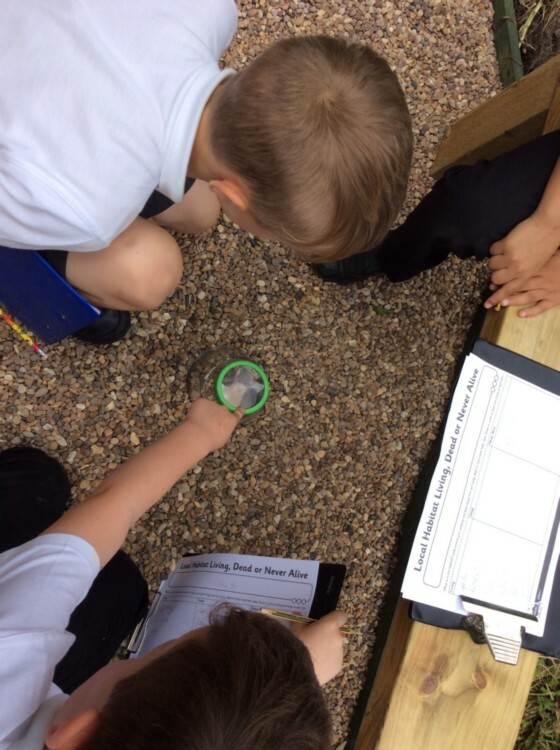 Sedimentary rock – This is created when several layers or fragments of rock are put under pressure until they become one piece of rock. We recreated this in 2 ways. 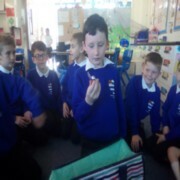 First we put 3 different coloured Starbursts together and then squeezed them until they became one sweet-rock. 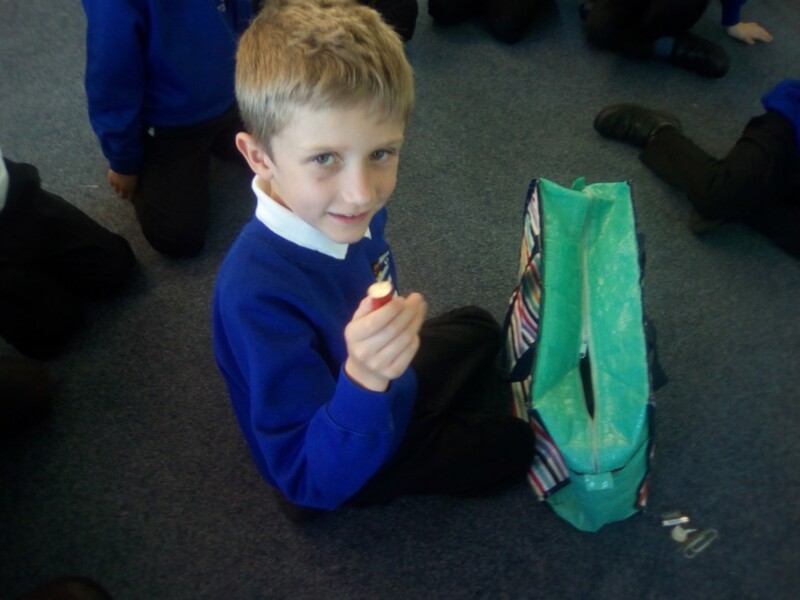 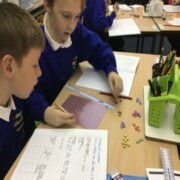 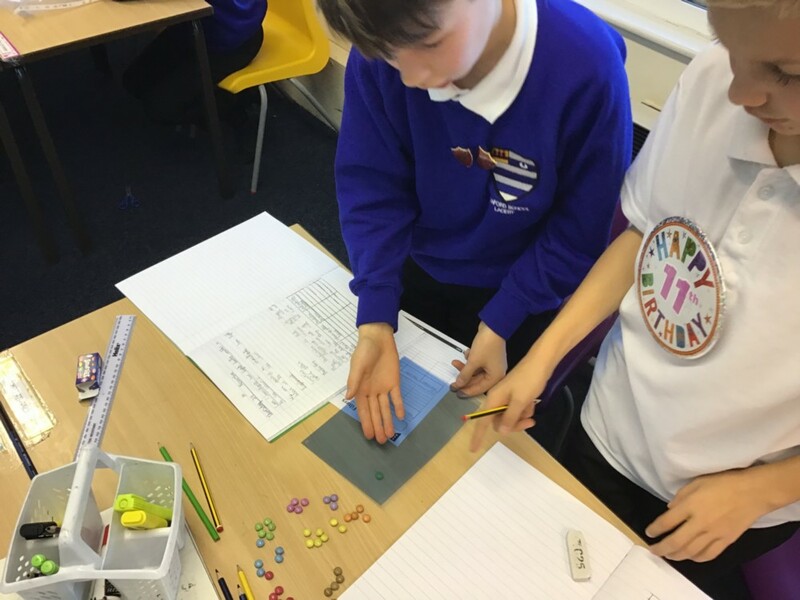 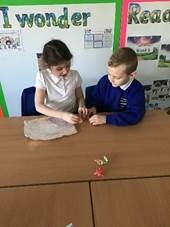 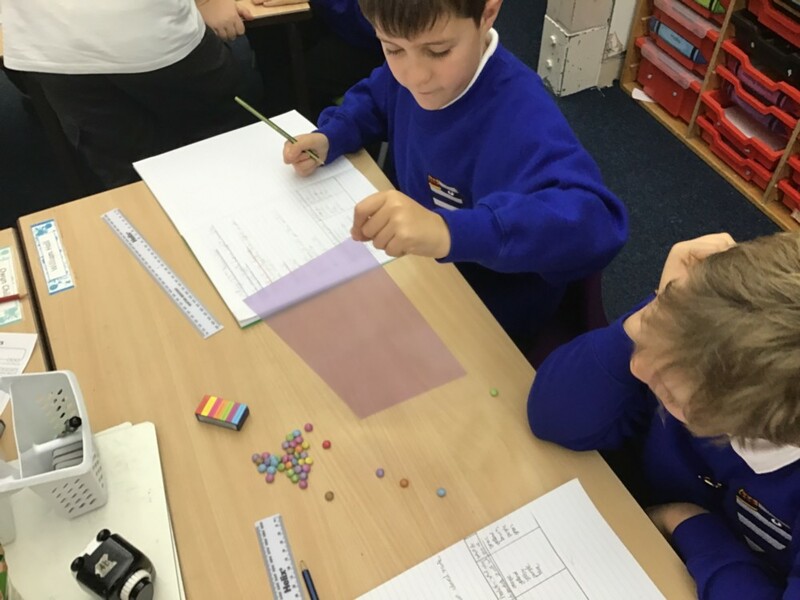 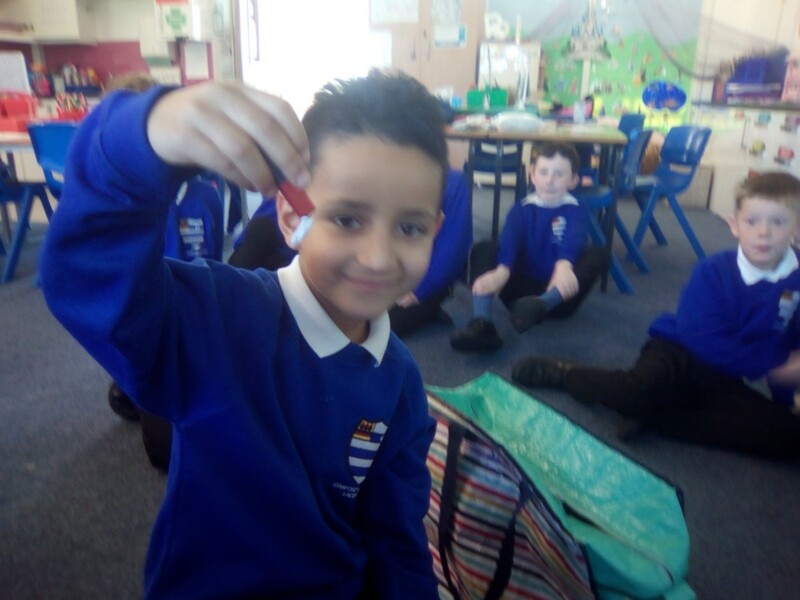 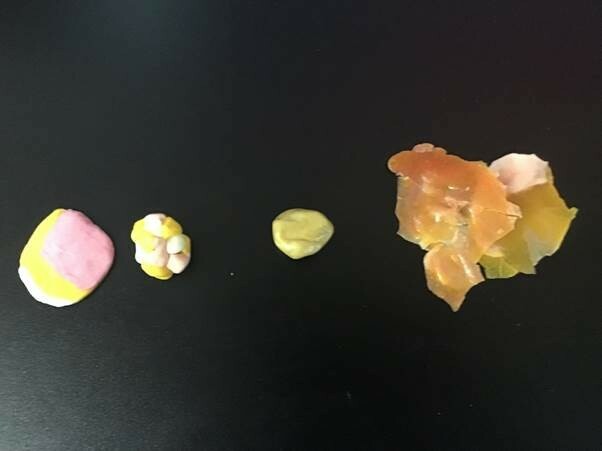 We then created sedimentary rock by cutting the sweets into fragments, mixing them together and squeezing them until they formed one sweet-rock. Metamorphic rock – this is where existing rock is heated and pressure is applied. 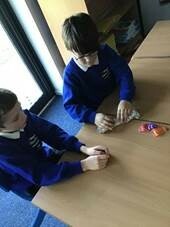 We got our 2 examples of rock and used the heat from our hands to warm them and squeeze them. 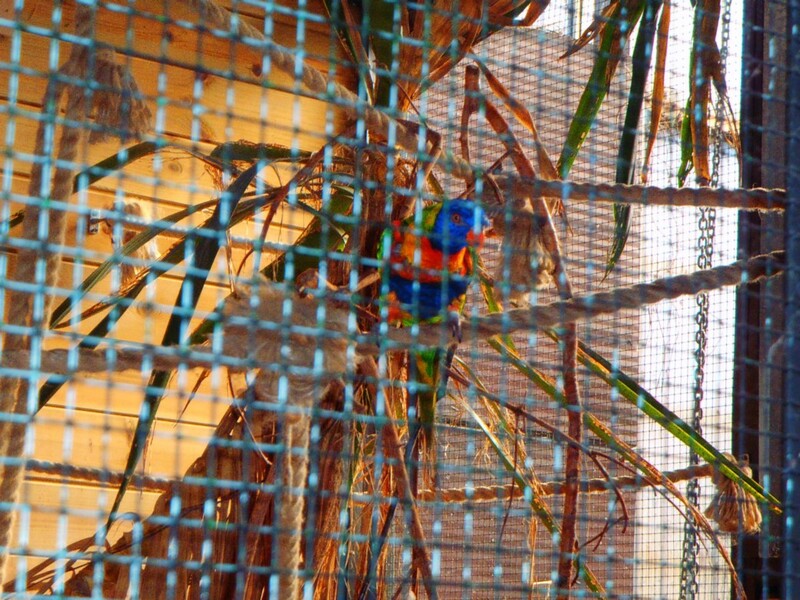 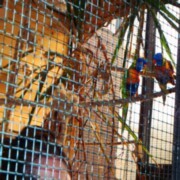 They both changed, the colours blurred together to make one new colour and it looked totally different. 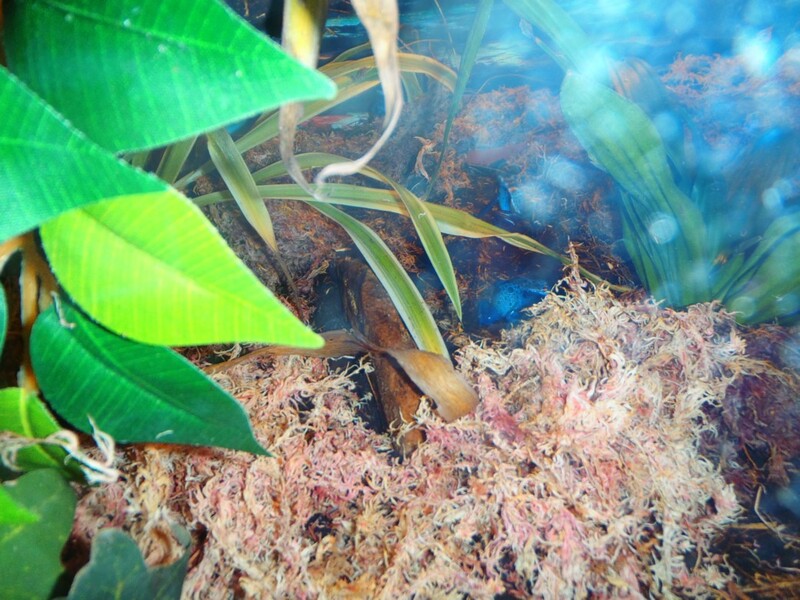 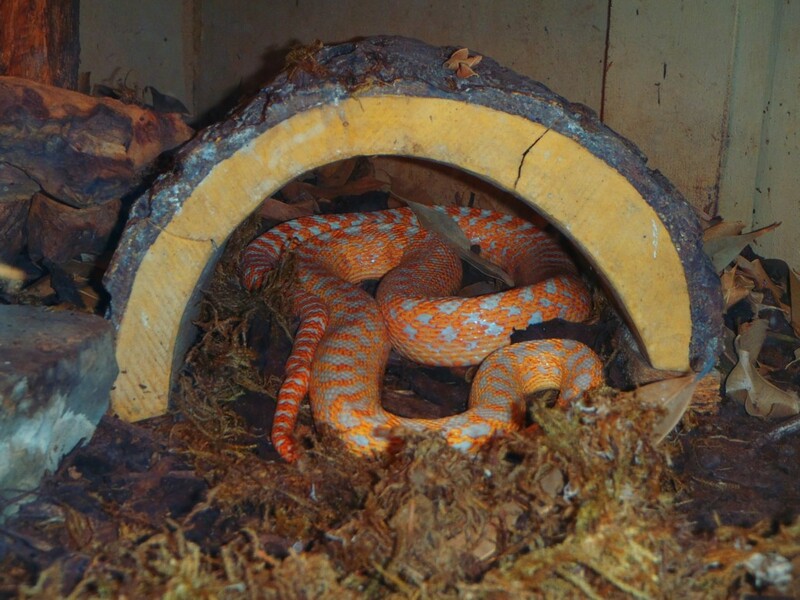 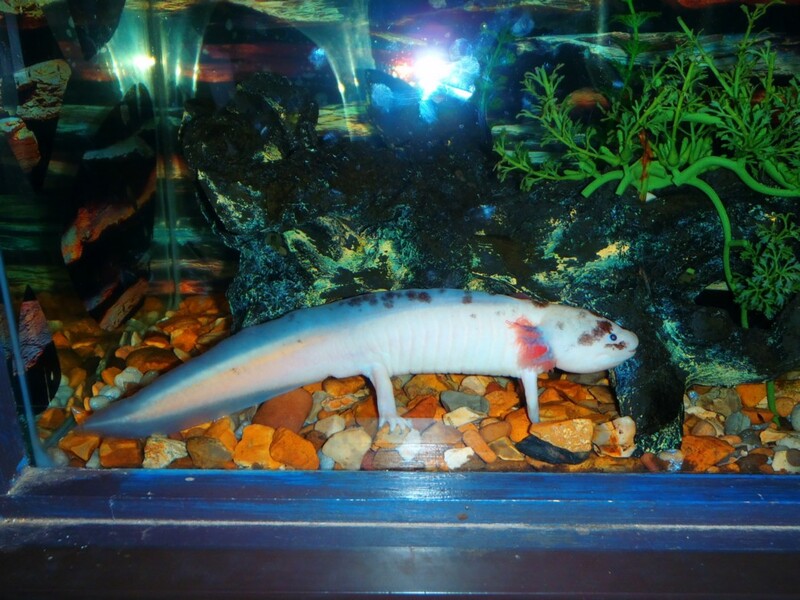 It had metamorphosed into a new type or rock. Igneous – this is where rock is heated until it becomes molten and it is then allowed to cool. 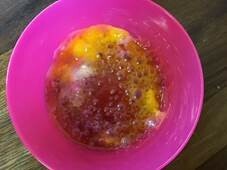 An adult put our Starburst rocks into the microwave s that they boiled and cooled. 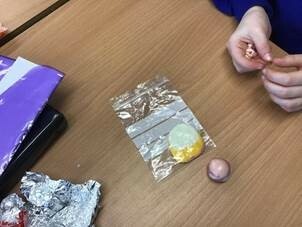 Can you tell which type of rock is which? 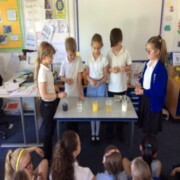 Barley class completed an experiment on how light enables us to see colours. We used different coloured Smarties and coloured overlays to investigate what happens to the colours when an overlay is placed over them. 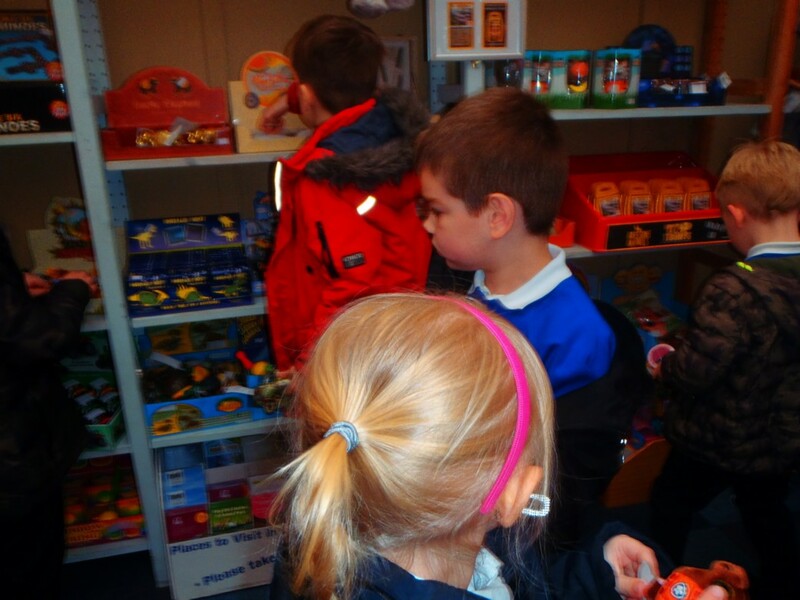 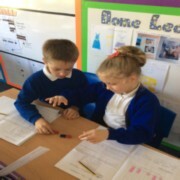 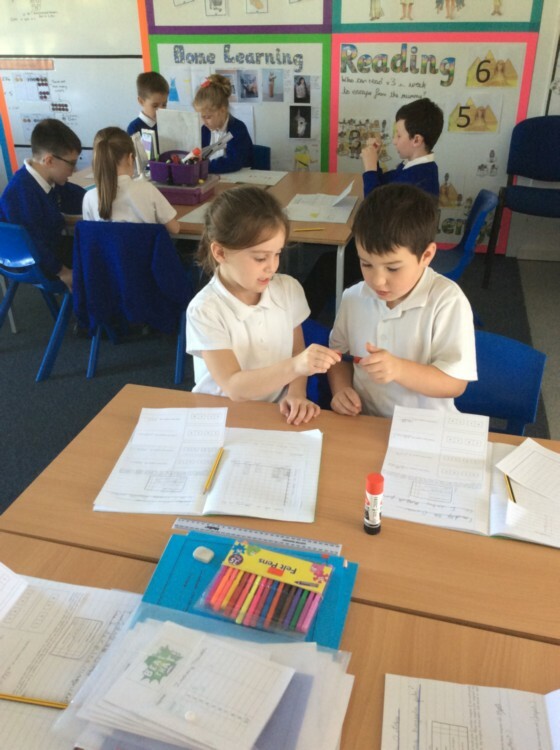 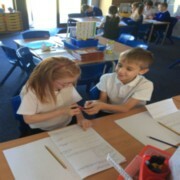 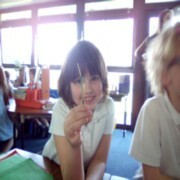 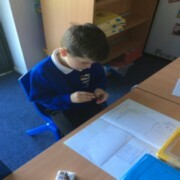 To finish off our investigations into magnetism the children looked at how magnets are used in everyday life. 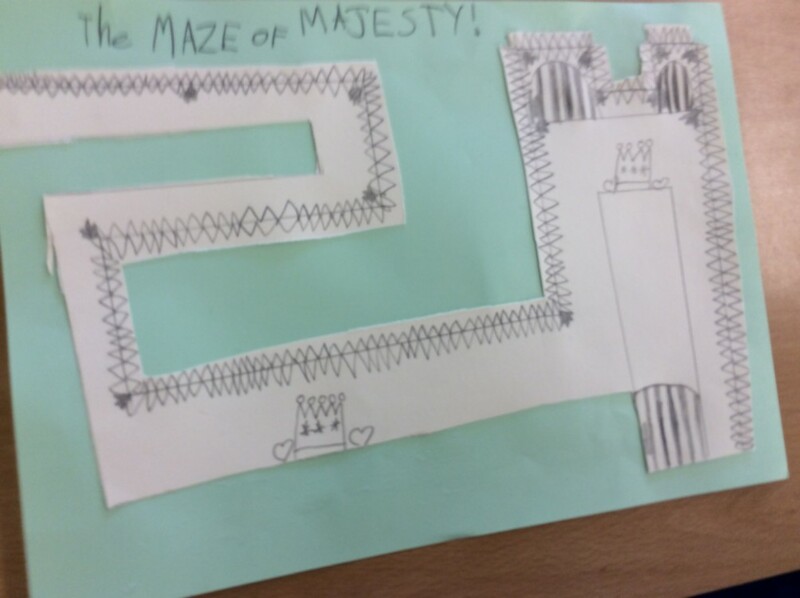 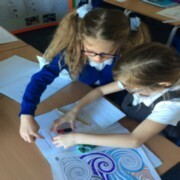 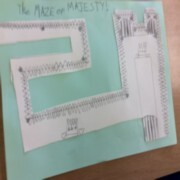 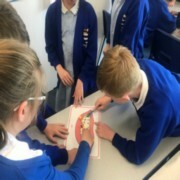 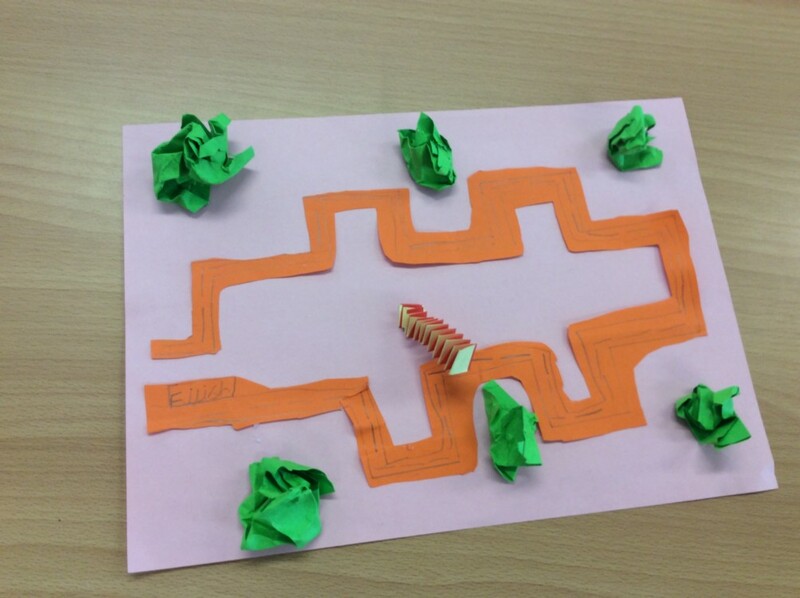 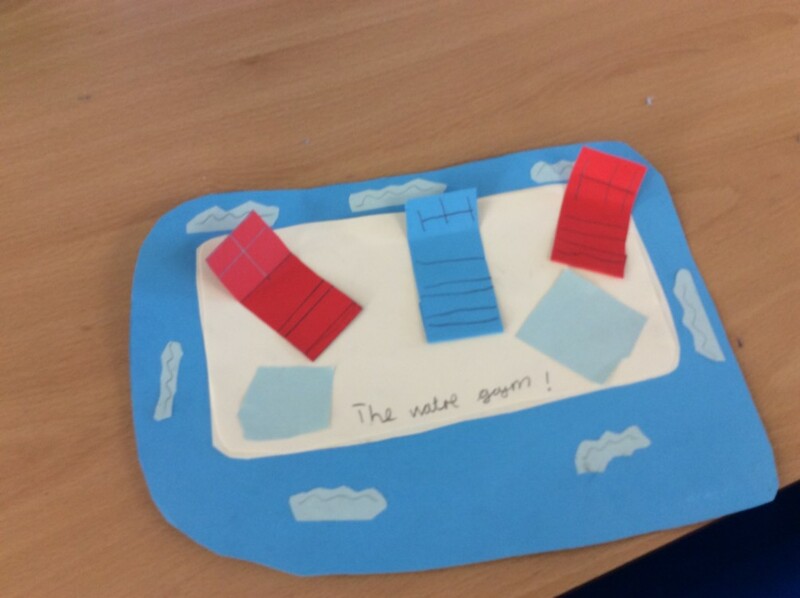 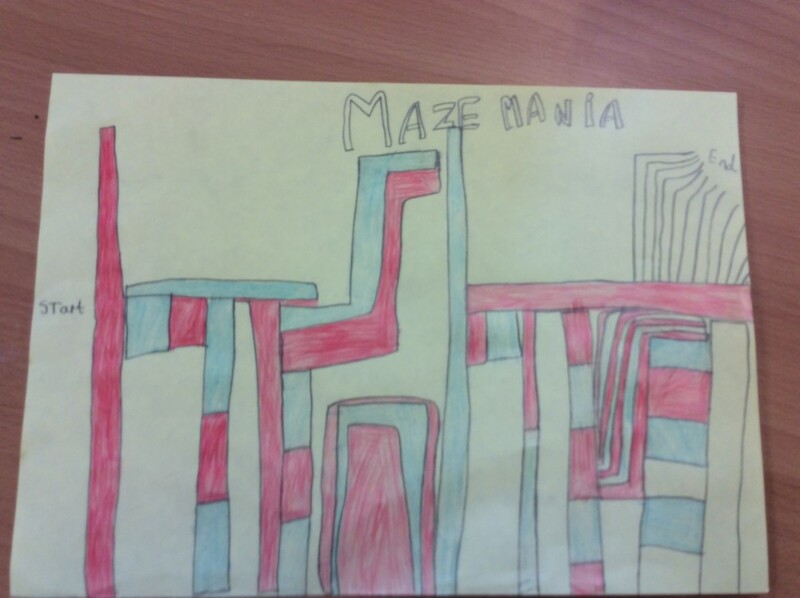 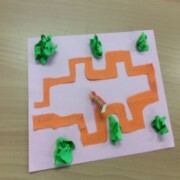 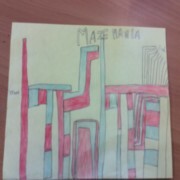 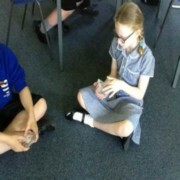 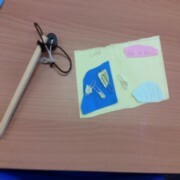 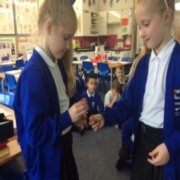 They were the set a challenge to use their knowledge of magnetism to create a game. 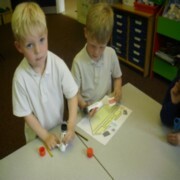 They had lots of fun creating and playing them. 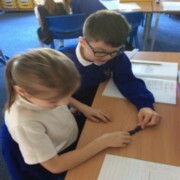 In our learning we have looked at forces including magnetic forces. Today we looked at how magnets have poles called North and South. 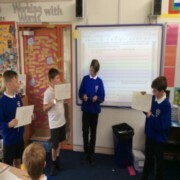 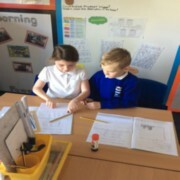 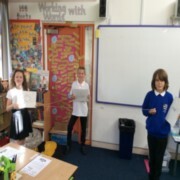 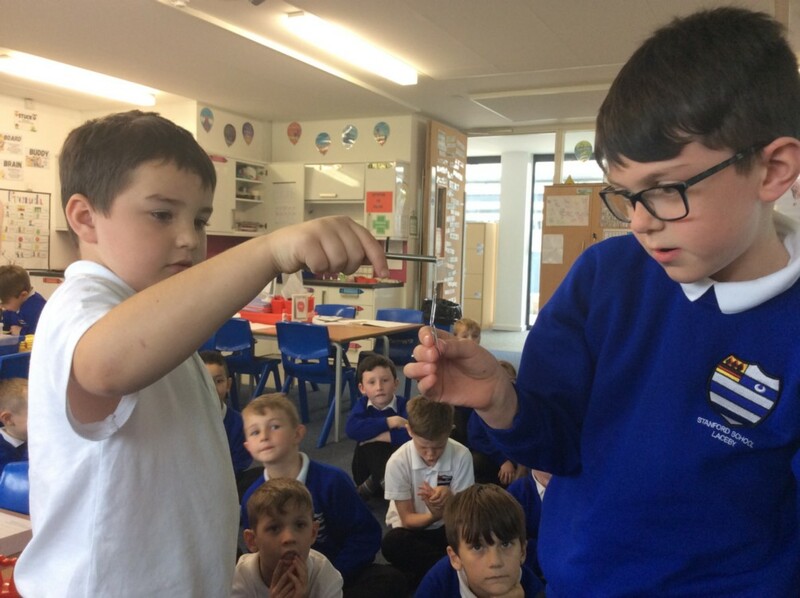 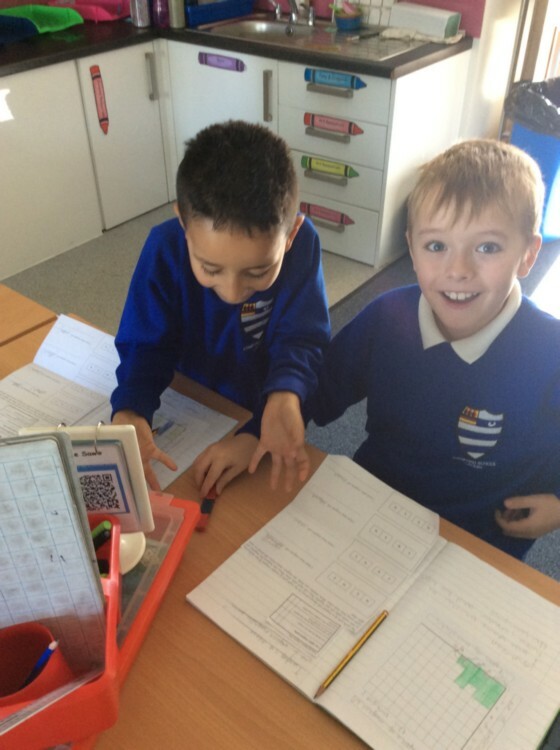 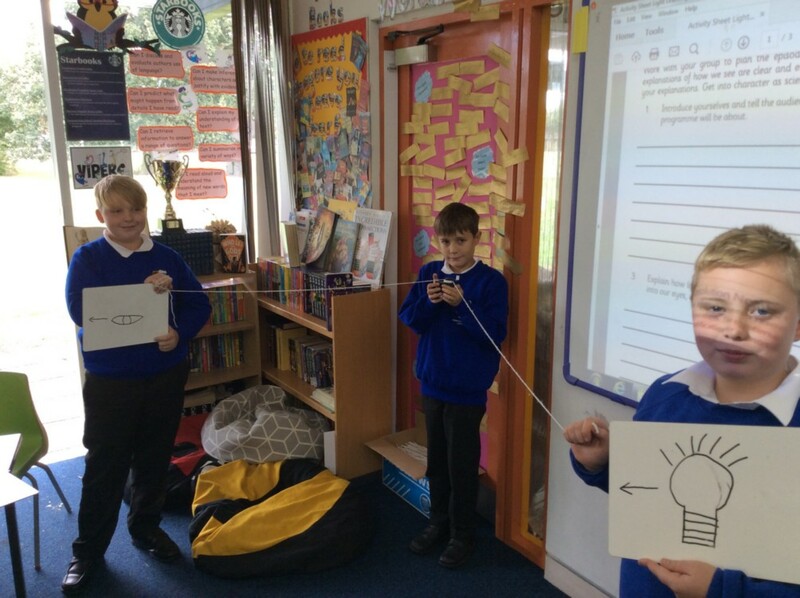 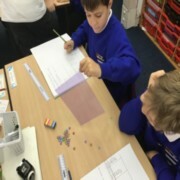 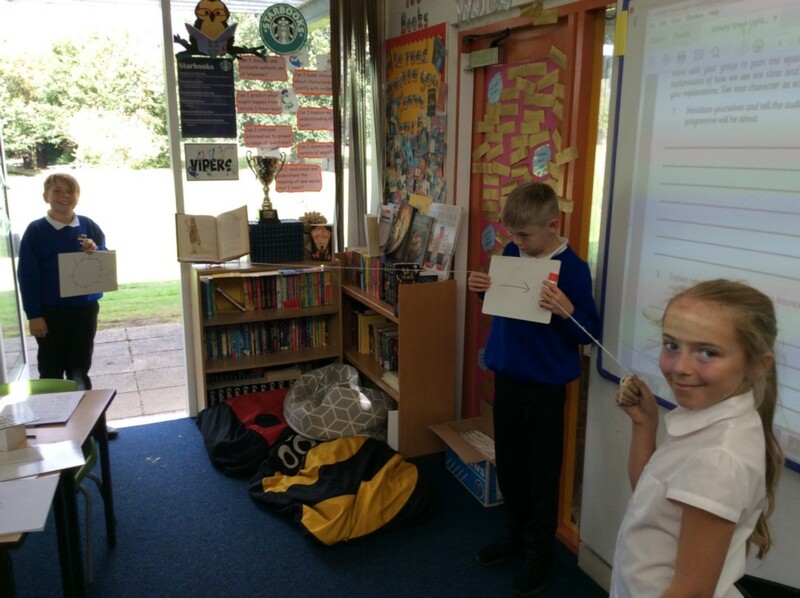 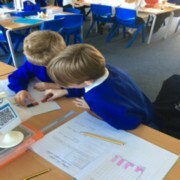 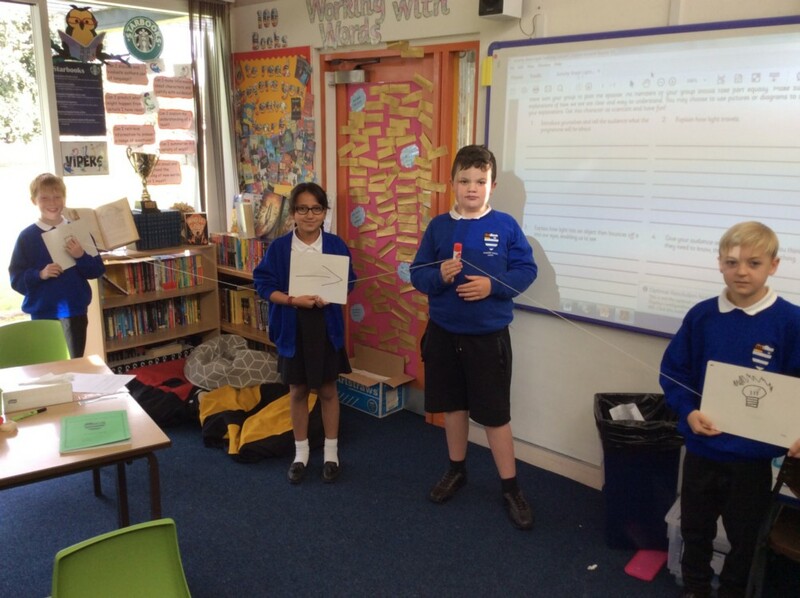 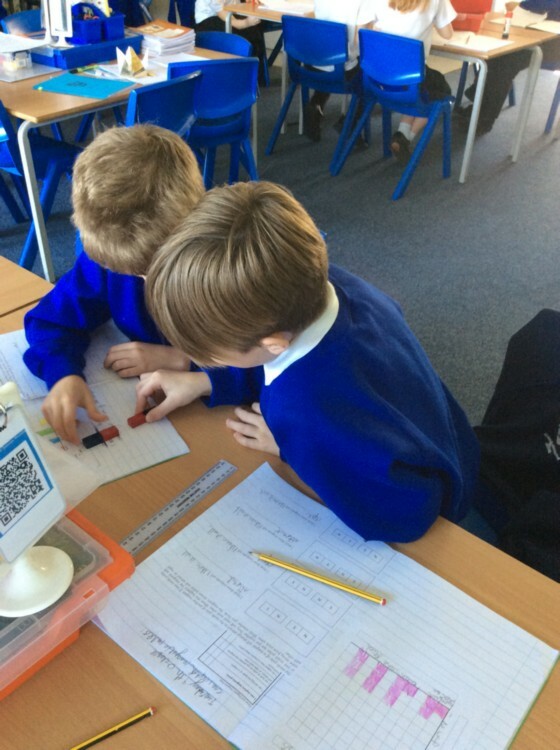 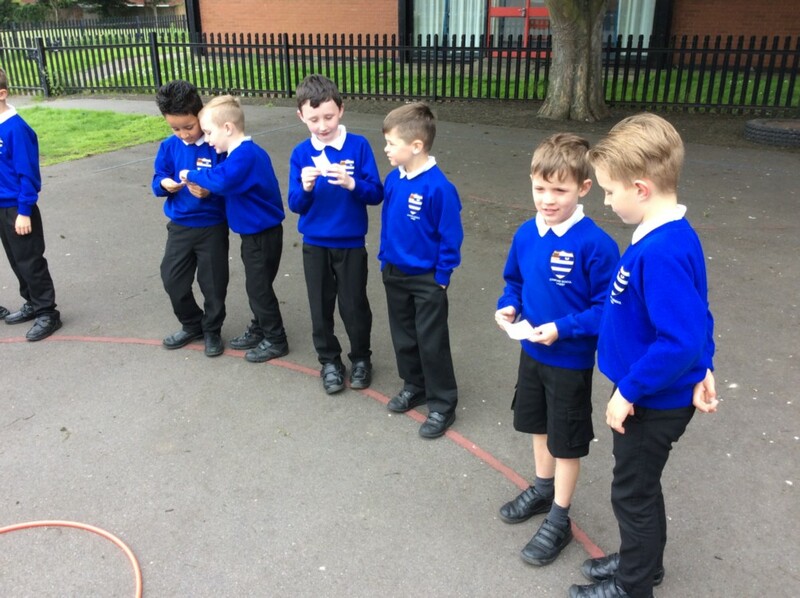 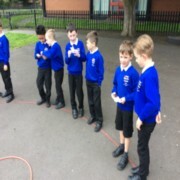 We investigated what happened when you put the different poles together and found out that if the poles are the same they will repel each other however if they are different they will attract each other. 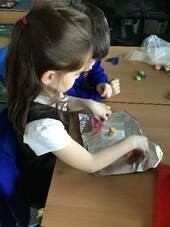 We had lots of fun working together with magnets. 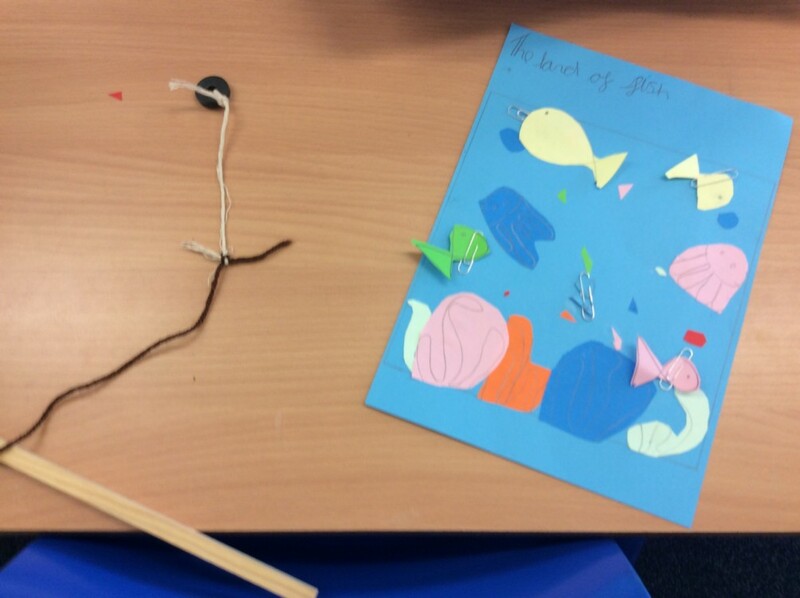 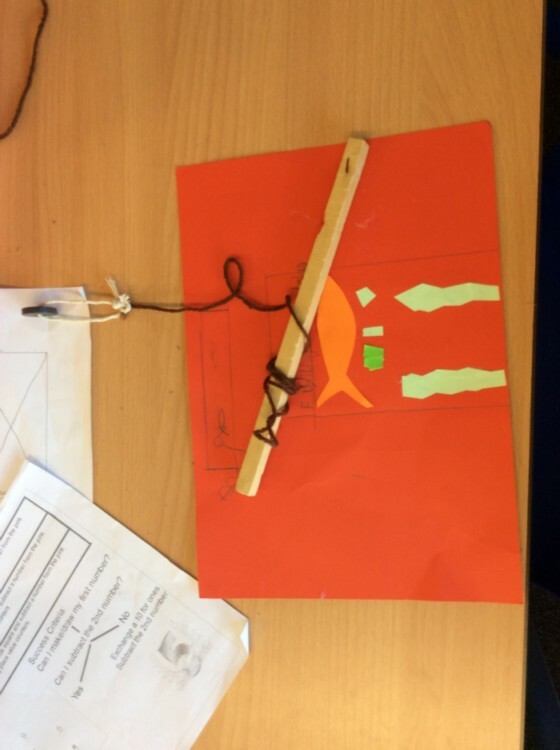 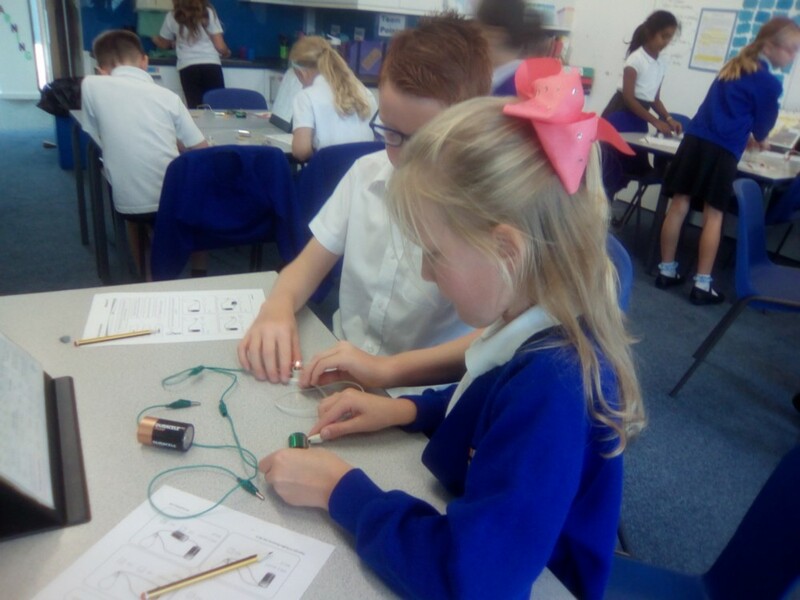 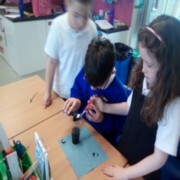 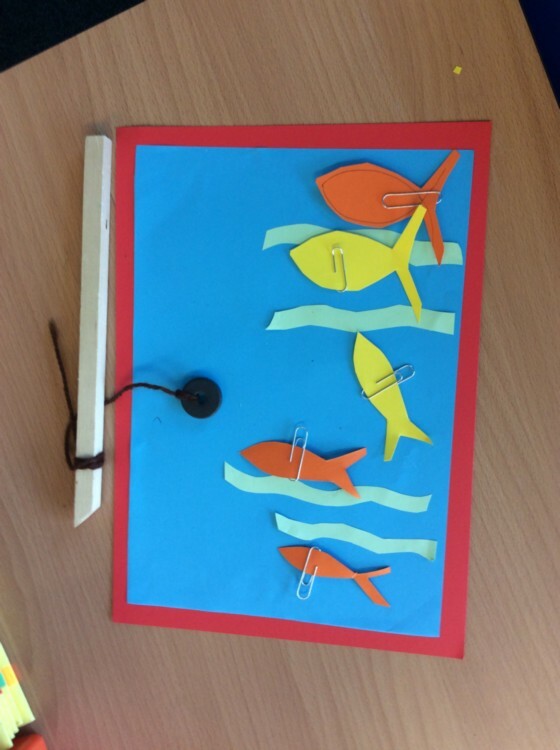 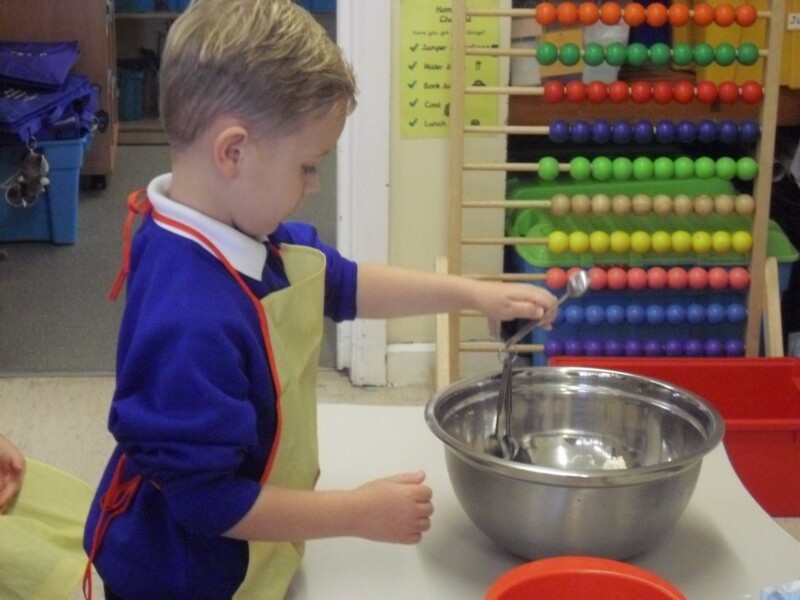 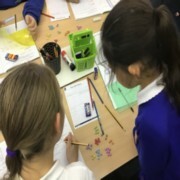 Today the children learnt that there were different types of magnets such as bar magnets, button magnets, horseshoe magnets and cylindrical magnets. 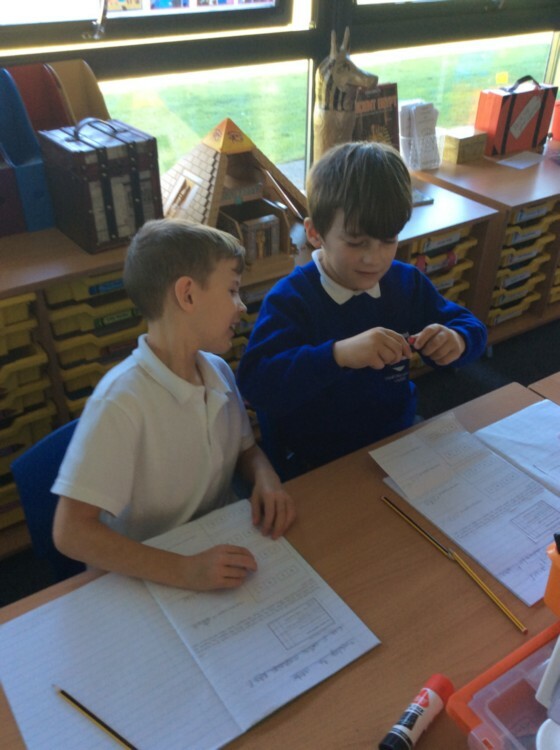 We decided to investigate which magnets had the strongest magnetic field. We did this by trying to make a chain of paperclips held together by magnetism. First the children predicted which magnet would be the strongest. 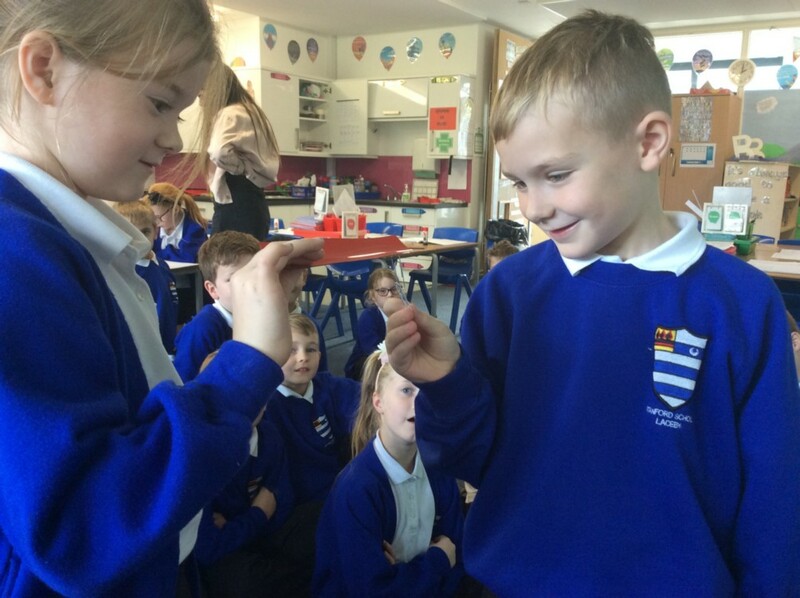 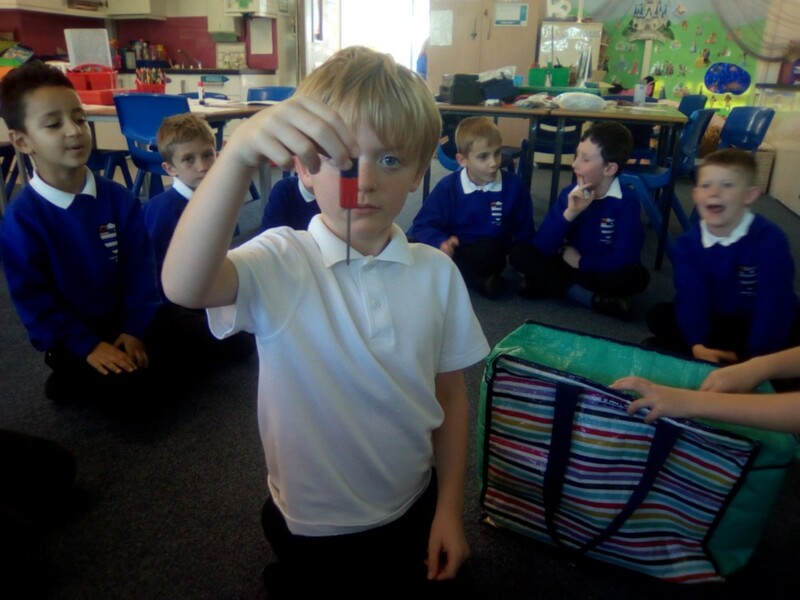 Most children automatically chose the largest magnet and were surprised to find that the size of the magnet did not indicate how strong it would be. 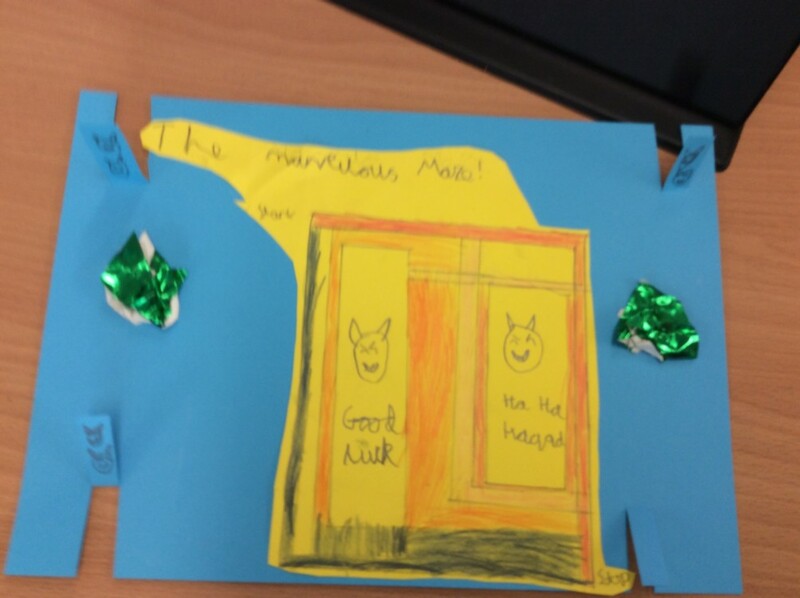 We have been learning about magnetism and how magnets are used as a part of the recycling process to sort out metallic materials. 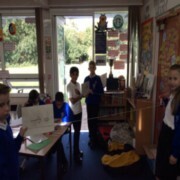 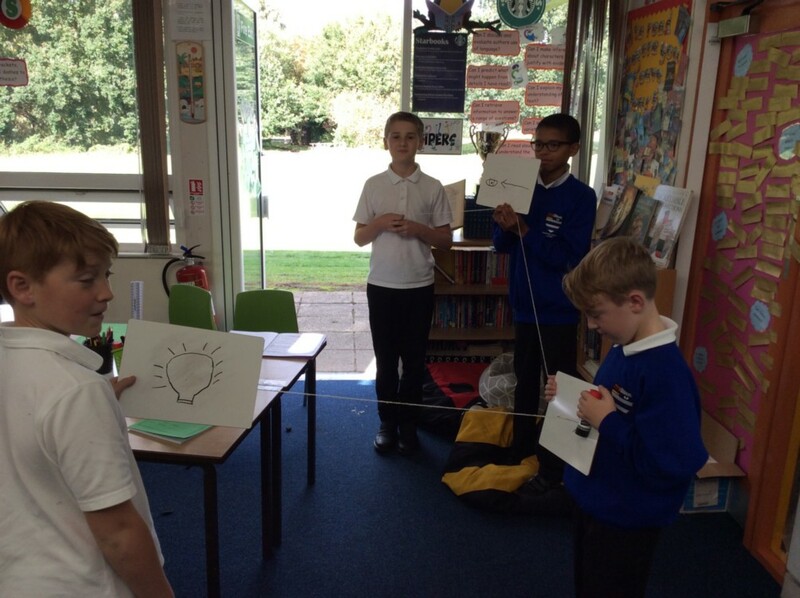 Barley class worked collaboratively with their peers to create a model, explaining how we see things and how light travels. 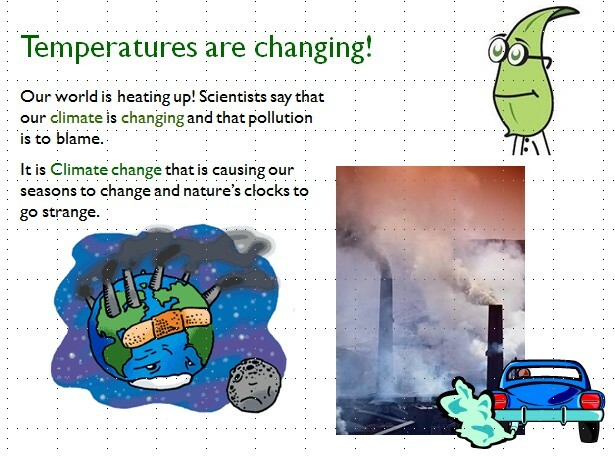 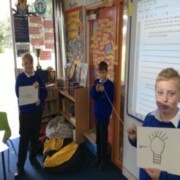 They created a presentation explaining this using scientific vocabulary. 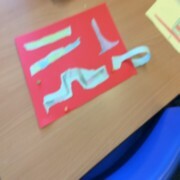 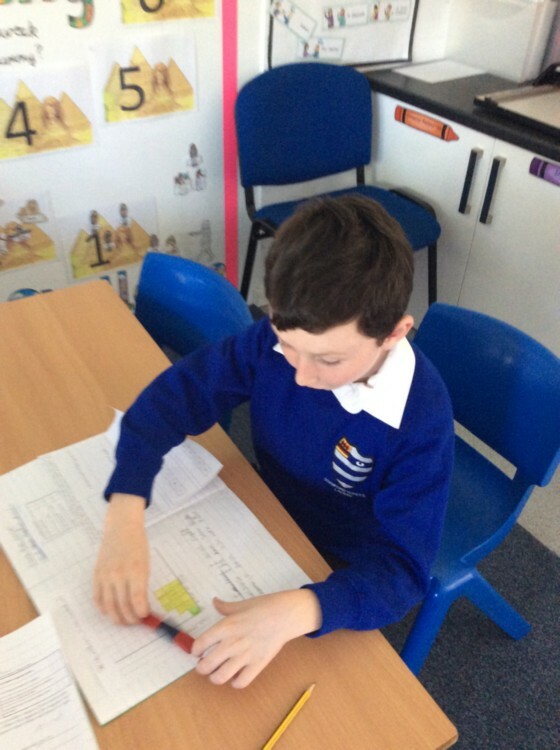 As a part of our learning in Science we have been looking at forces. 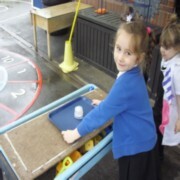 We have learnt that forces act on objects such as pushing and pulling things. 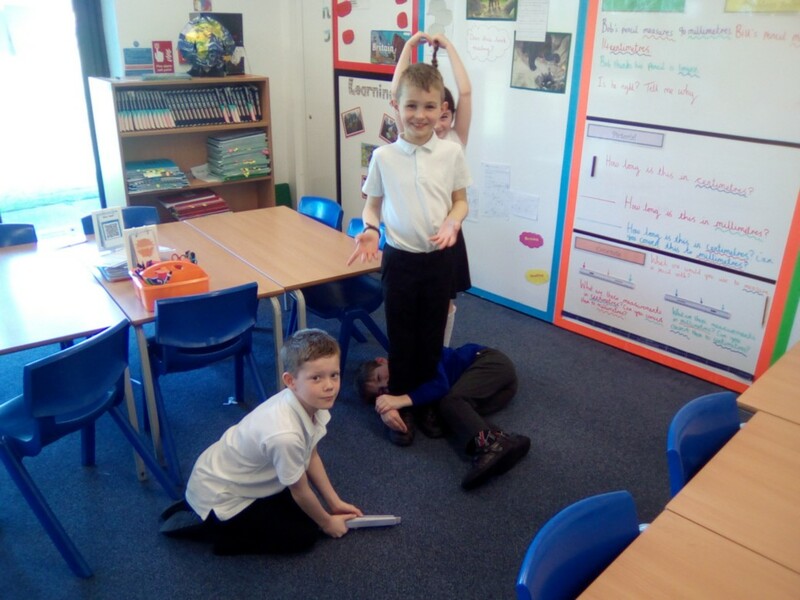 This week we have been leaning about the force called friction. Friction is a force that holds back the movement of a sliding object. 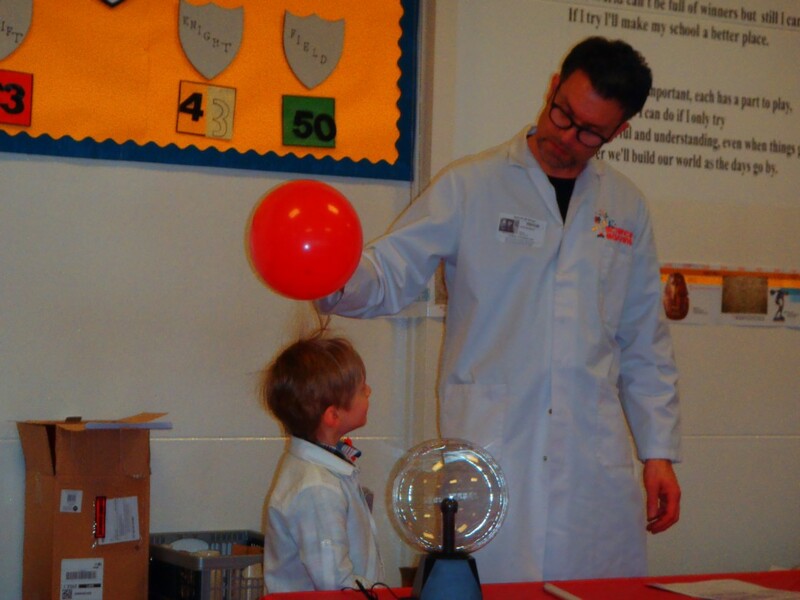 You will find friction everywhere that objects come into contact with each other. 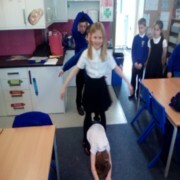 The force acts in the opposite direction to the way an object wants to slide. 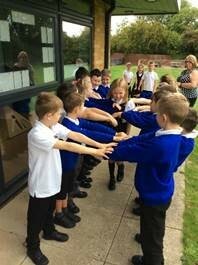 To help the children understand how brushing against something can slow things down we walked through a ‘human’ corridor. 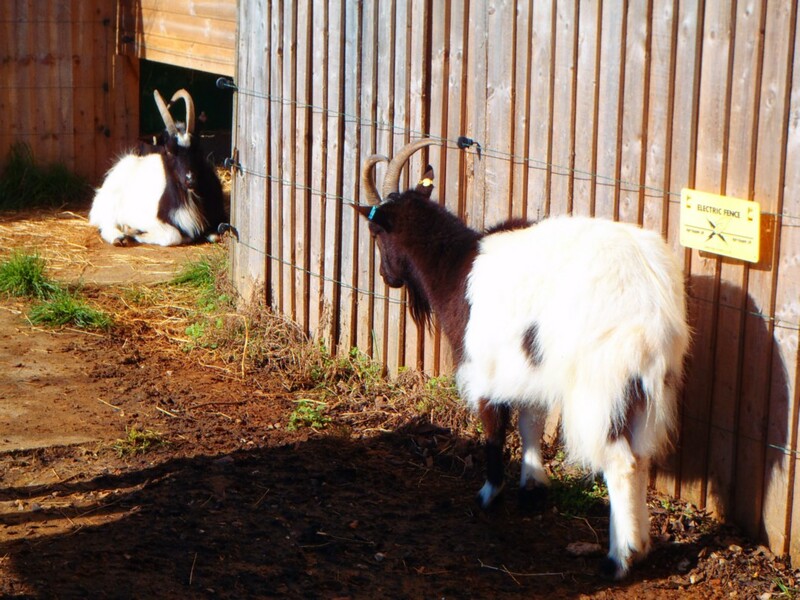 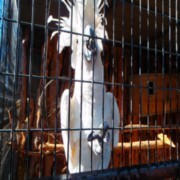 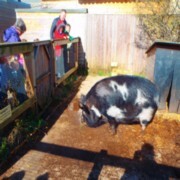 It was easy until everyone put their hands out and they brushed against us as we walked. 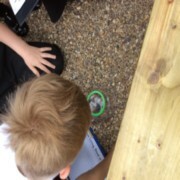 We then conducted an investigation to see how different surfaces and friction can affect the movement of a car. 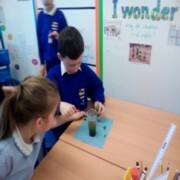 We used wood, bubble wrap, a towel, a carpet and sandpaper. 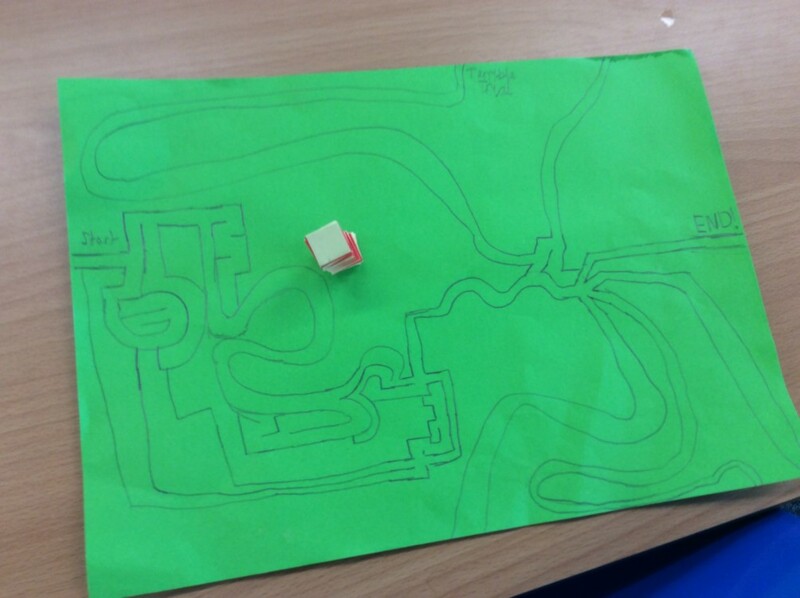 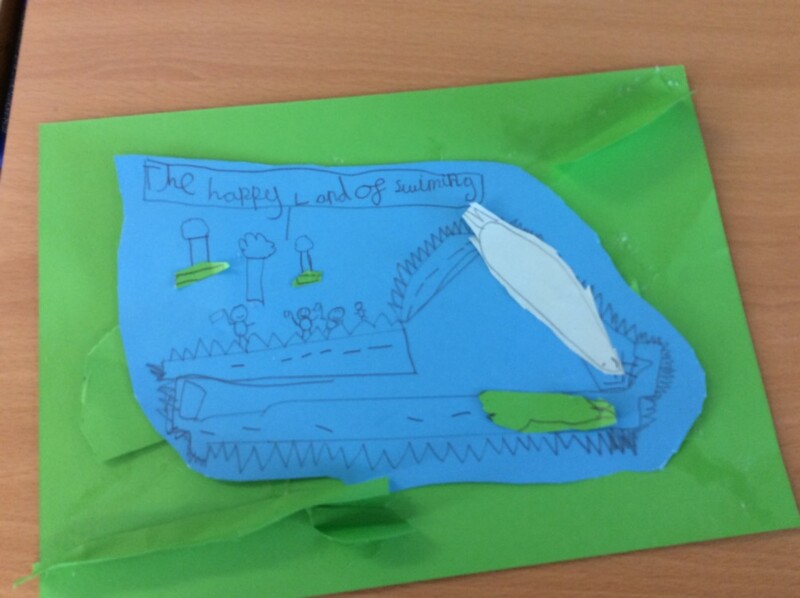 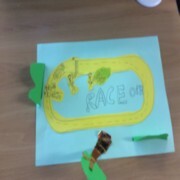 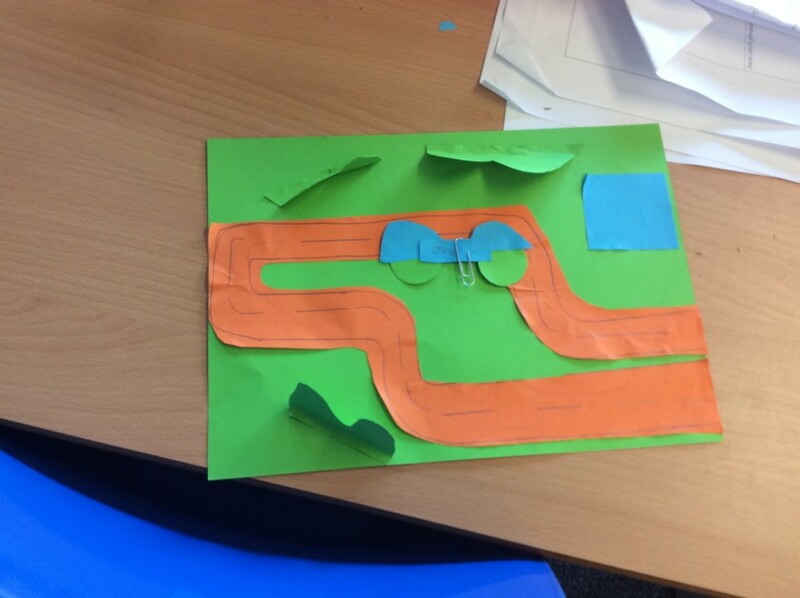 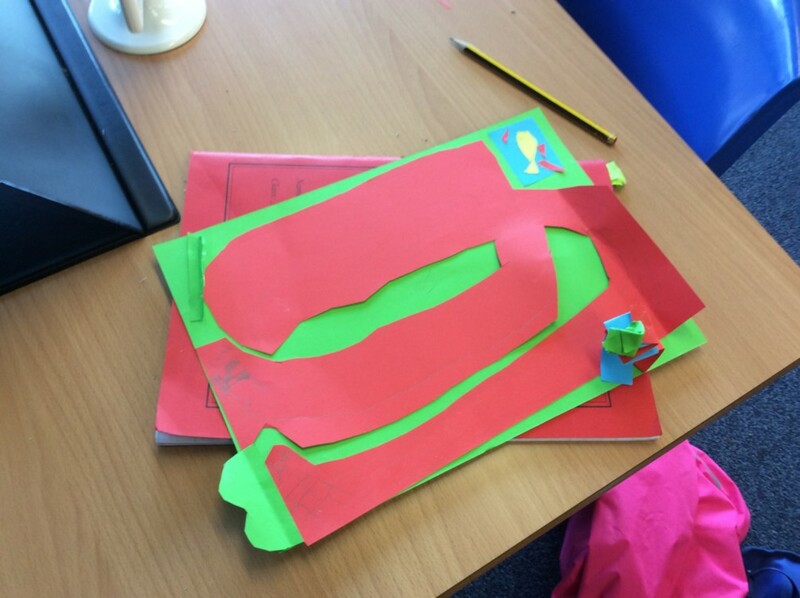 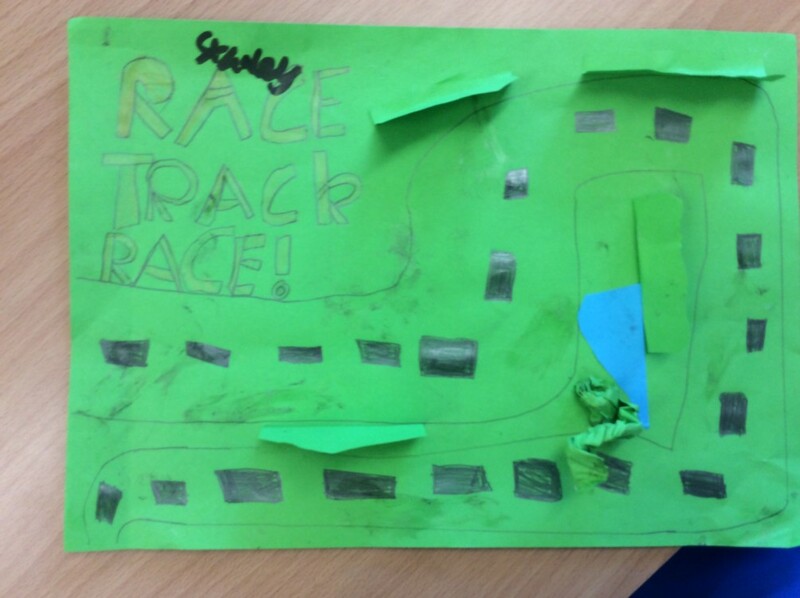 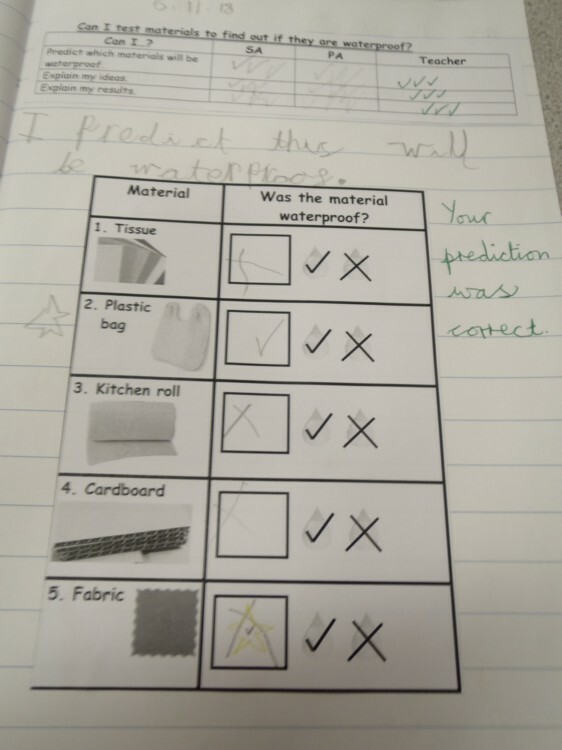 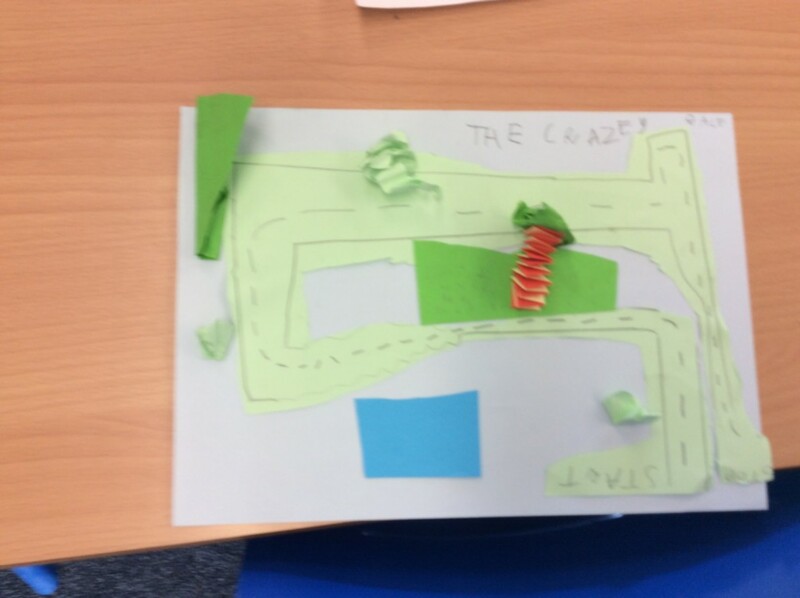 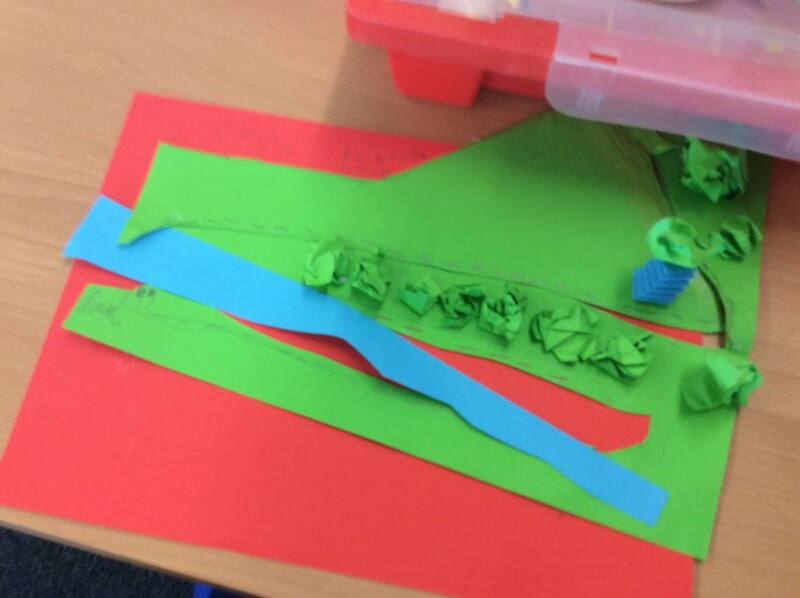 The children felt the different surfaces and made a prediction about which surface would stop the car from moving by causing the most friction. 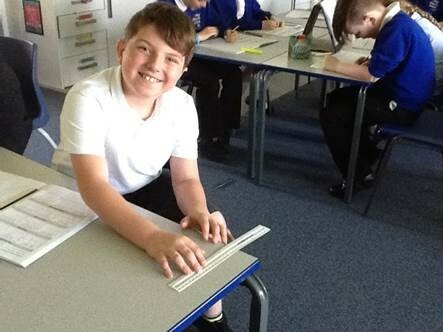 Look at how high the ramp got when testing the carpet before the car actually started to move!!! We concluded that the carpet caused the most friction as it stopped the car from moving until the ramp was 80 cm high. 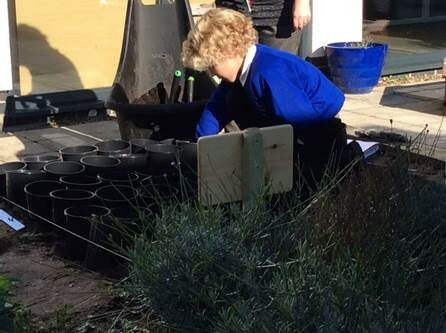 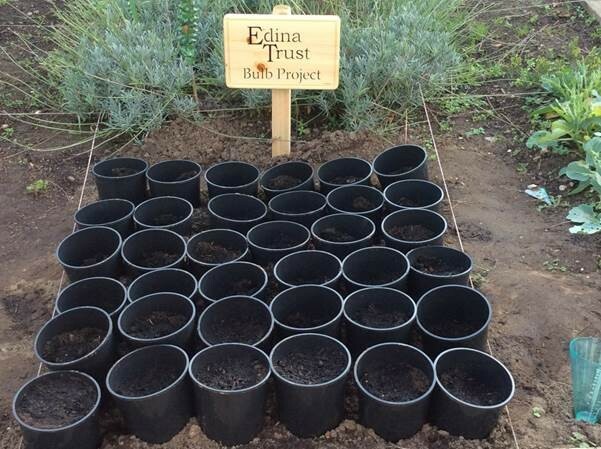 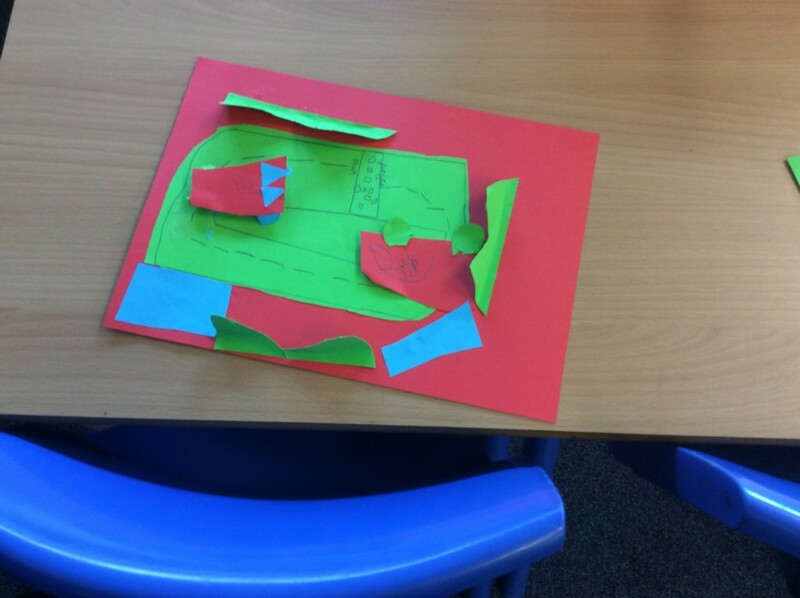 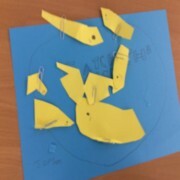 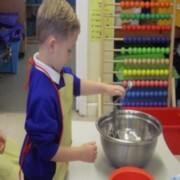 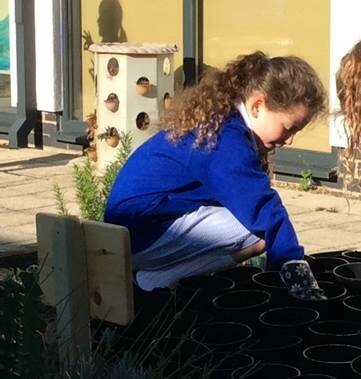 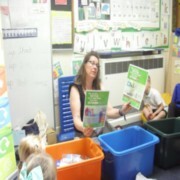 This term our collaboration work with Sunflower and Seedlings class has been all about recycling. 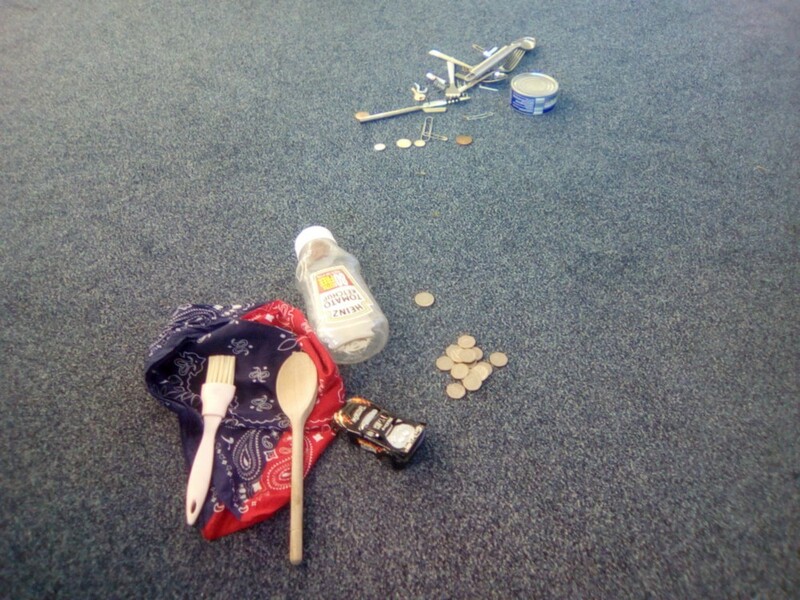 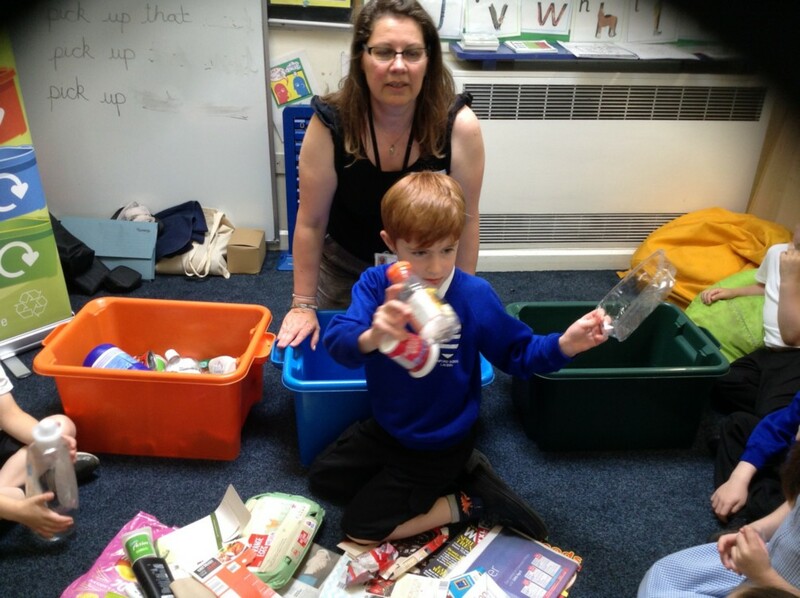 We first identified which things can be recycled around our classroom and at home. 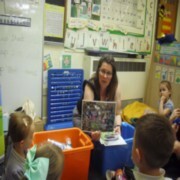 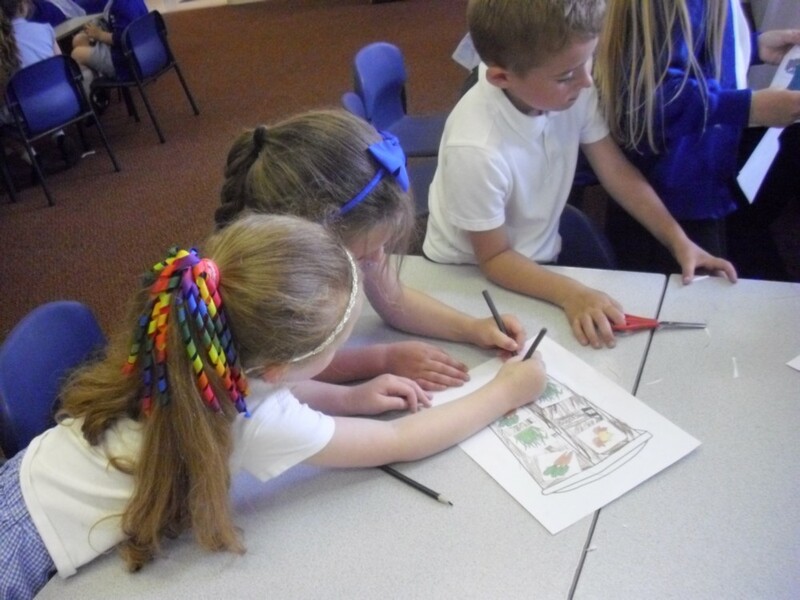 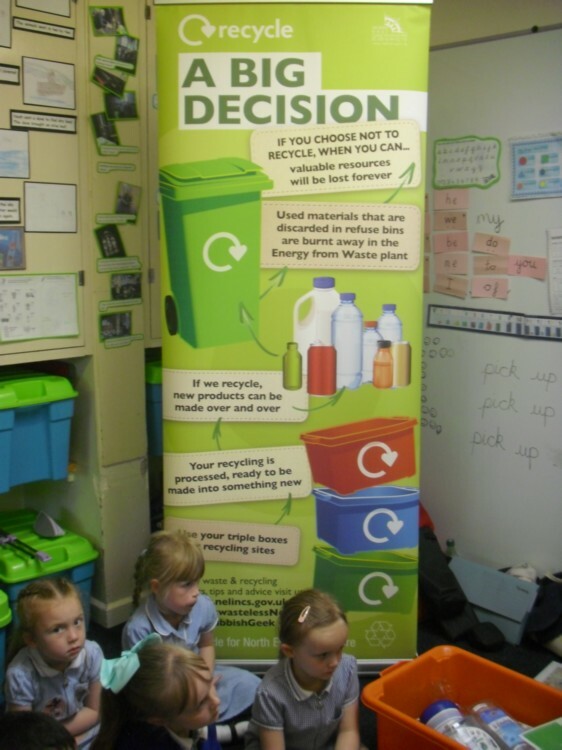 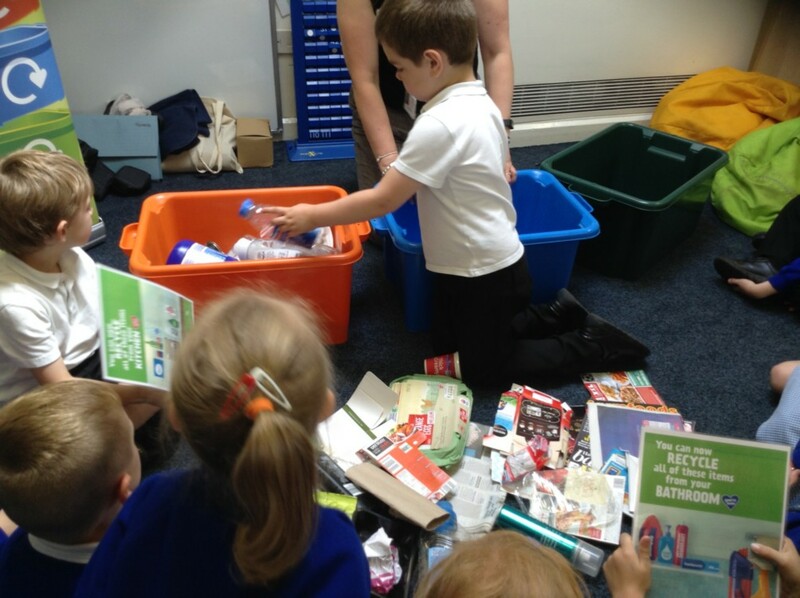 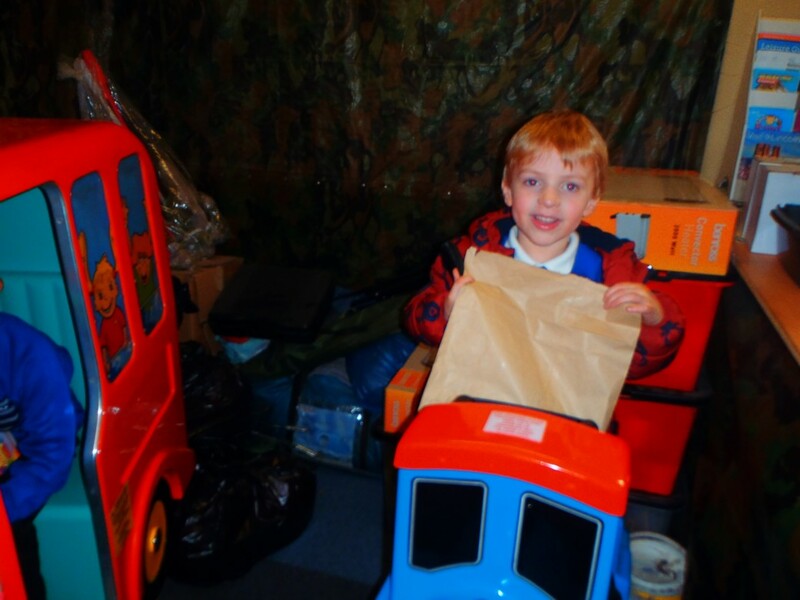 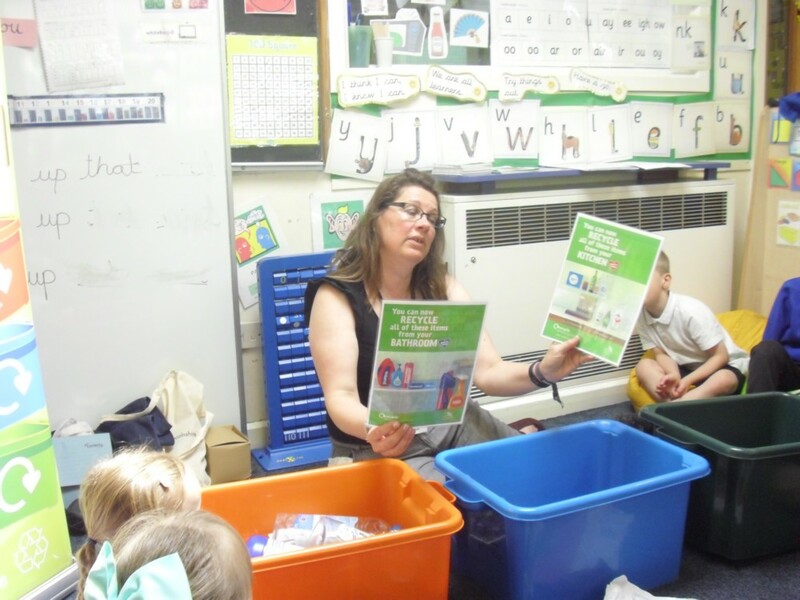 Then we sorted some pictures into the correct recycling boxes and bins. 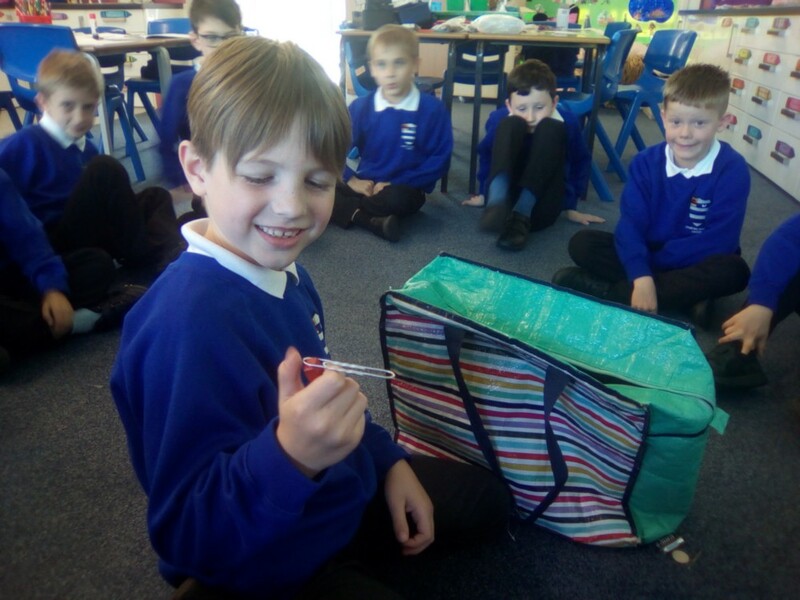 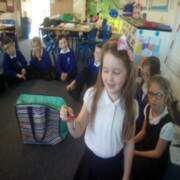 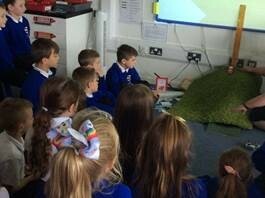 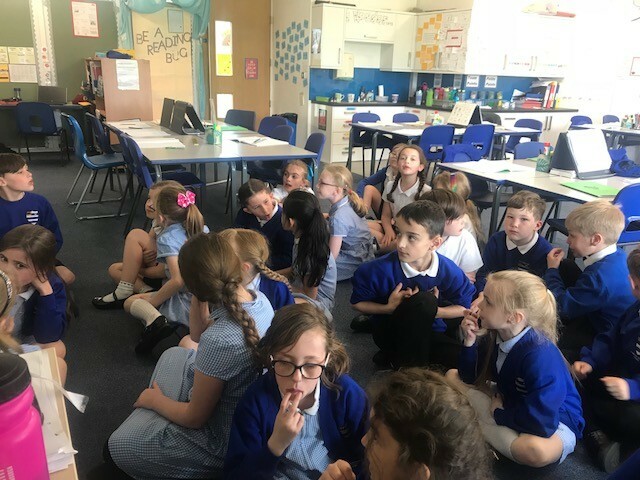 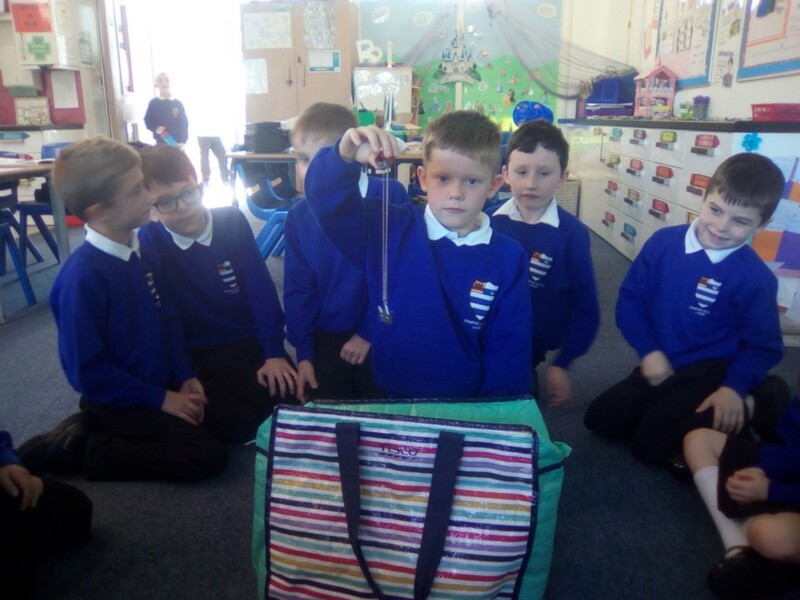 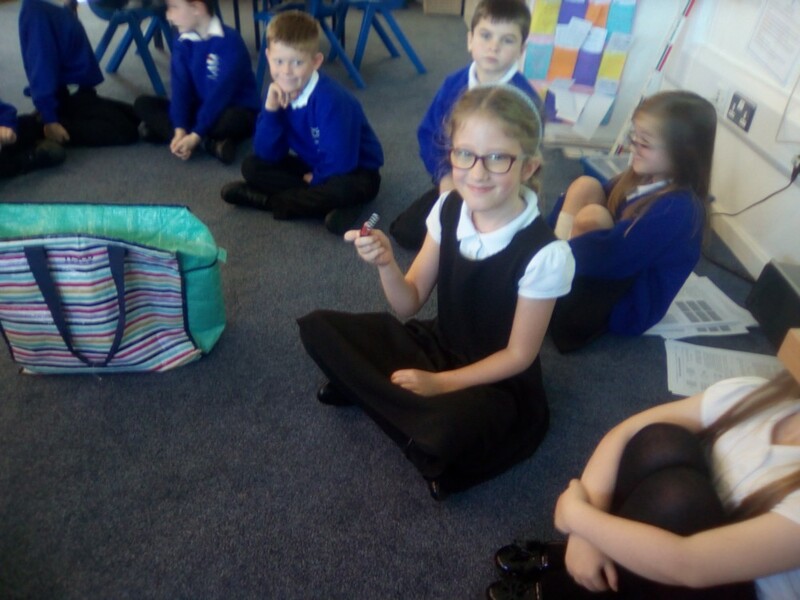 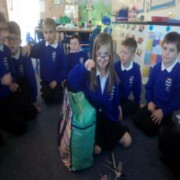 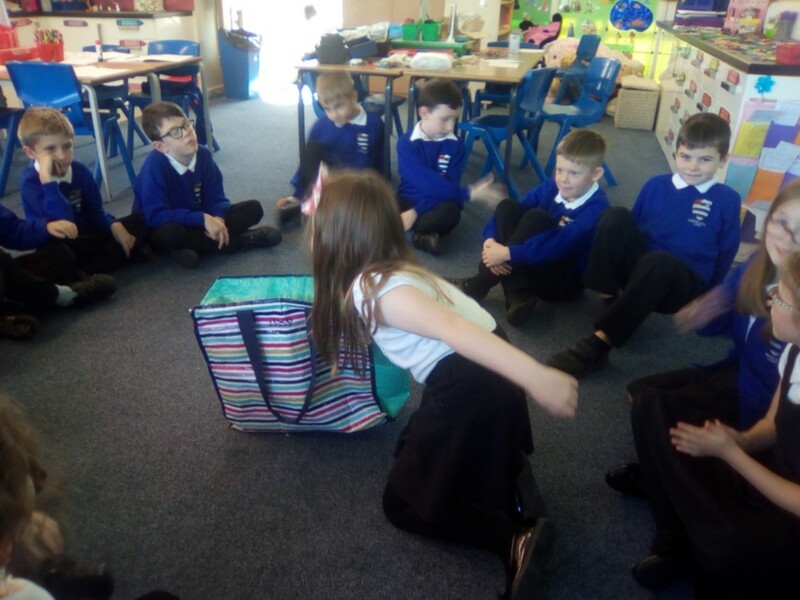 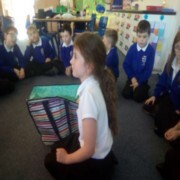 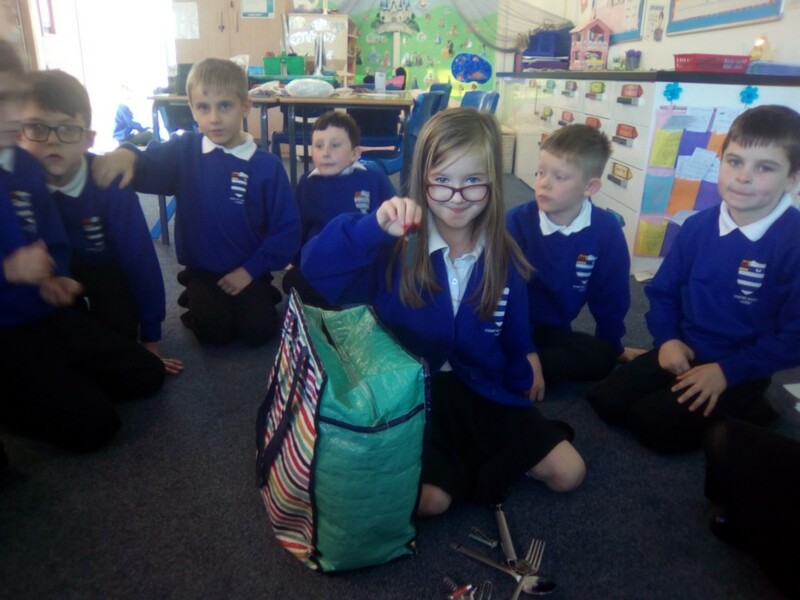 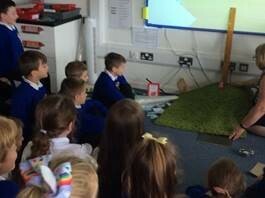 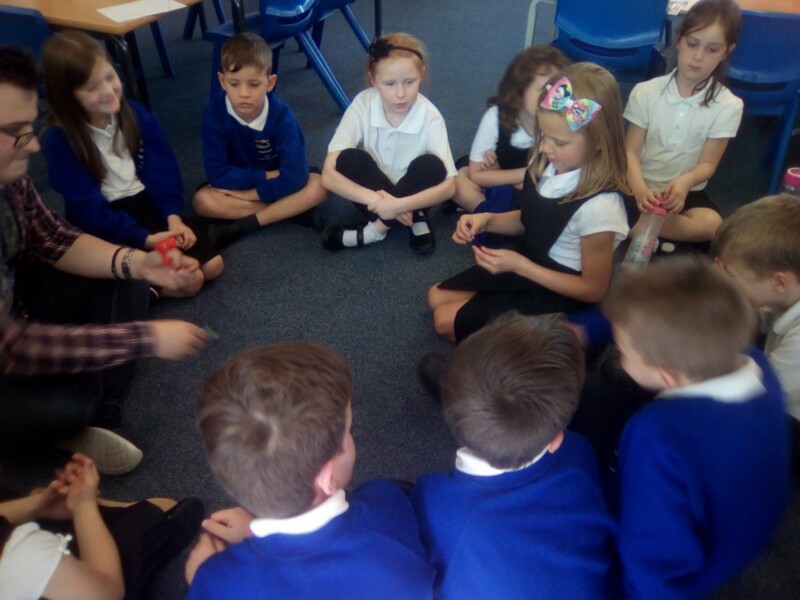 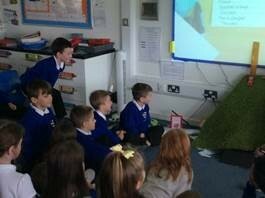 We listened to Chrissie from North East Lincs Council, who told us some interesting facts such as; When 1 can is recycled it gives enough electricity to power a TV for 4 hours! 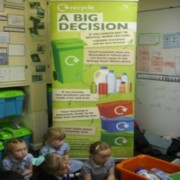 Finally, we made a poster to let others know all about recycling. 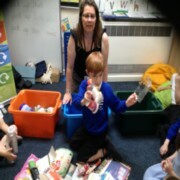 Joshua - Crisp packets can’t be recycled. 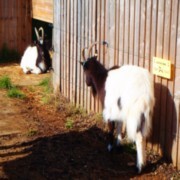 They go into the normal bin. 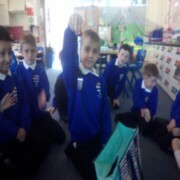 That rubbish is burnt to create electricity. 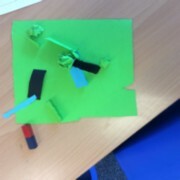 Jack - Glass goes into the green box. 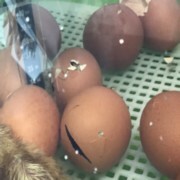 The glass gets crushed up and turned back into new glass. Neve - The big brown bin is for garden waste, like grass cuttings or twigs from trees. 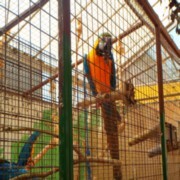 Ollie - The plastic goes in the orange box like plastic bottles. 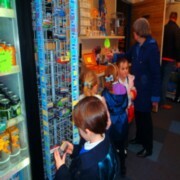 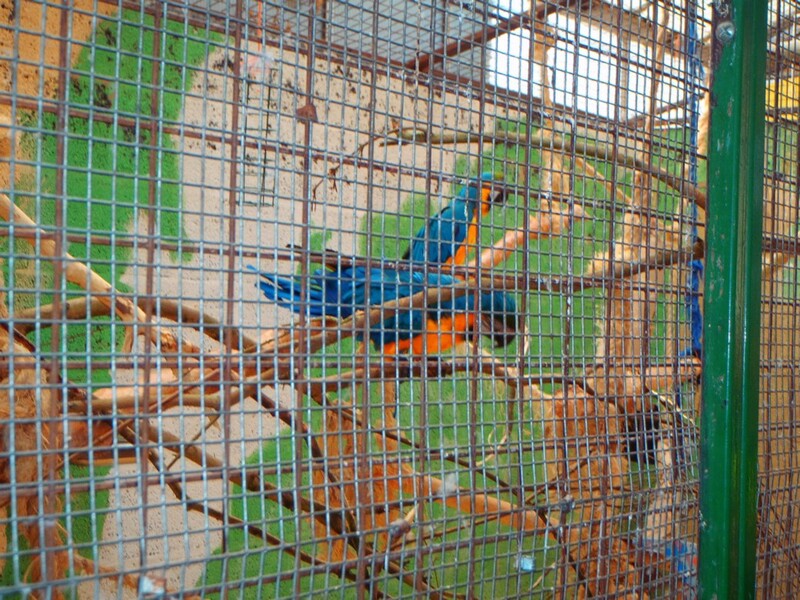 Tin cans go in the orange box too. 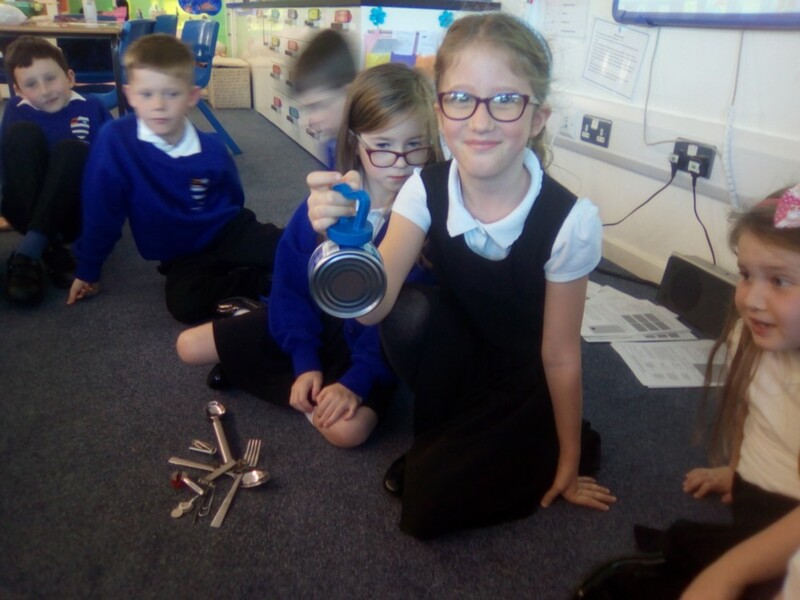 Lincoln - 1 tin can gives 4 hours of electric to make a TV work. 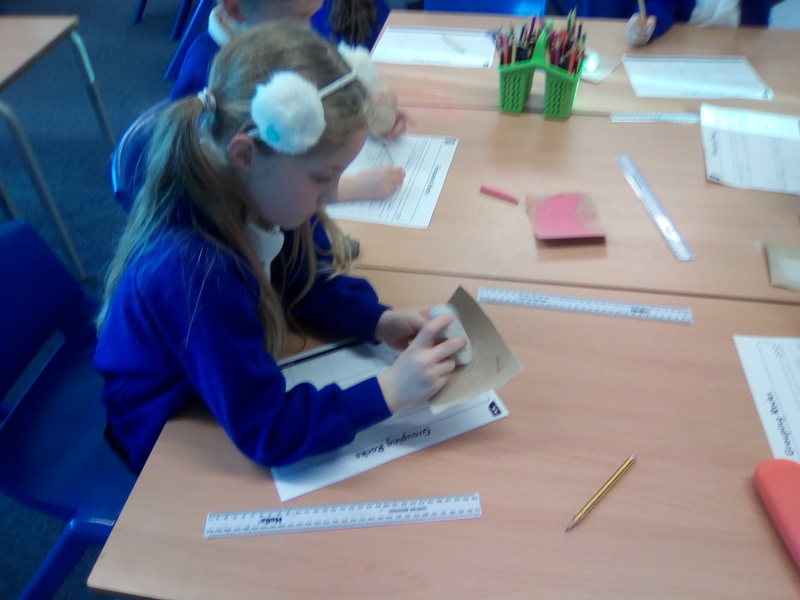 Oliver L - Paper and cardboard go in the blue box. 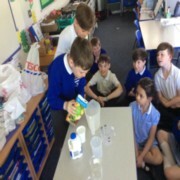 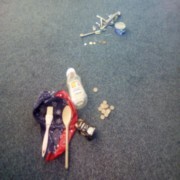 Lewis - I learnt that yoghurt pots can’t be recycled but you could reuse it as a glue pot. In Barley class, we have started to learn about the different parts of the circulatory system and how it functions. 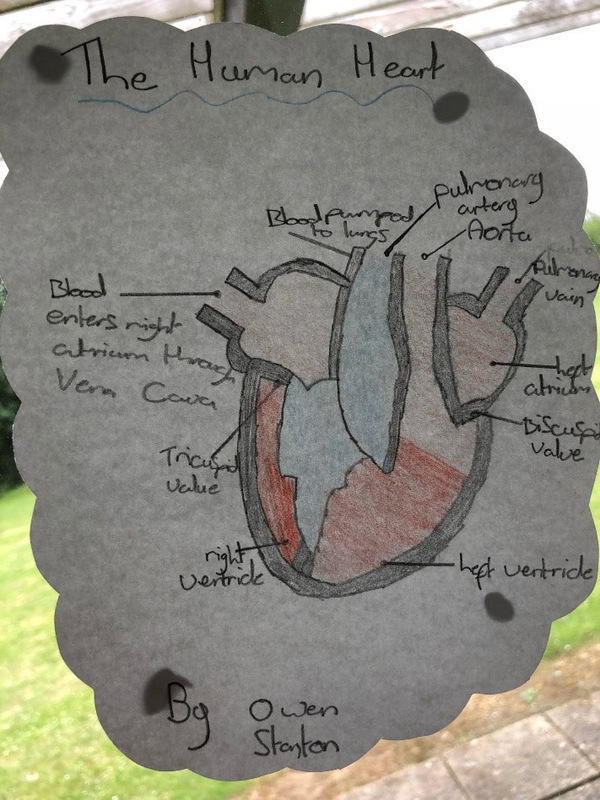 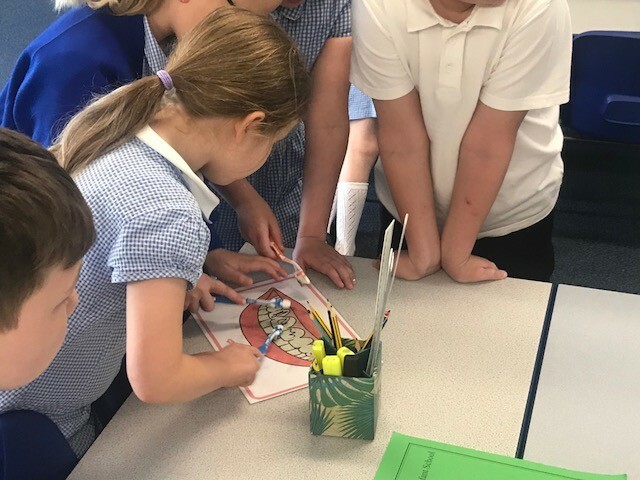 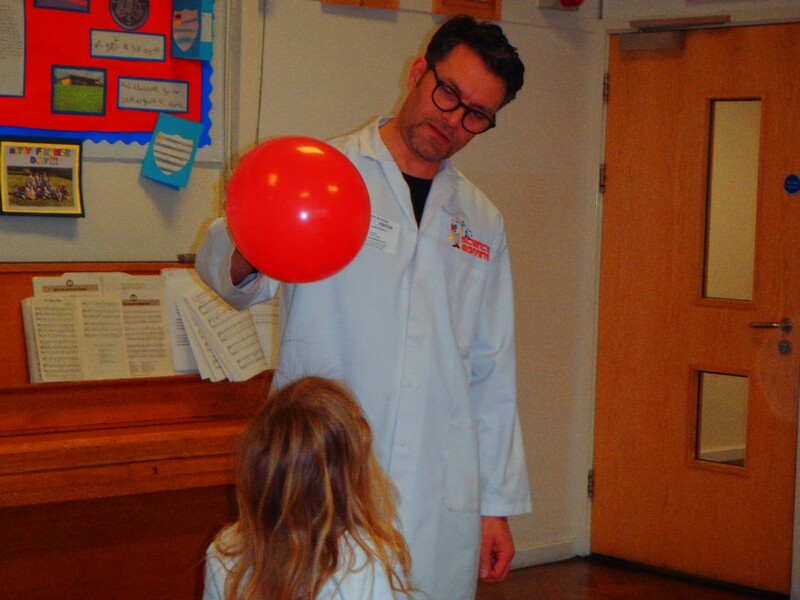 We have begun by focussing on the heart and the children enjoyed learning about how the valves of the heart work to pump both oxygenated and de-oxygenated blood. 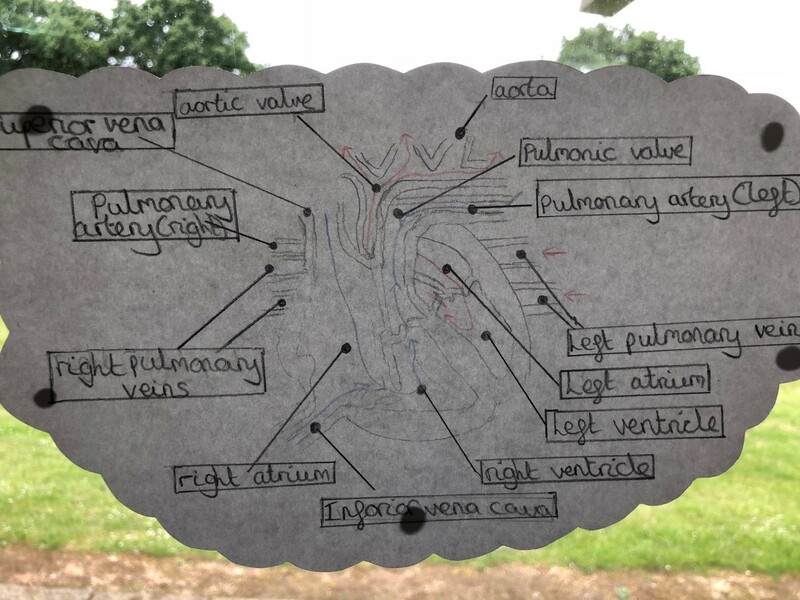 The morning’s work culminated in some fantastic scientific diagrams of the heart. 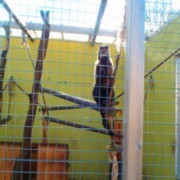 LQ: Can I identify and name a variety of plants and animals in their habitats? Can I classify and sort these into different categories? 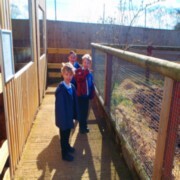 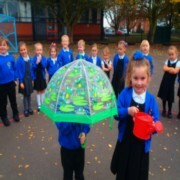 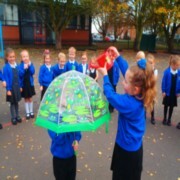 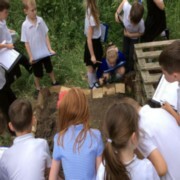 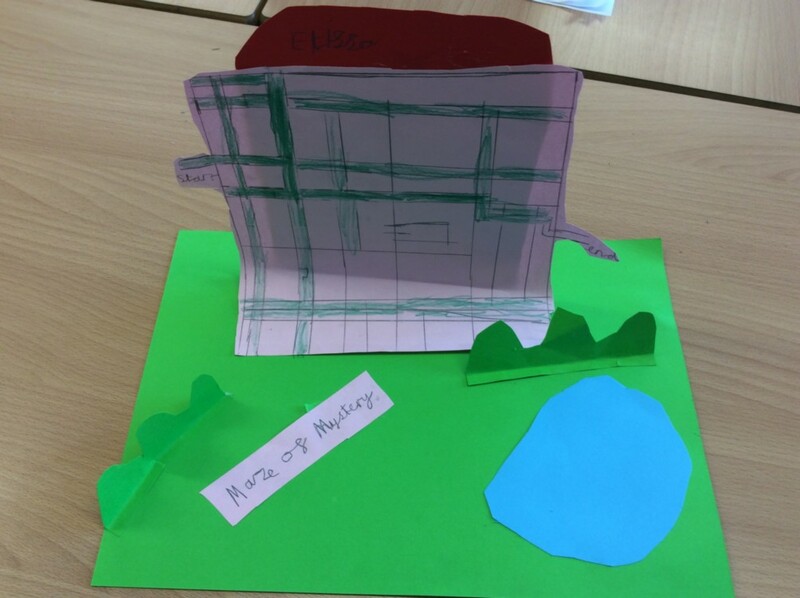 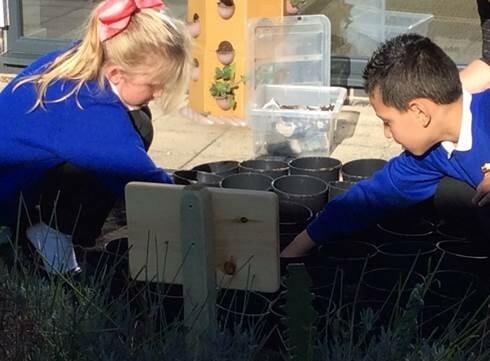 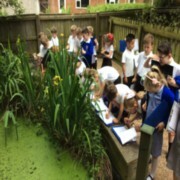 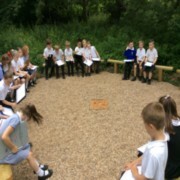 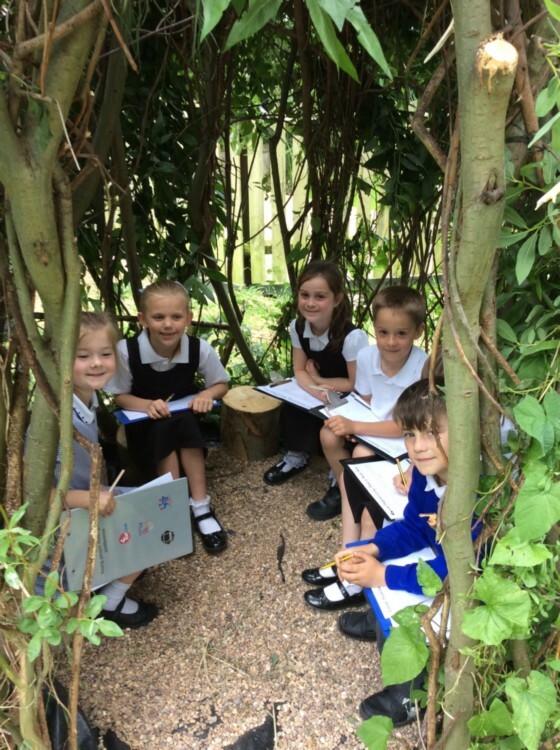 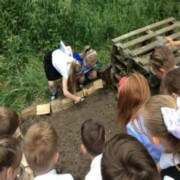 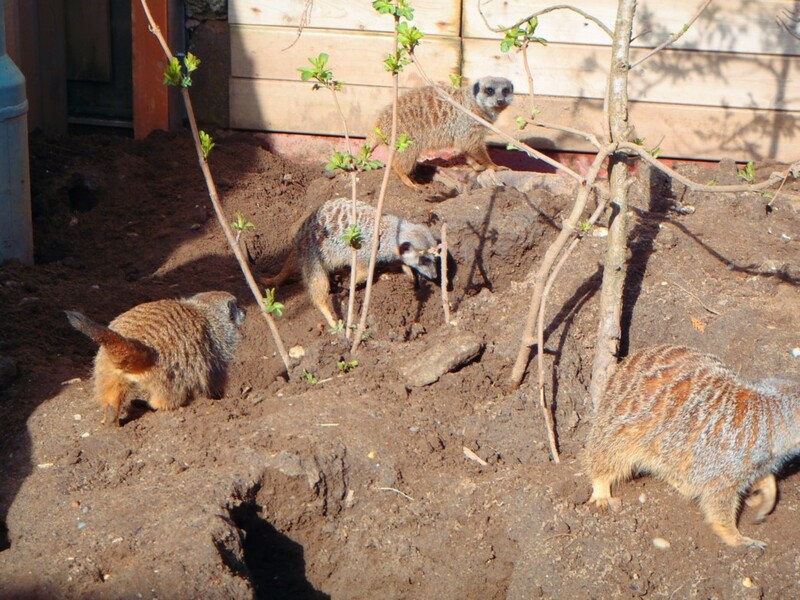 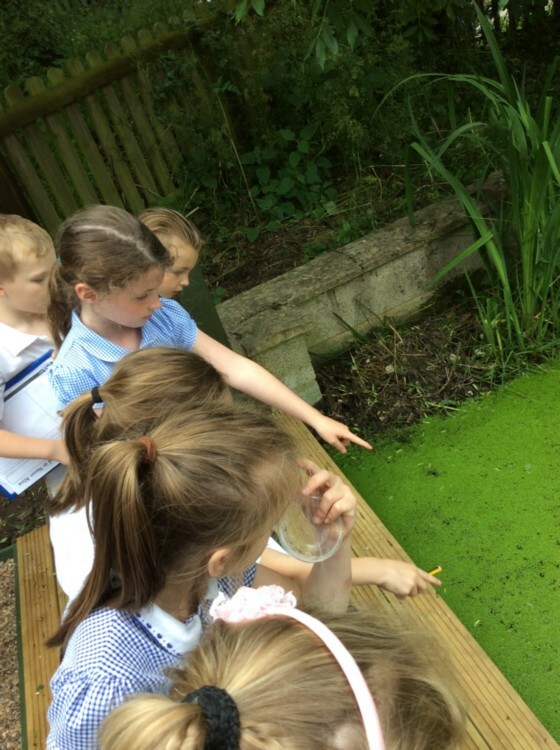 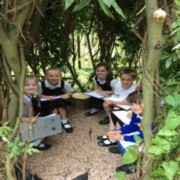 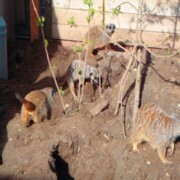 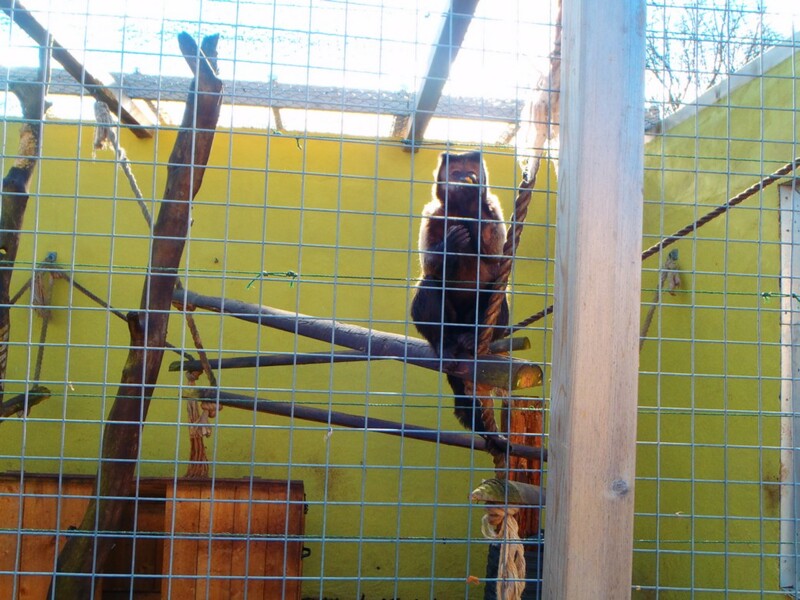 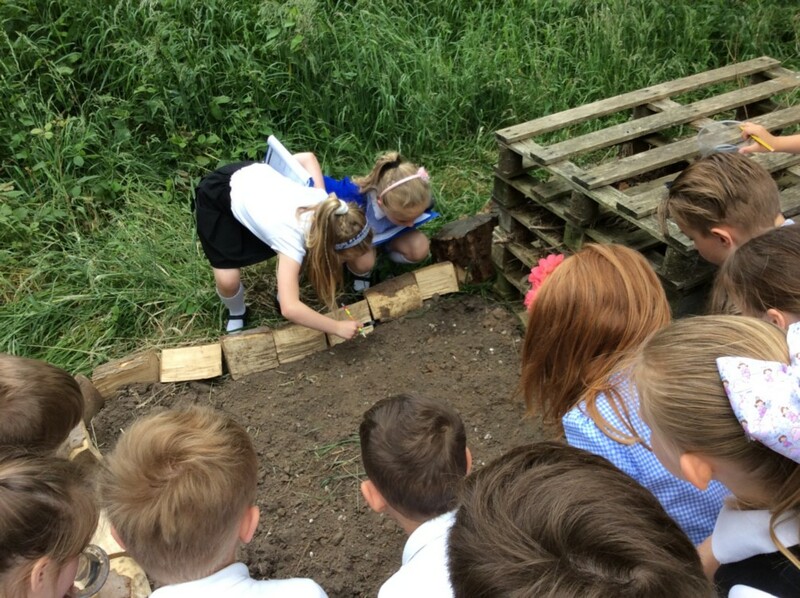 Poppy class used our outdoor learning area to learn about different habitats this lesson. We explored the outdoors to find a variety of plants and animals that live in this habitat and then discussed which category they would be in. 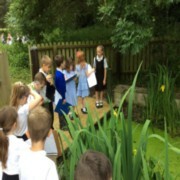 We searched both in the woodland habitat and the pond habitat. 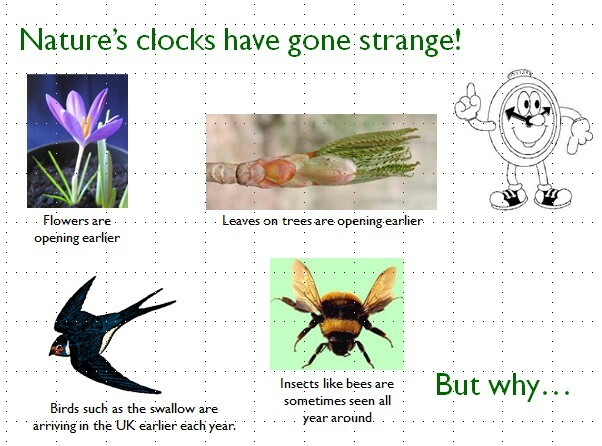 LQ: Can I explain the life processes and how these processes can tell us if something is living, dead or has never been alive? 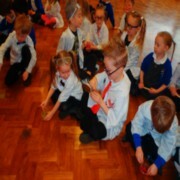 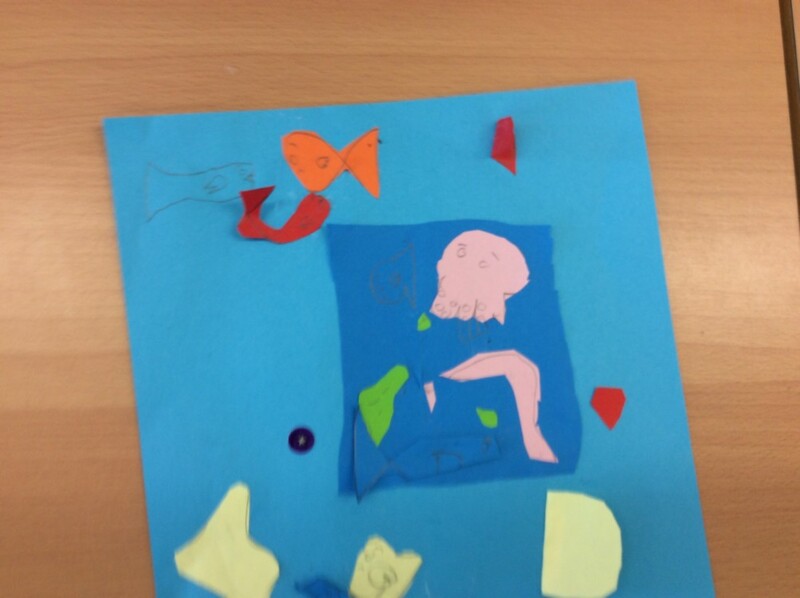 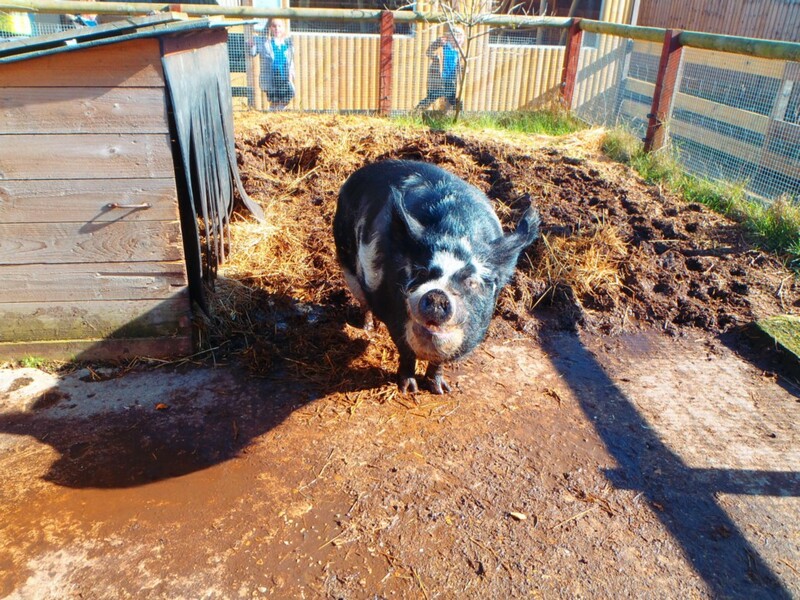 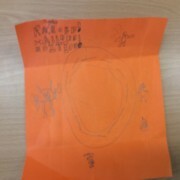 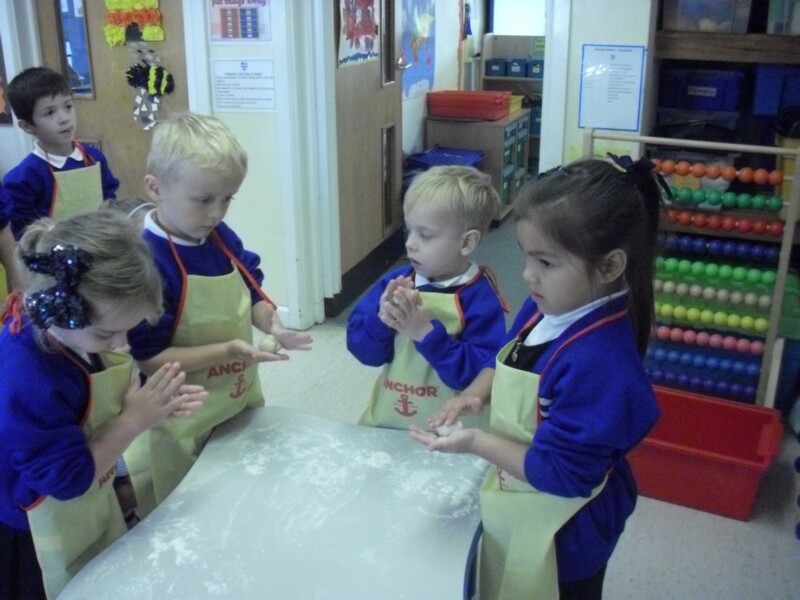 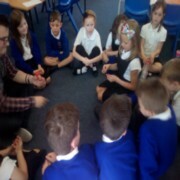 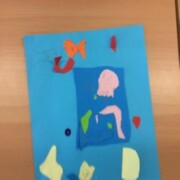 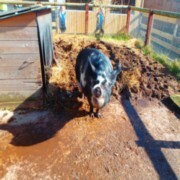 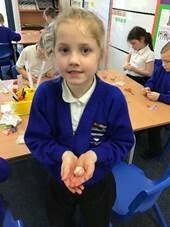 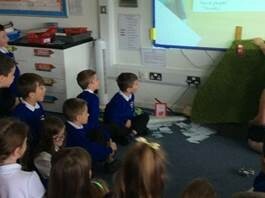 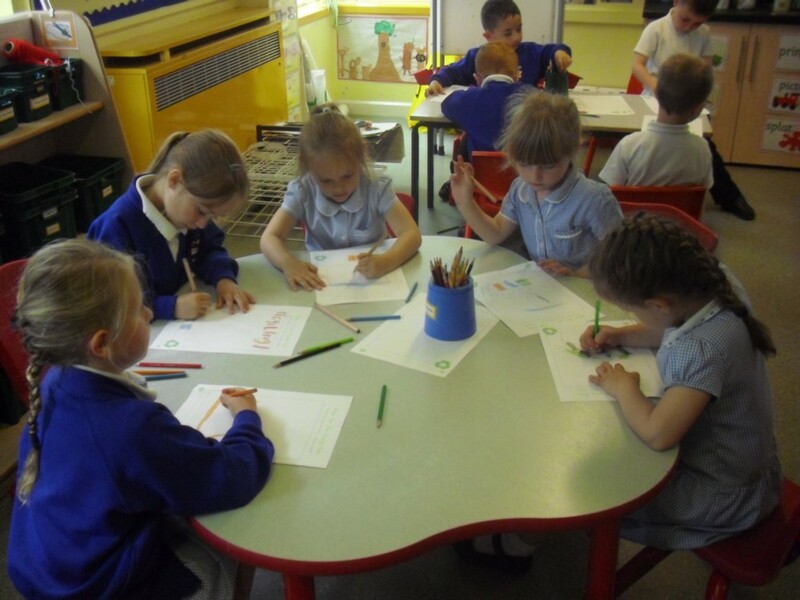 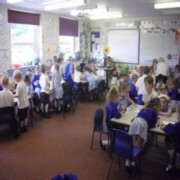 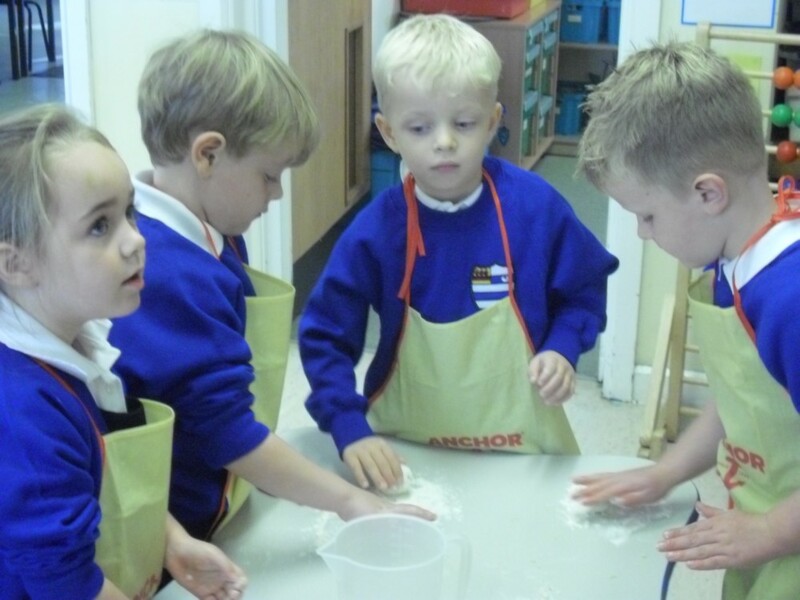 Poppy class learnt about the life processes using MRS GREN! 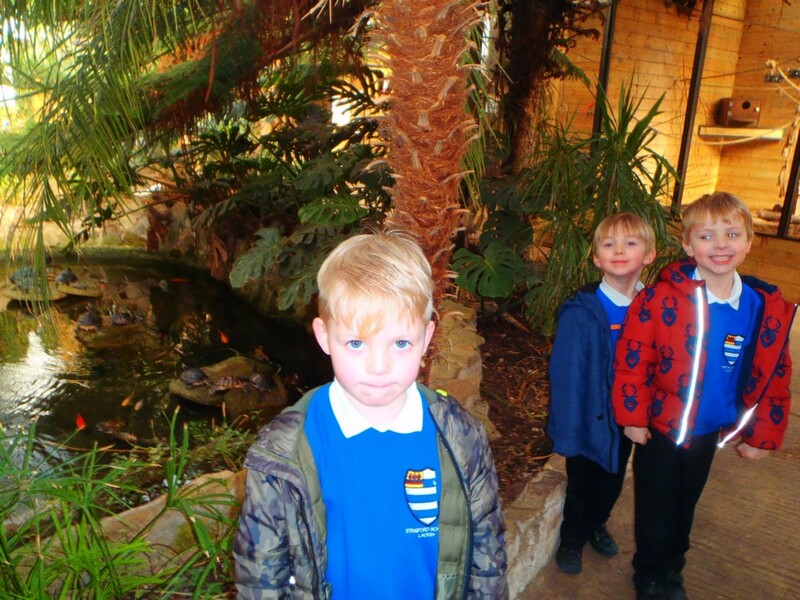 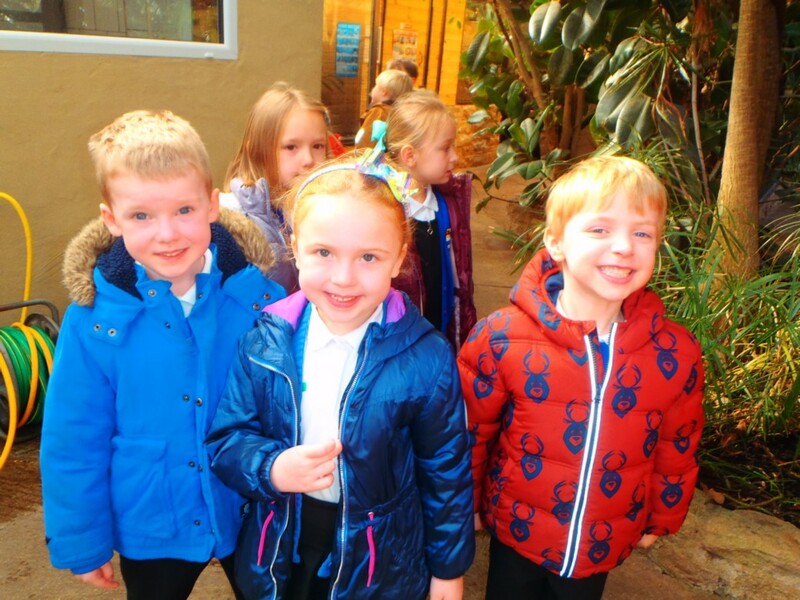 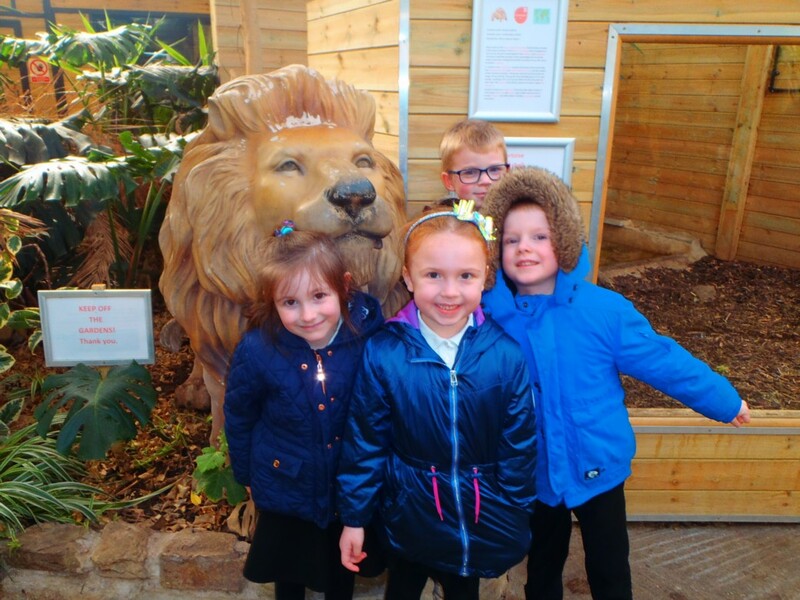 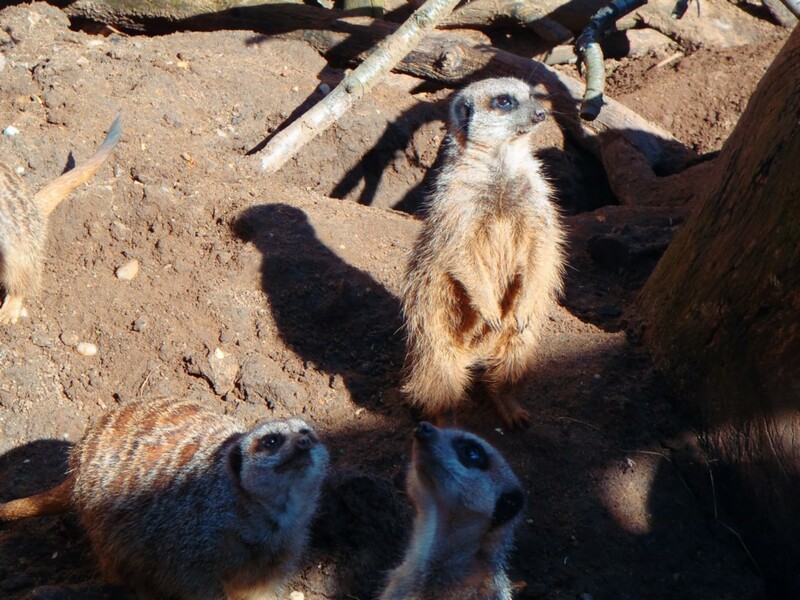 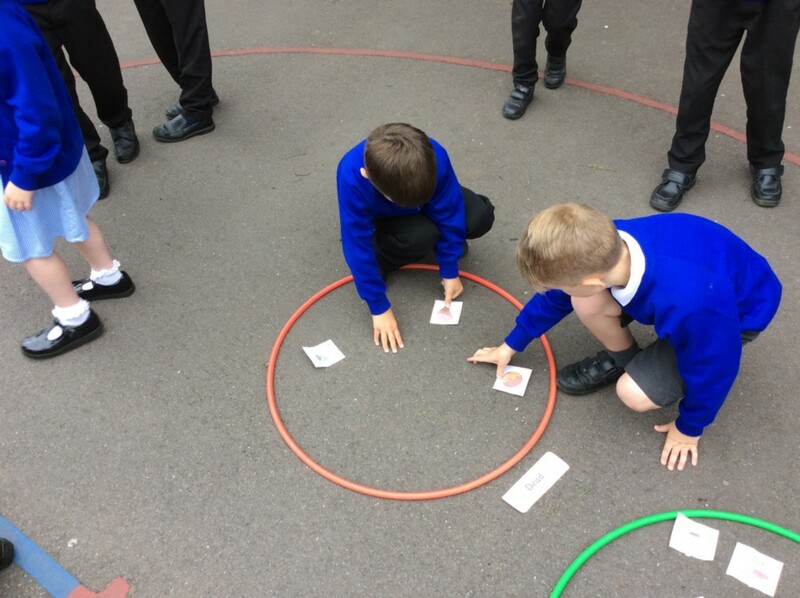 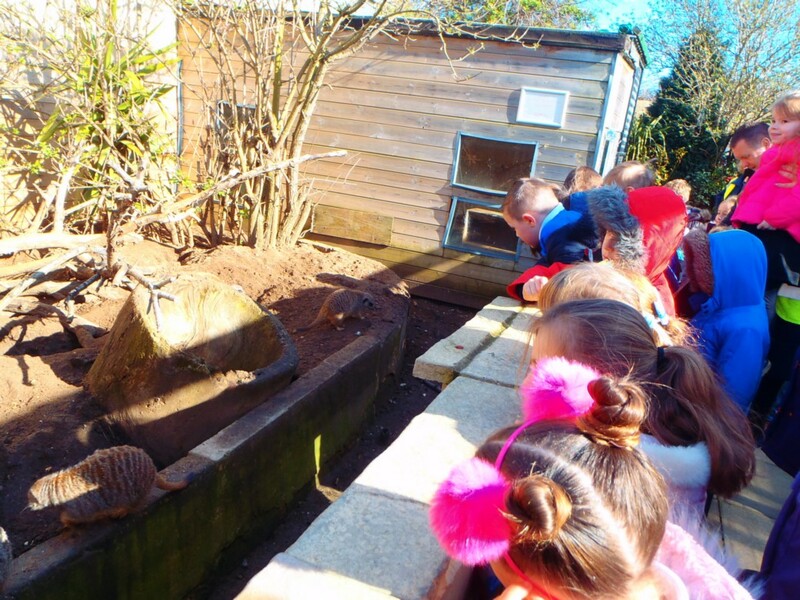 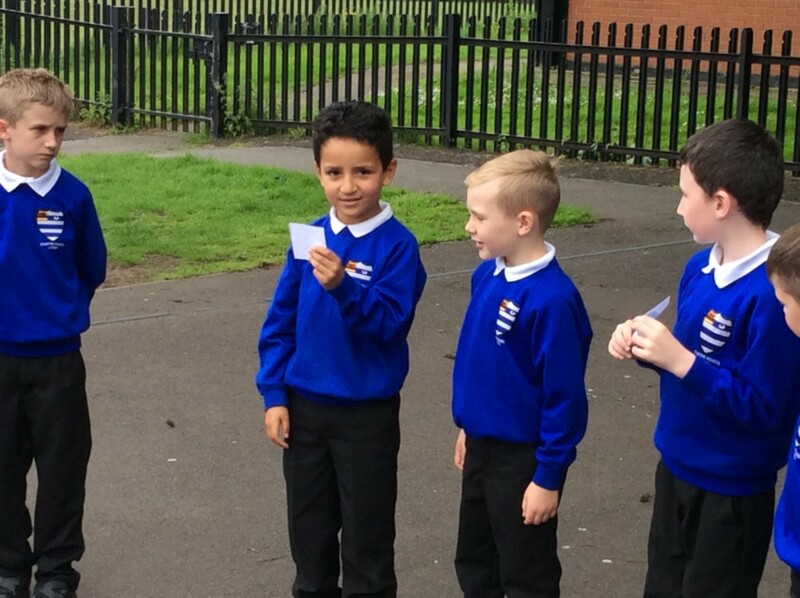 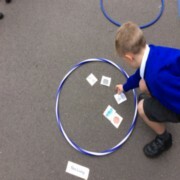 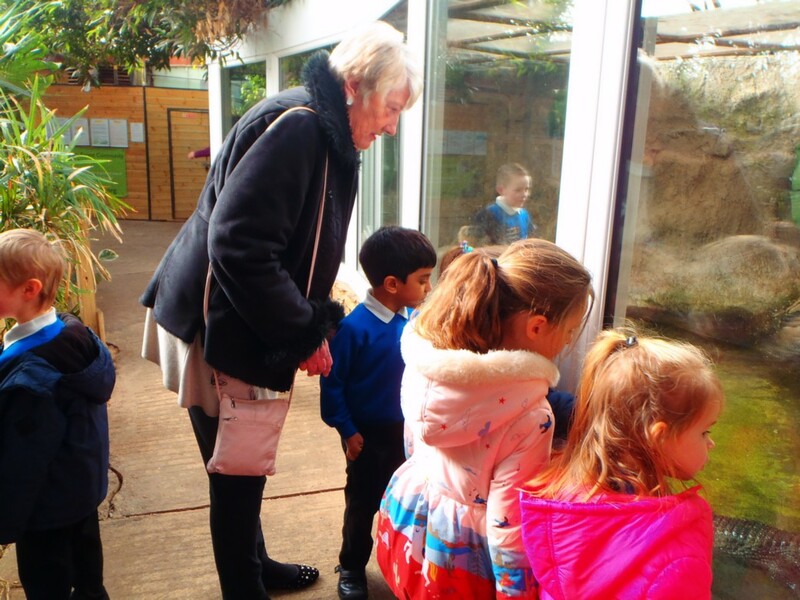 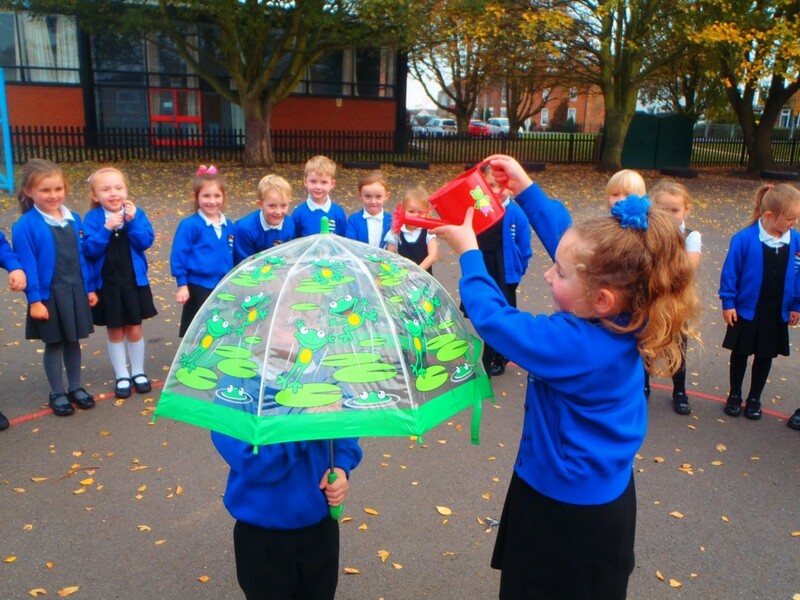 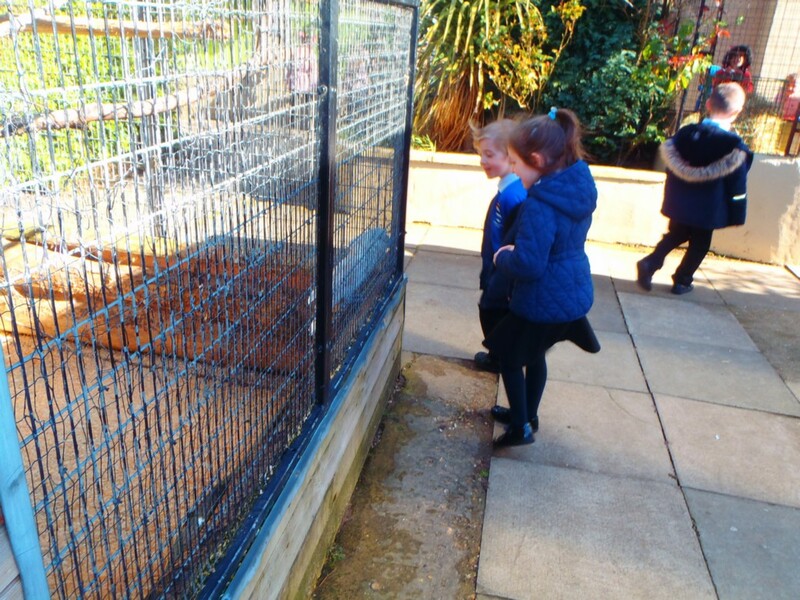 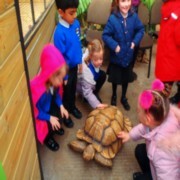 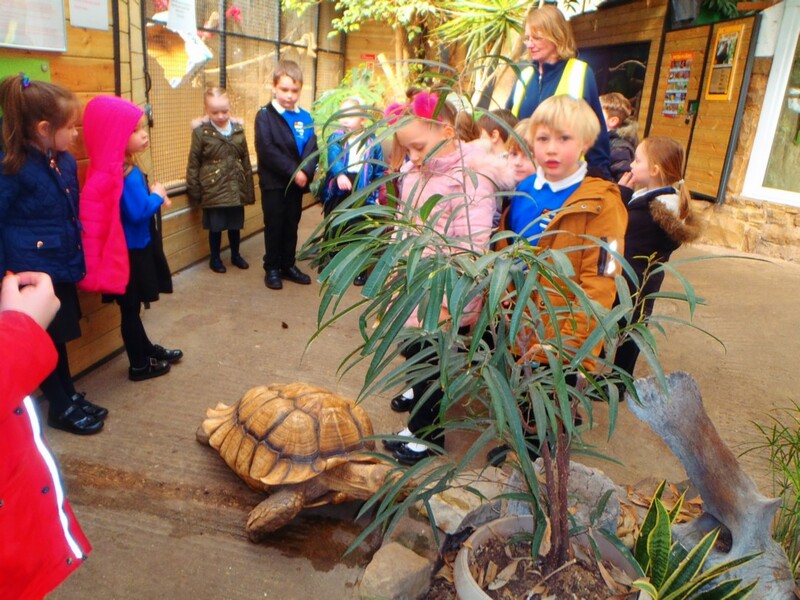 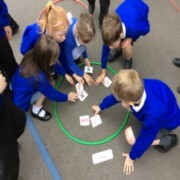 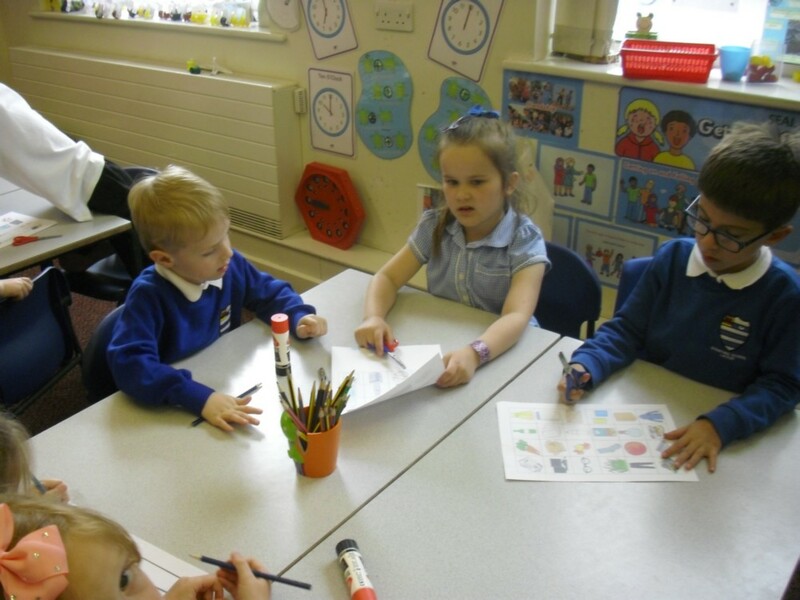 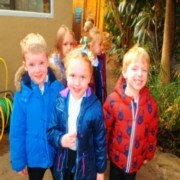 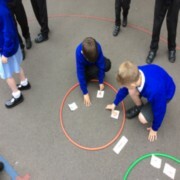 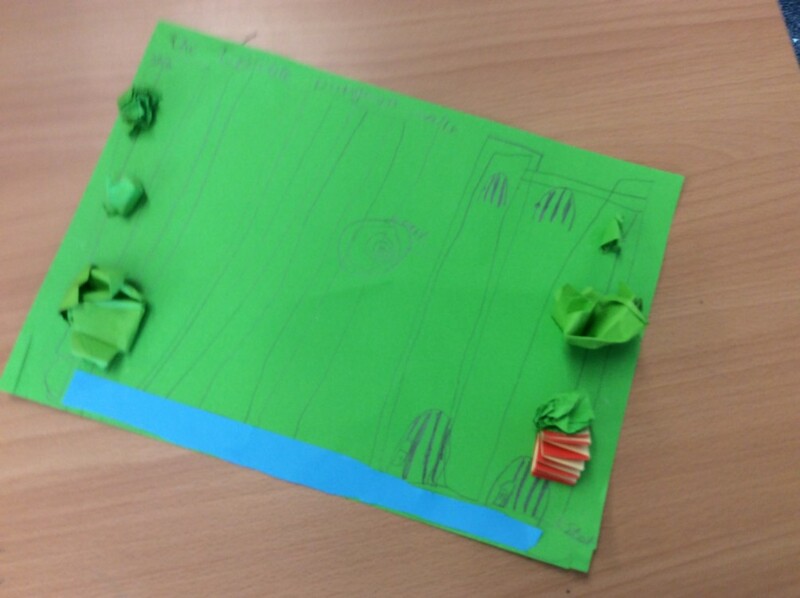 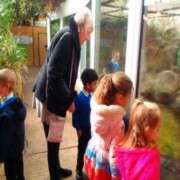 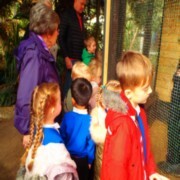 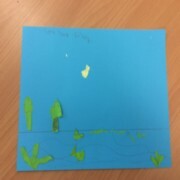 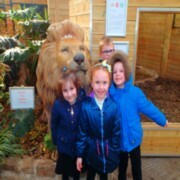 We then went outdoors to group different animals, plants and objects into different categories and had to give reasons why we thought they were in that particular group. 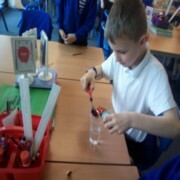 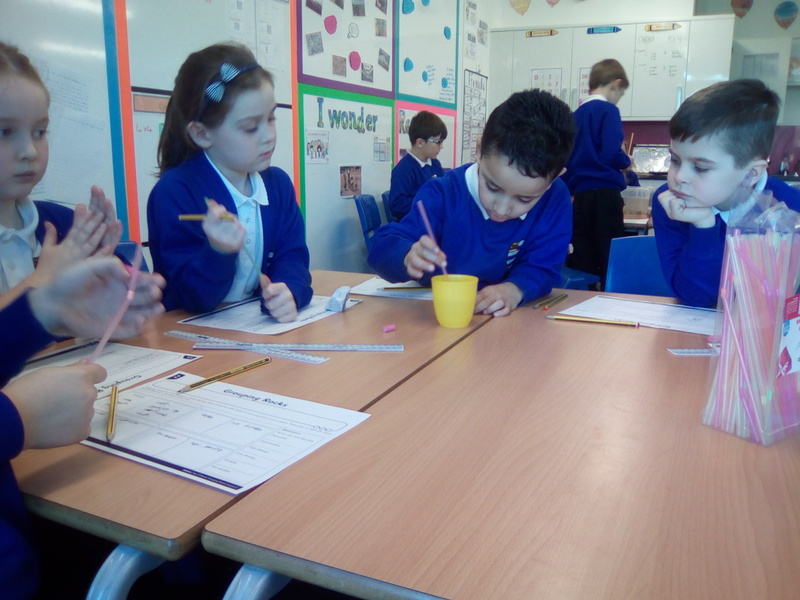 Juniper class started their investigation on the effects different liquids have on our teeth. 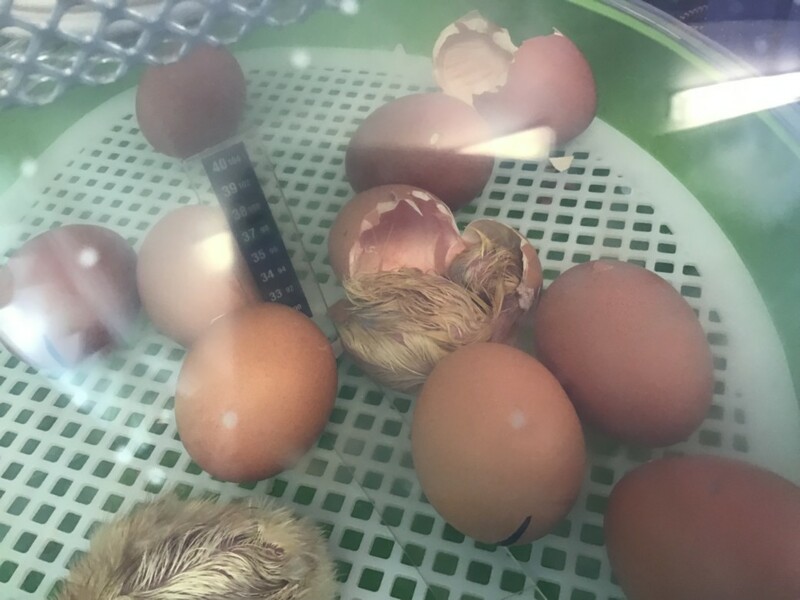 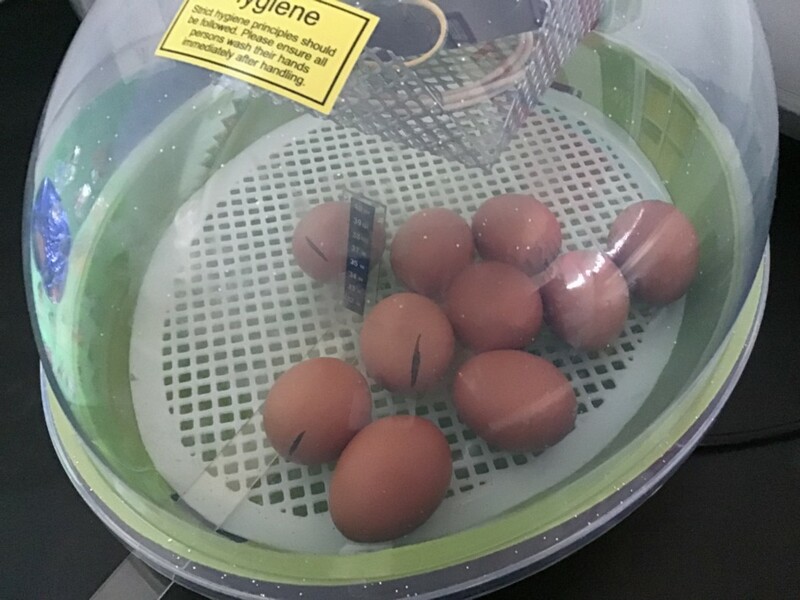 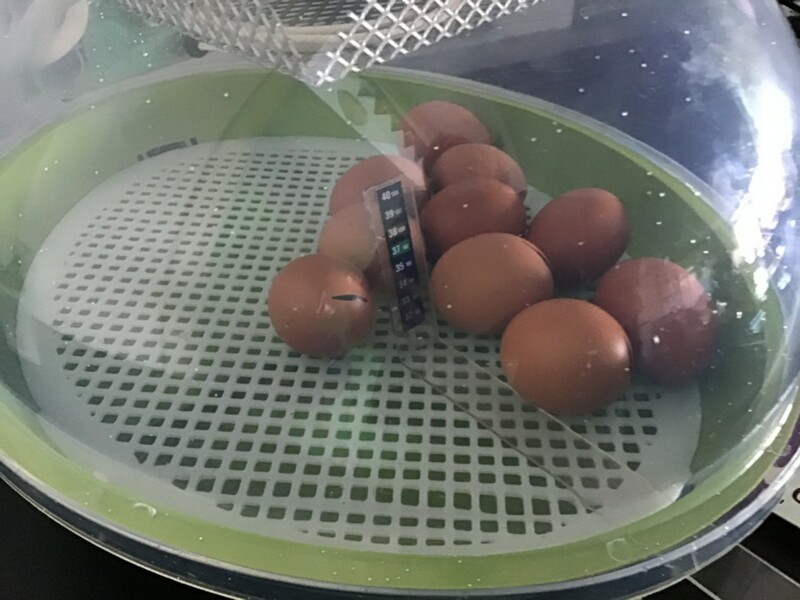 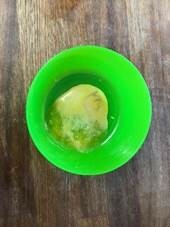 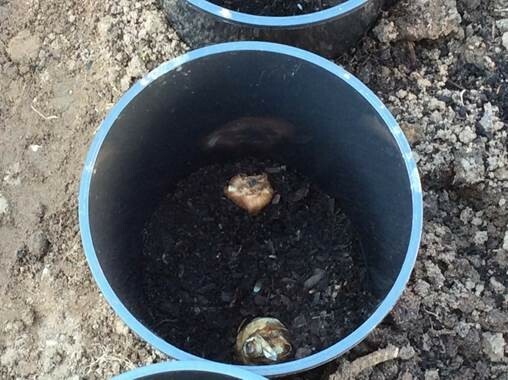 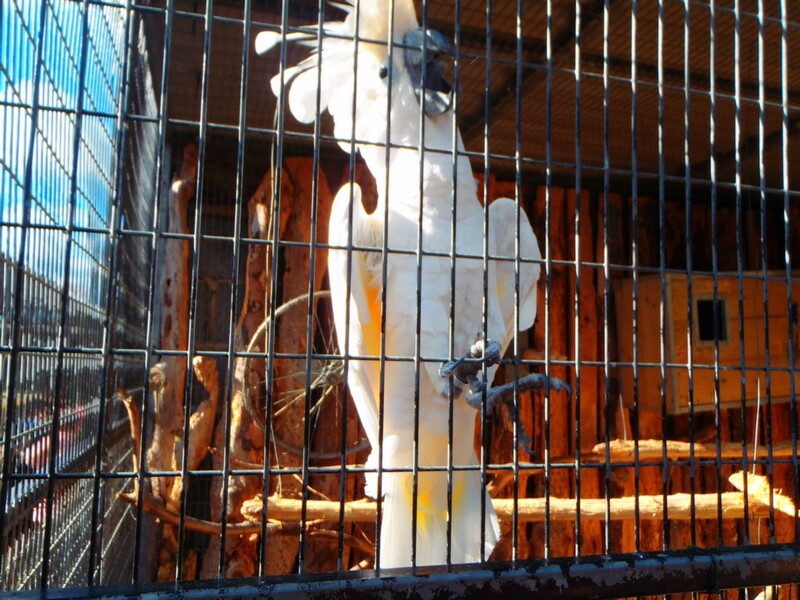 We have used five different liquids and will be monitoring the shell of the egg over 7 days. 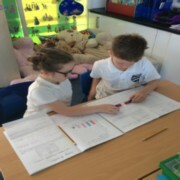 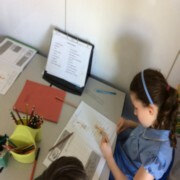 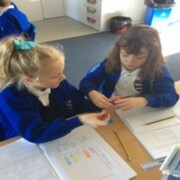 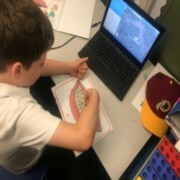 We will be recording our results and then explaining what we have found out, using scientific language about the teeth. 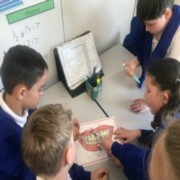 LQ: Can I learn about tooth decay and create an investigation to investigate the effects different liquids have on our teeth? 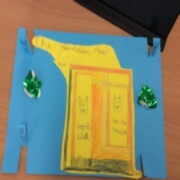 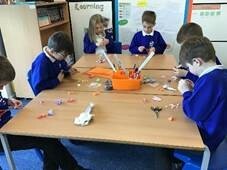 Juniper class have been busy learning about the teeth and tooth decay. 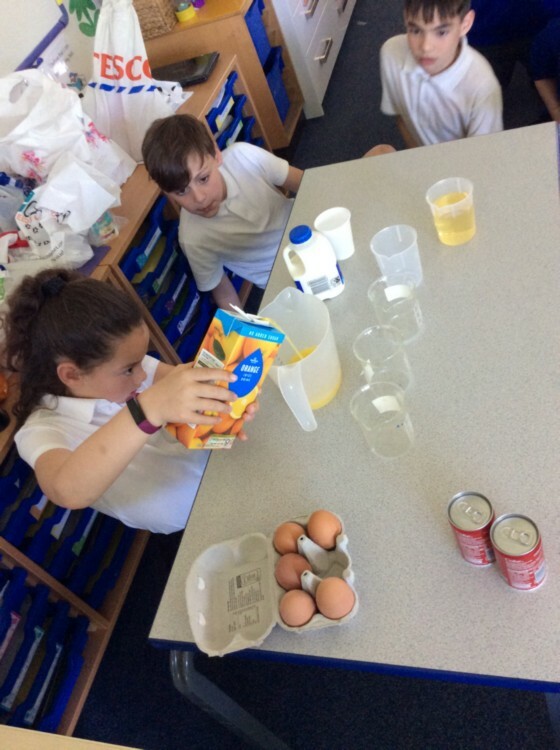 We have started to plan an investigation on how different liquids affect our teeth using boiled eggs. 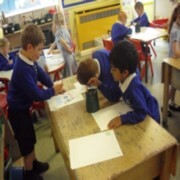 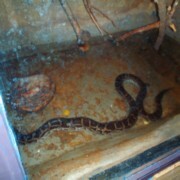 Keep looking on our blog to see our investigation. 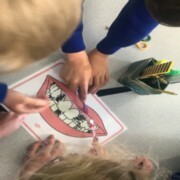 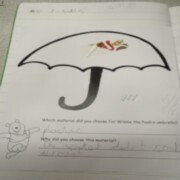 We also looked at the effects food has on our teeth if we do not brush them. 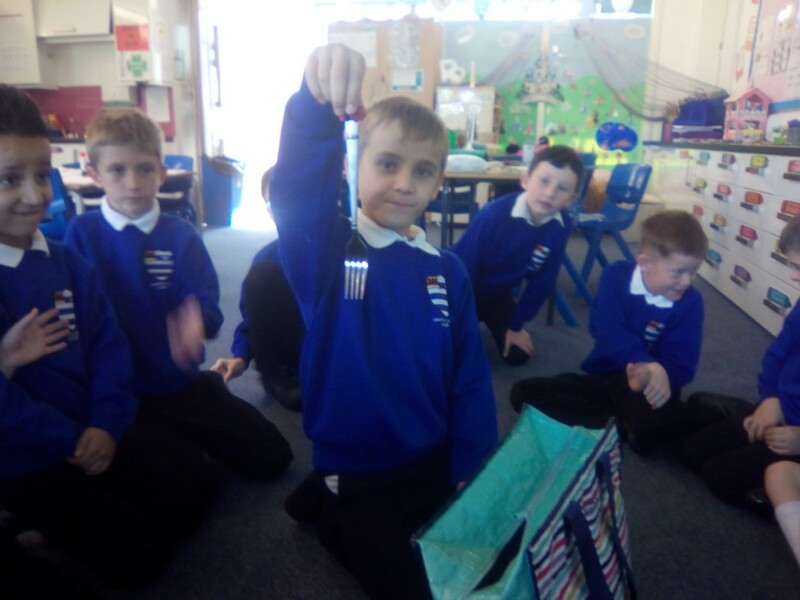 We used toothbrushes to try to remove plaque that had built up on our teeth. 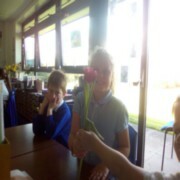 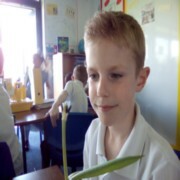 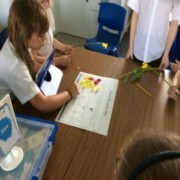 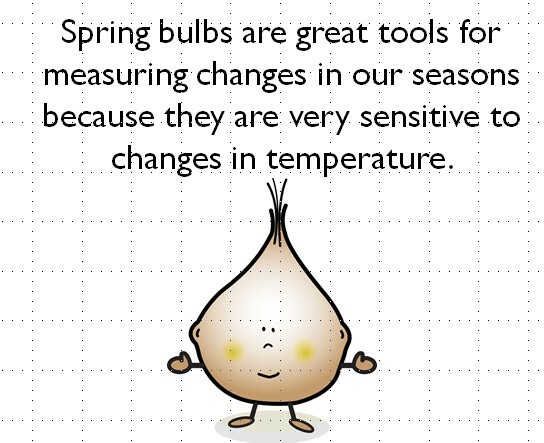 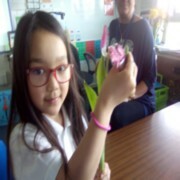 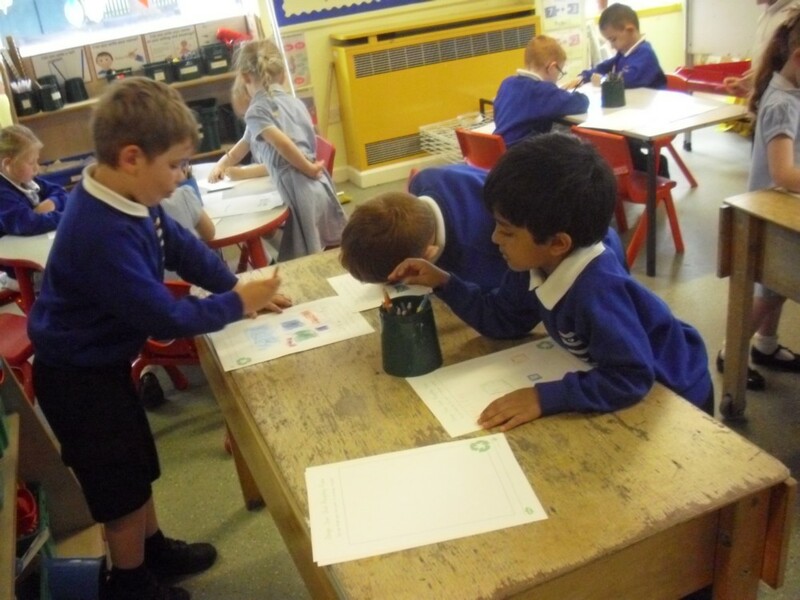 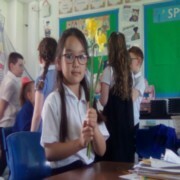 In science lessons we are now learning about plants. 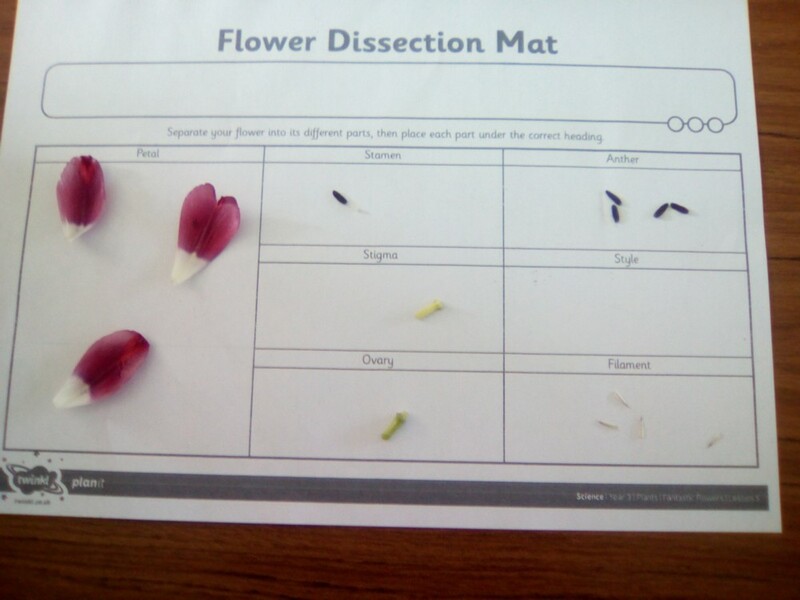 Today we recapped on the different parts of a plant: the flower, the stem, the leaves and the root, and what their role was. 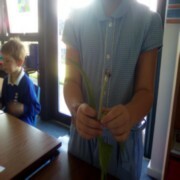 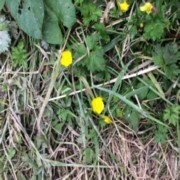 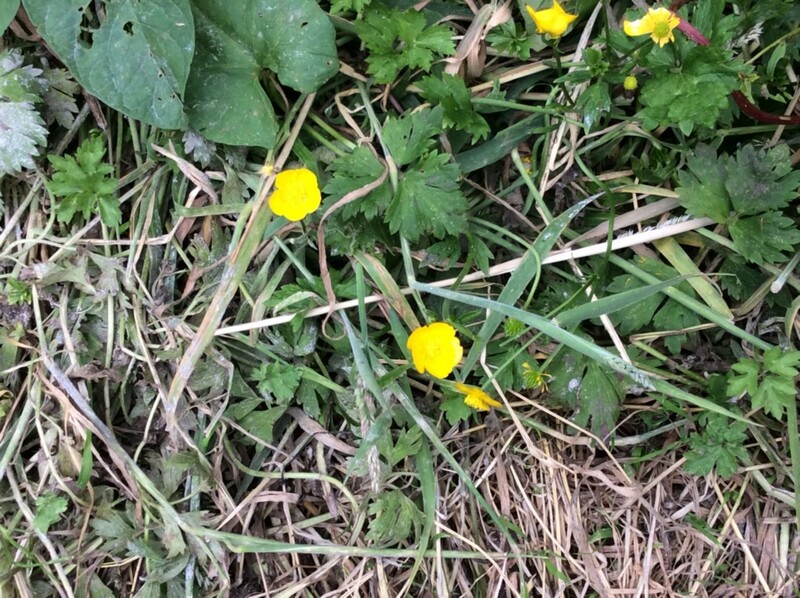 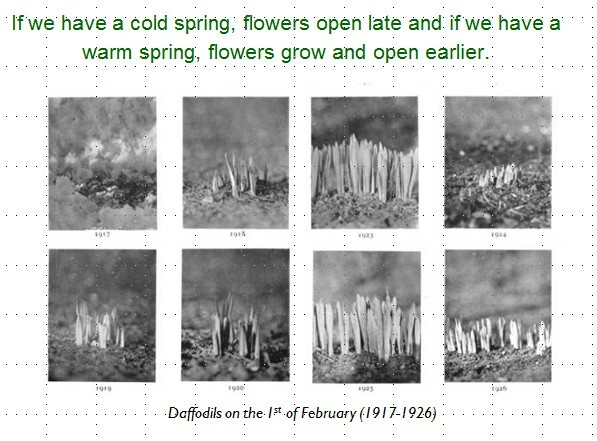 We then went to look more closely at the flowers. 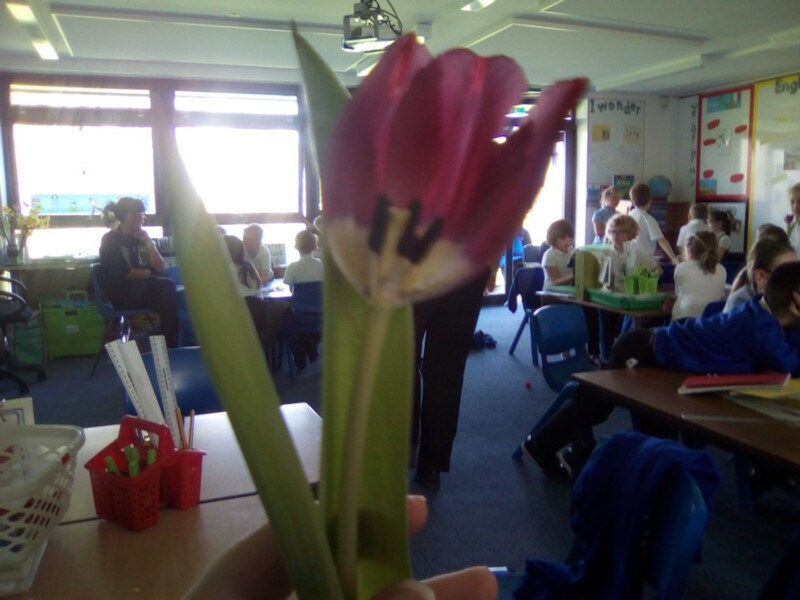 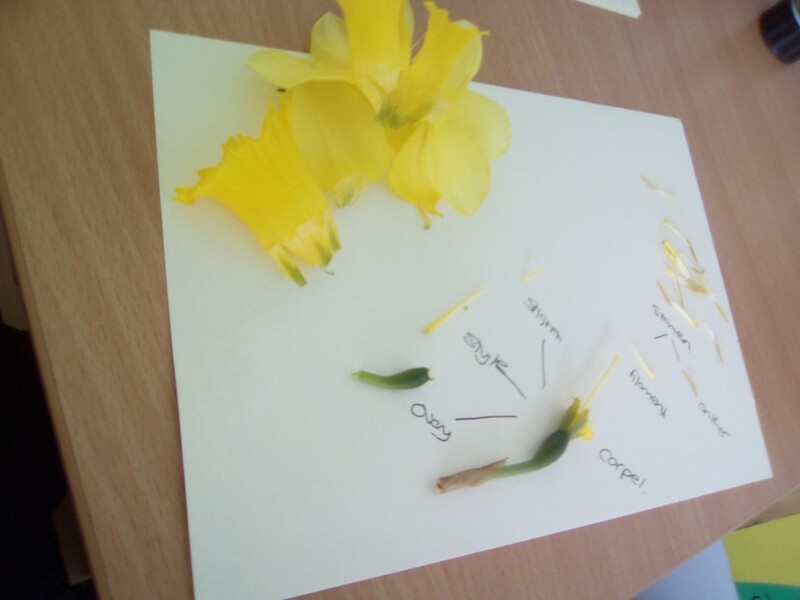 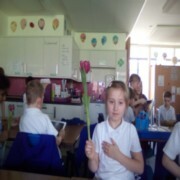 Miss Perrin brought in some daffodils and tulips for us to dissect and identify the different parts. It was really interesting seeing what is beneath the petals. 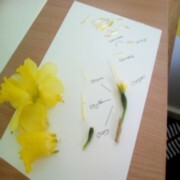 Soon we will learn what the role of these different parts are. 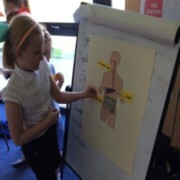 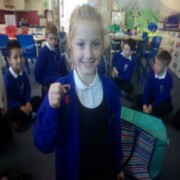 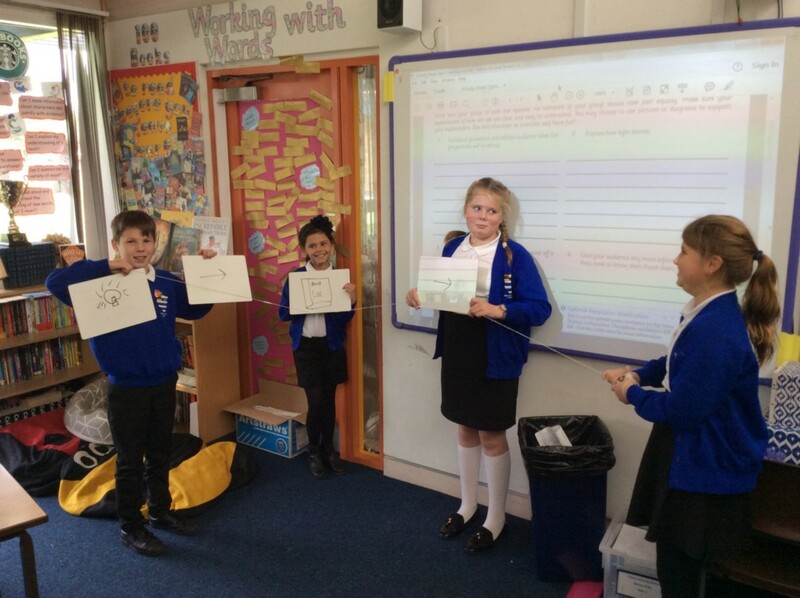 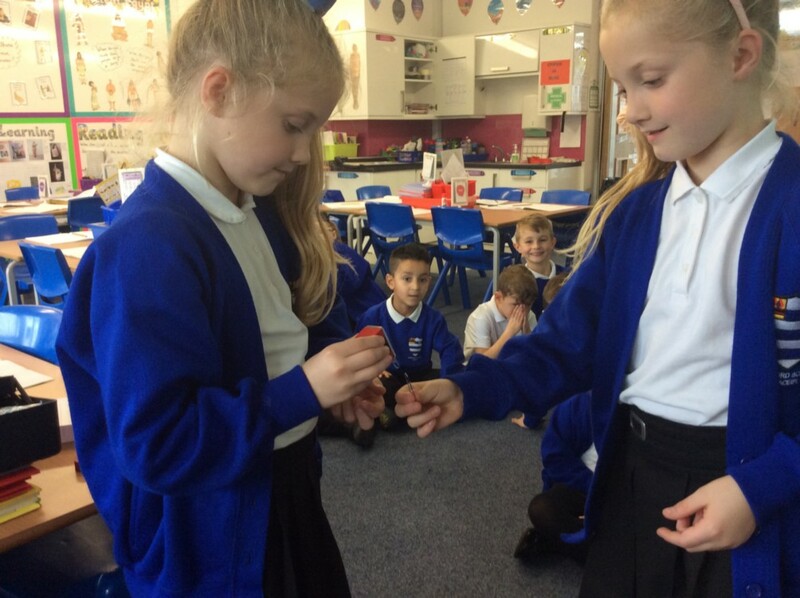 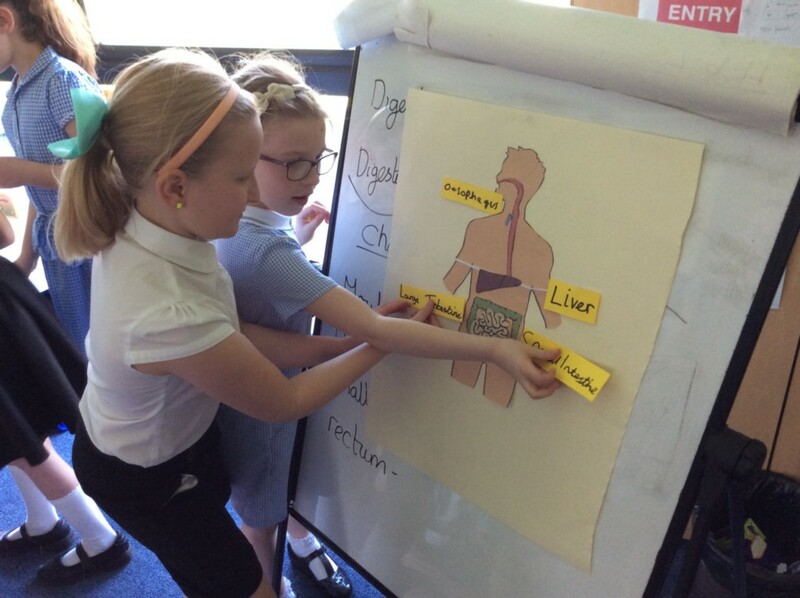 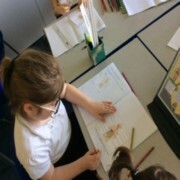 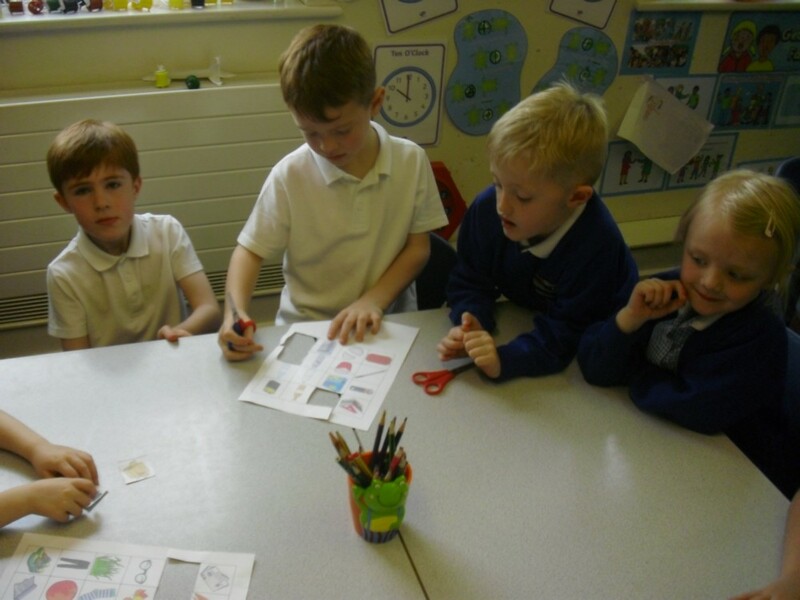 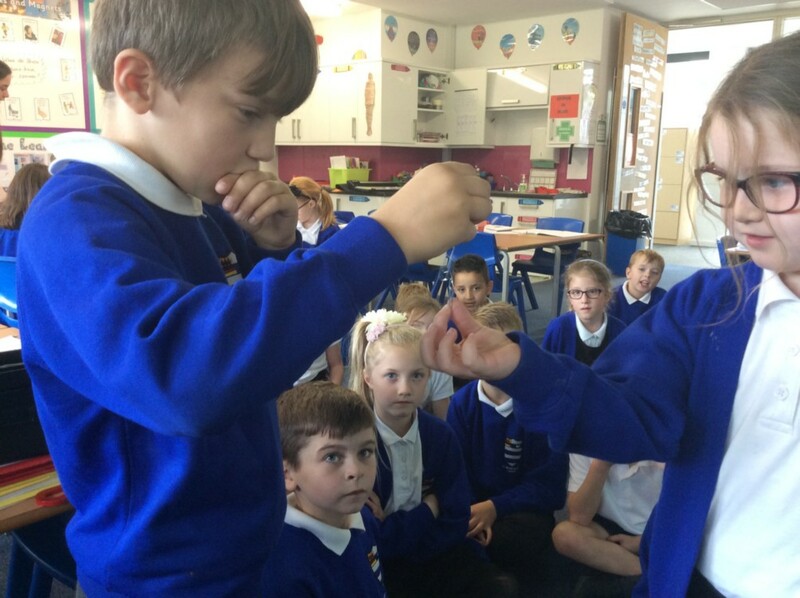 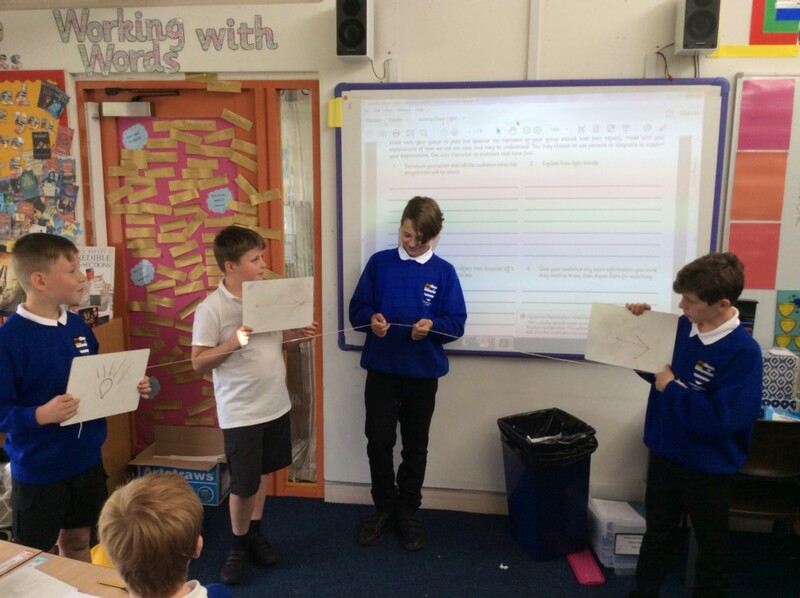 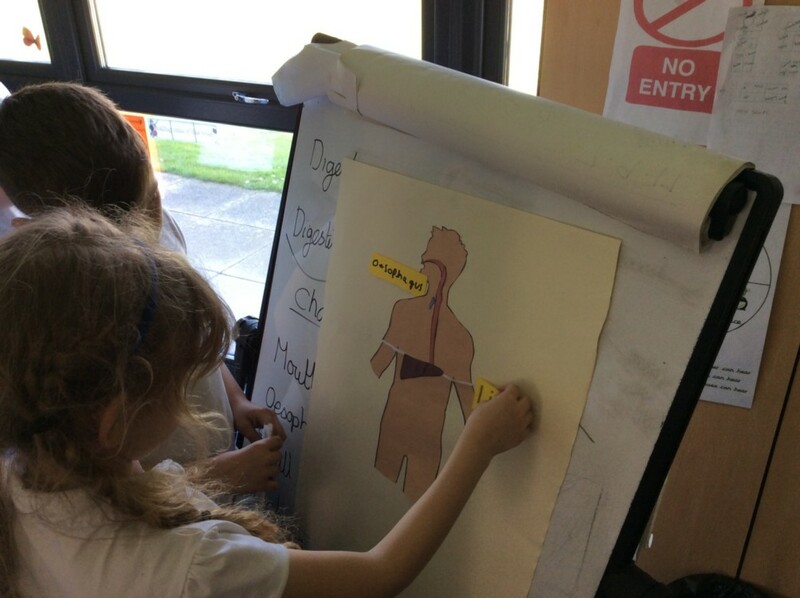 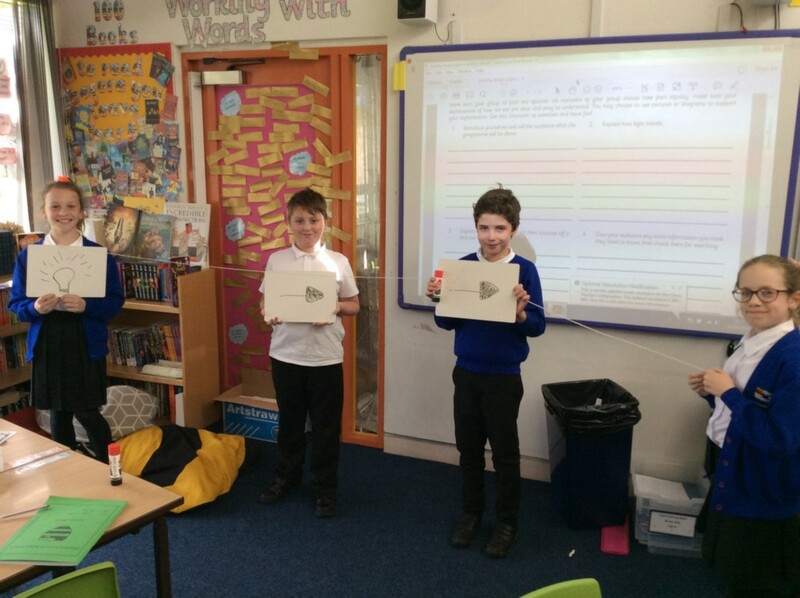 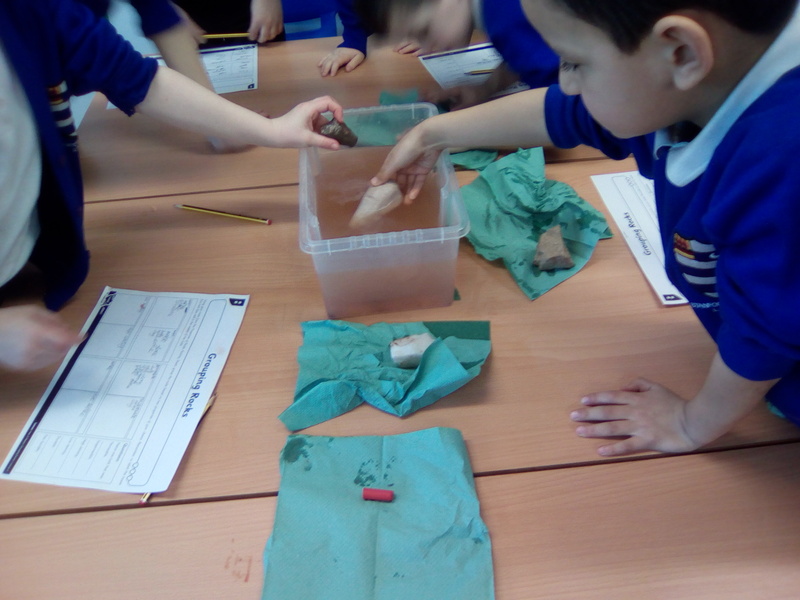 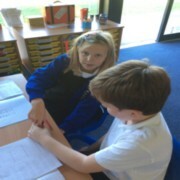 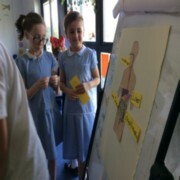 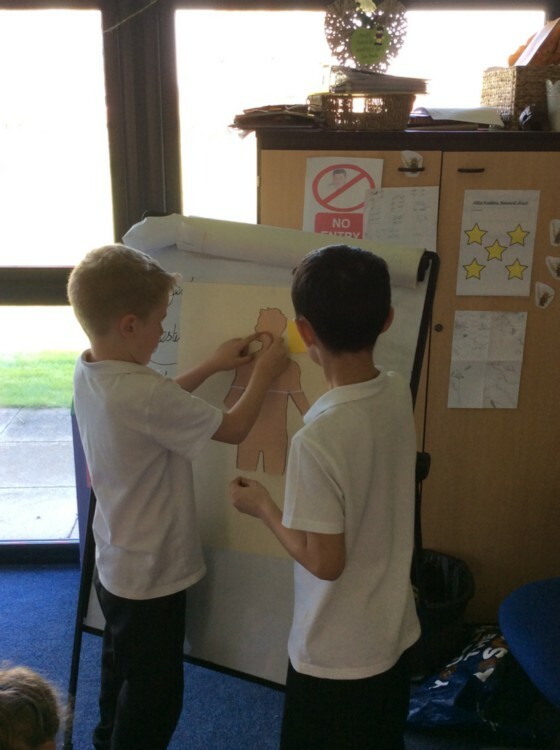 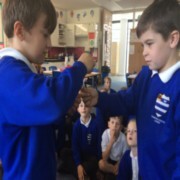 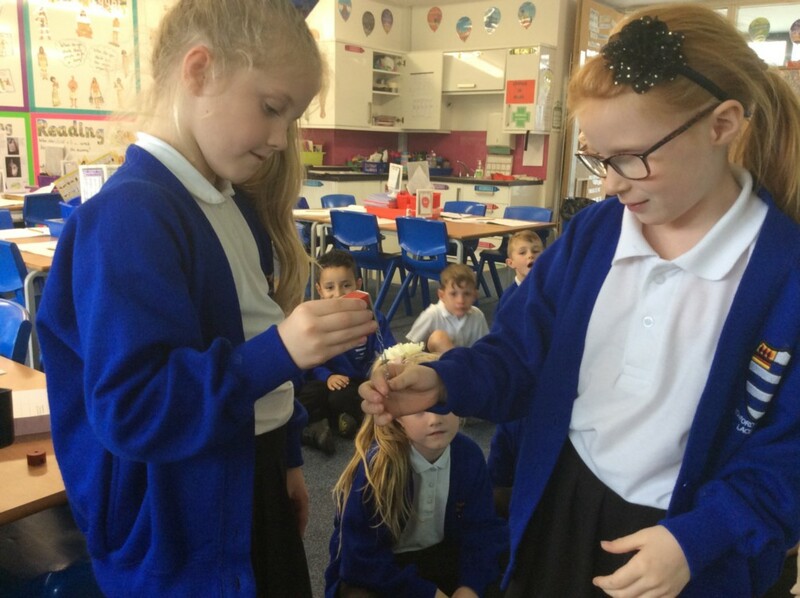 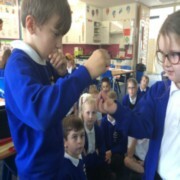 Juniper class were learning about the organs that make up the digestive system and what each organ’s function was. We worked together to then construct the digestive system. 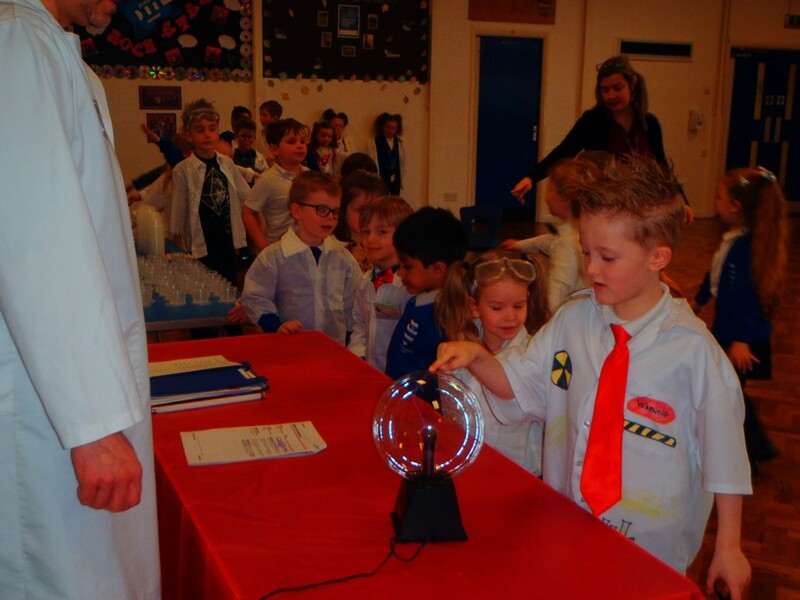 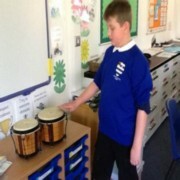 During our science morning this week we investigated Sound. We explored how sounds are made because of vibrations. 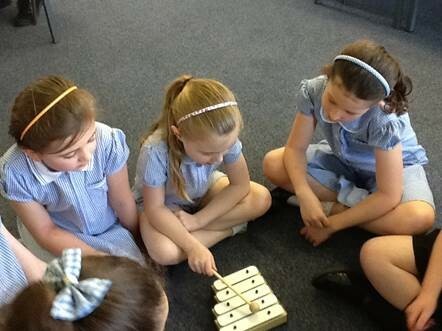 We learnt that on a glockenspiel the smaller notes have a higher pitch. We explored that the amount of water in the glass affects the sound. 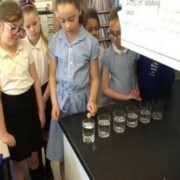 The more water the lower the note. When we twanged elastic bands we noticed that the more stretched the band the higher the note. 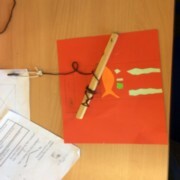 We connected this to the viola that we are learning in school.